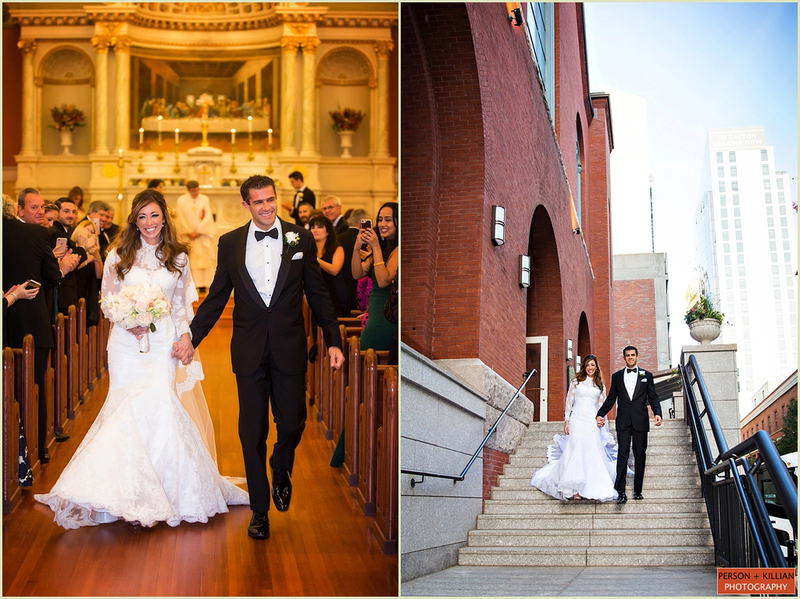 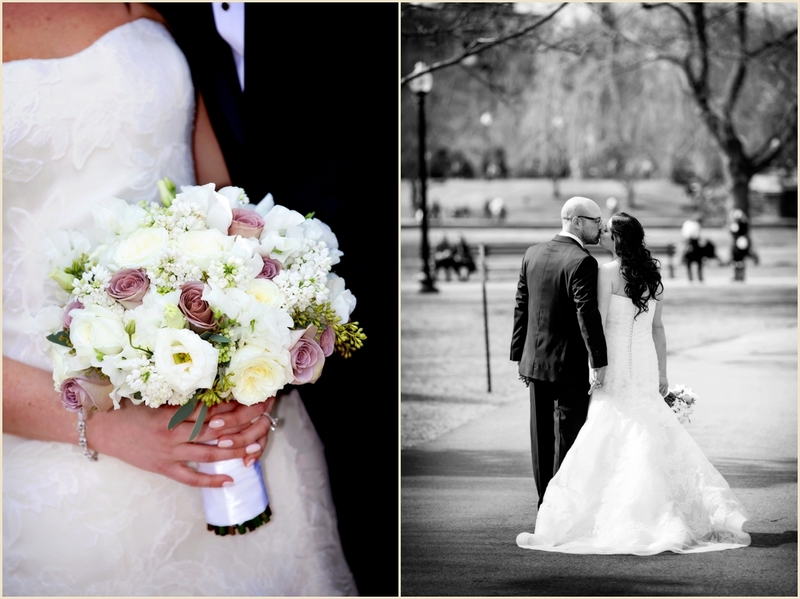 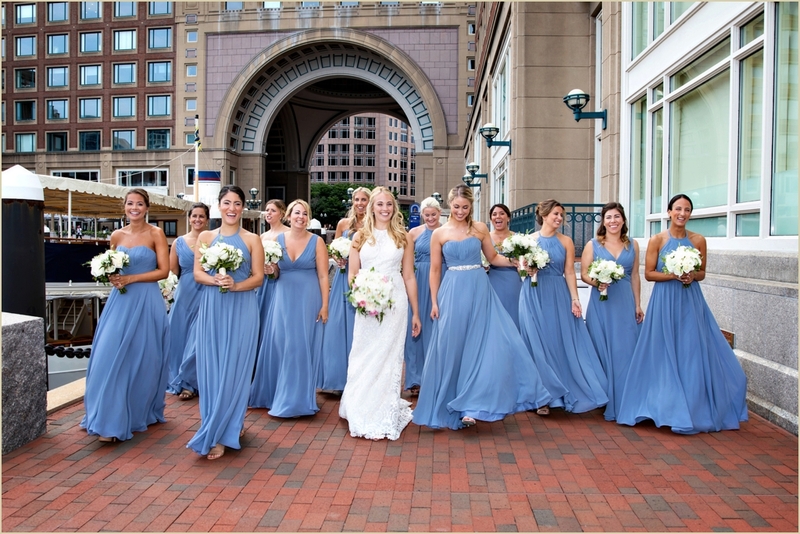 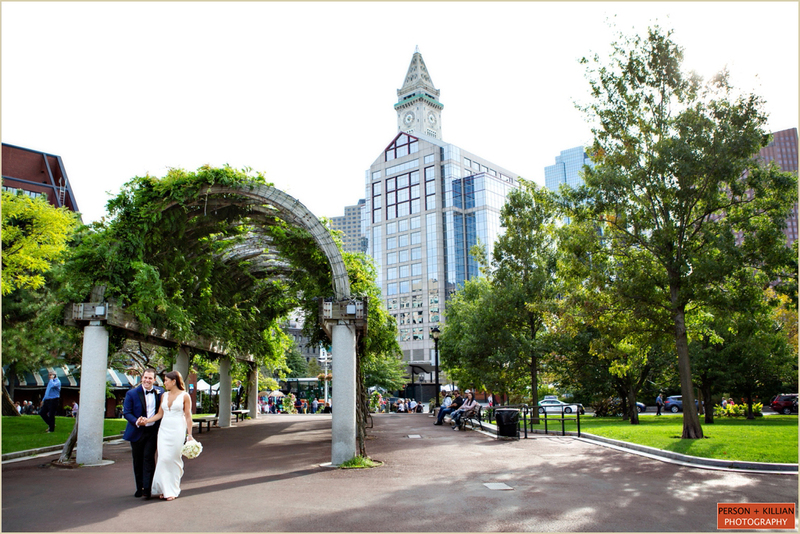 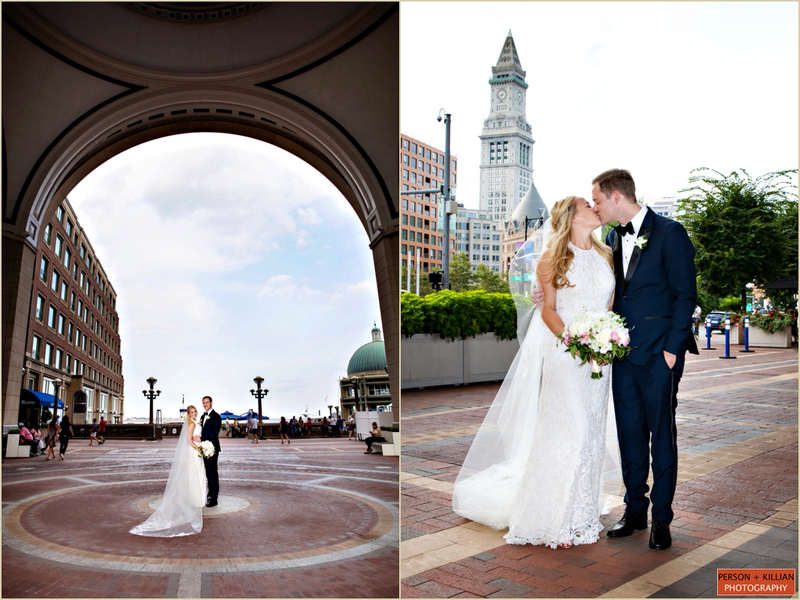 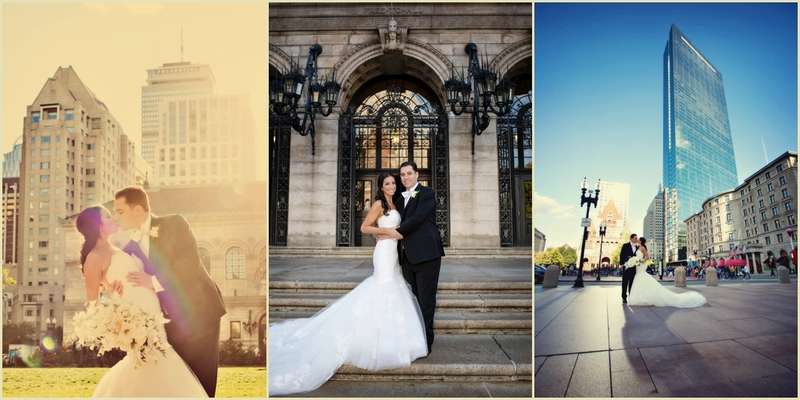 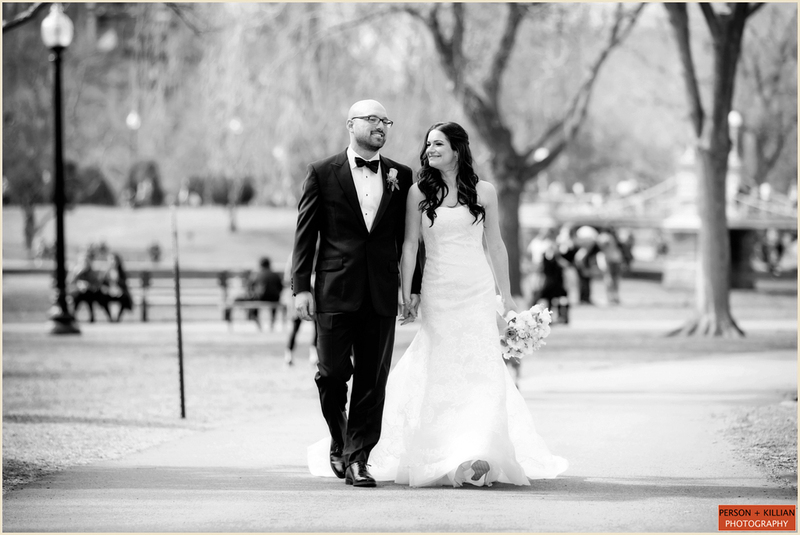 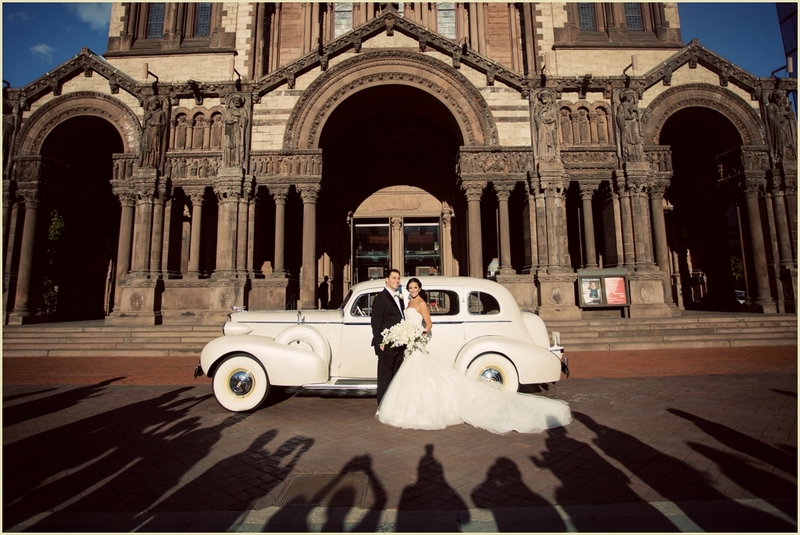 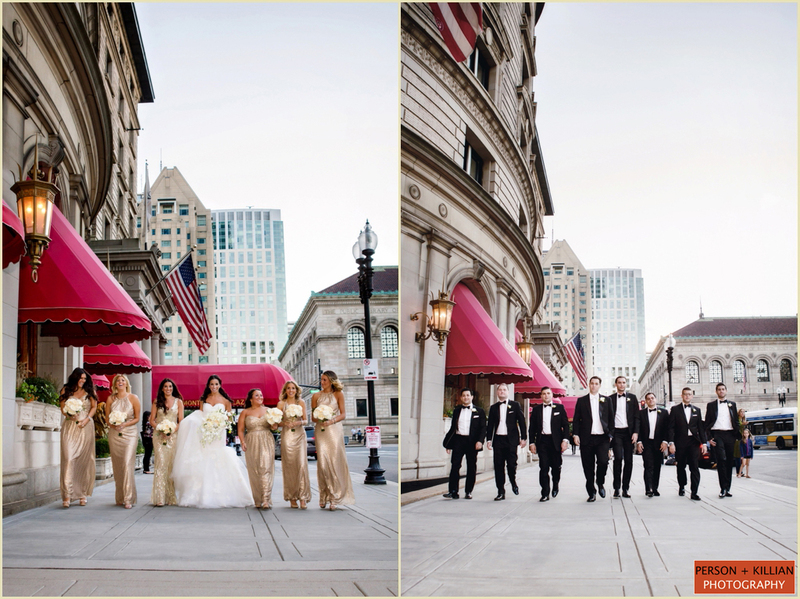 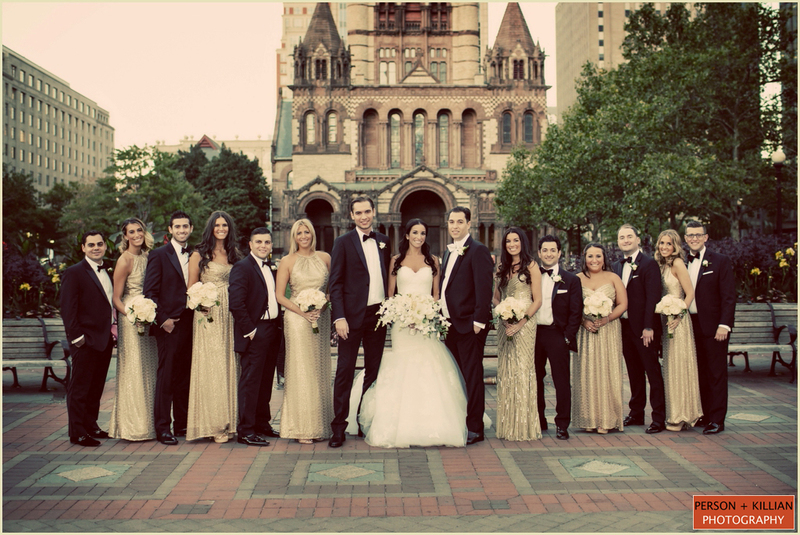 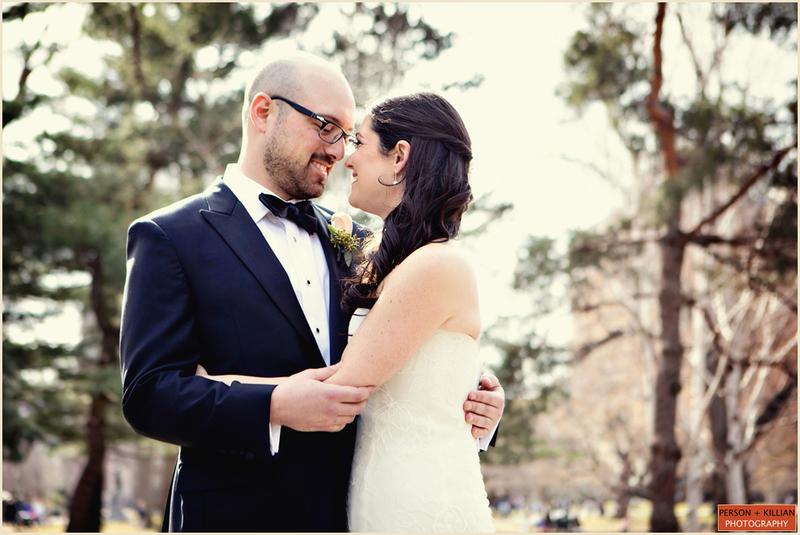 Maritza and Matt celebrated their beautiful spring Boston Public Library wedding right in the heart of Copley Square. 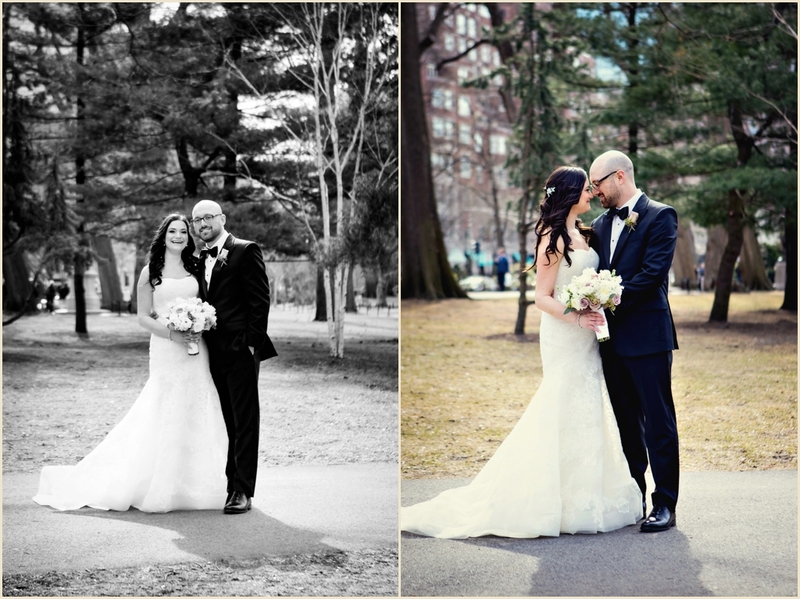 From their first look in the Boston Public Garden to the church wedding ceremony to the evening reception, this bride and groom didn’t have to travel more than a few blocks to get everything they wanted for their spring wedding. 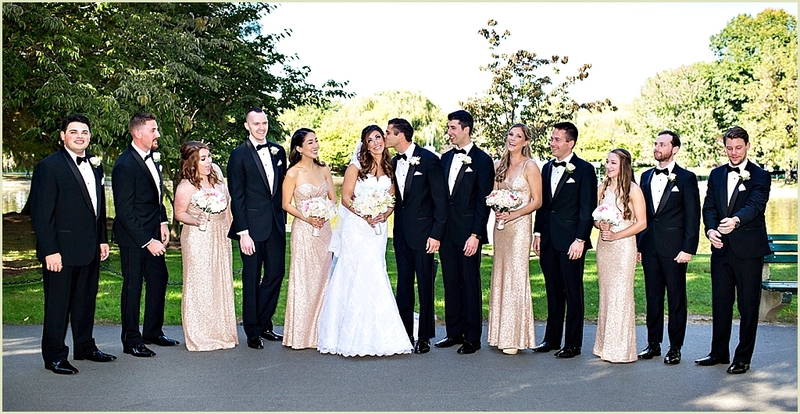 Maritza and her bridal party started their day at Maritza’s parent’s home. 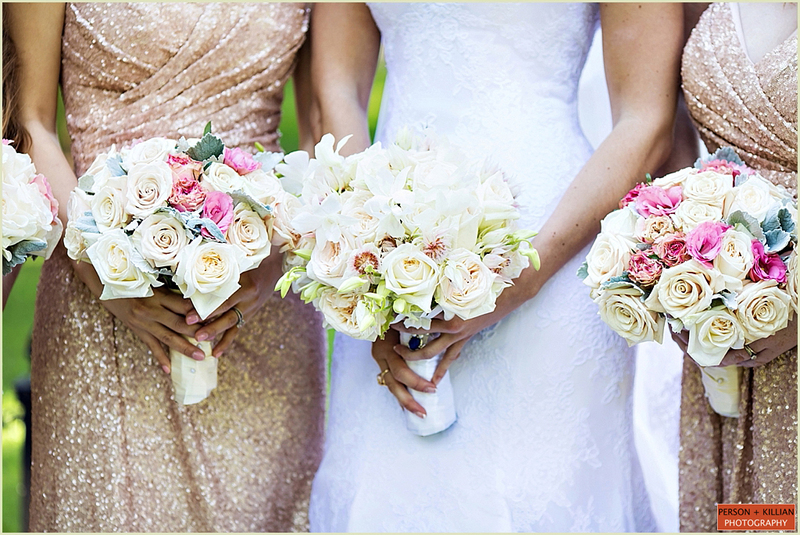 The bride wore an elegant strapless gown with a sheer lace top, while her bridesmaids donned classic black dresses with a special pale champagne dress for the maid of honor. 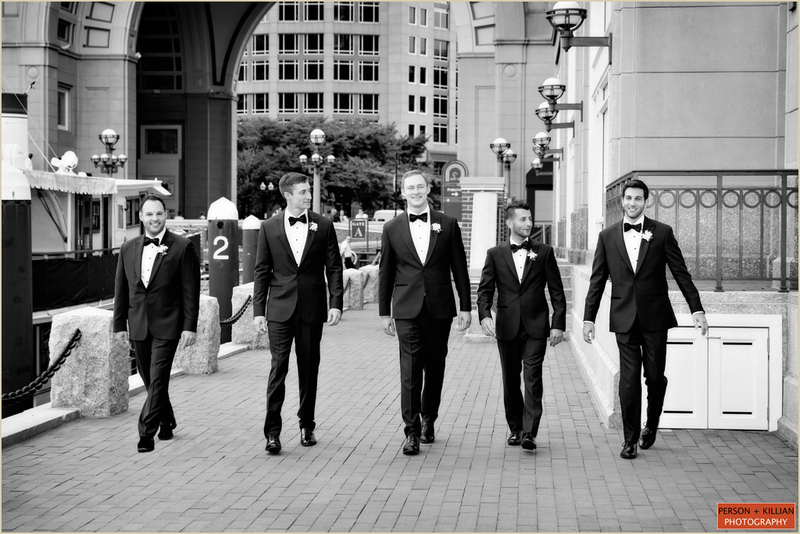 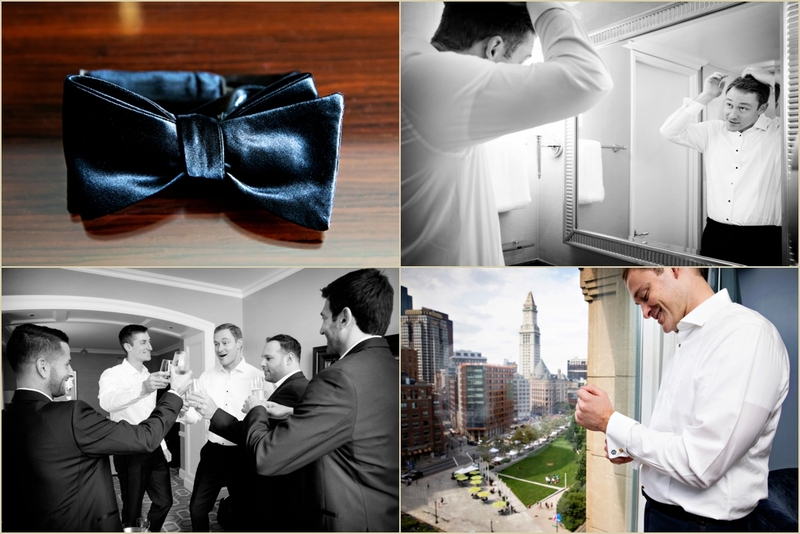 Matt and his groomsmen spent their morning at the couple’s house in Boston, just a short walk away from downtown. 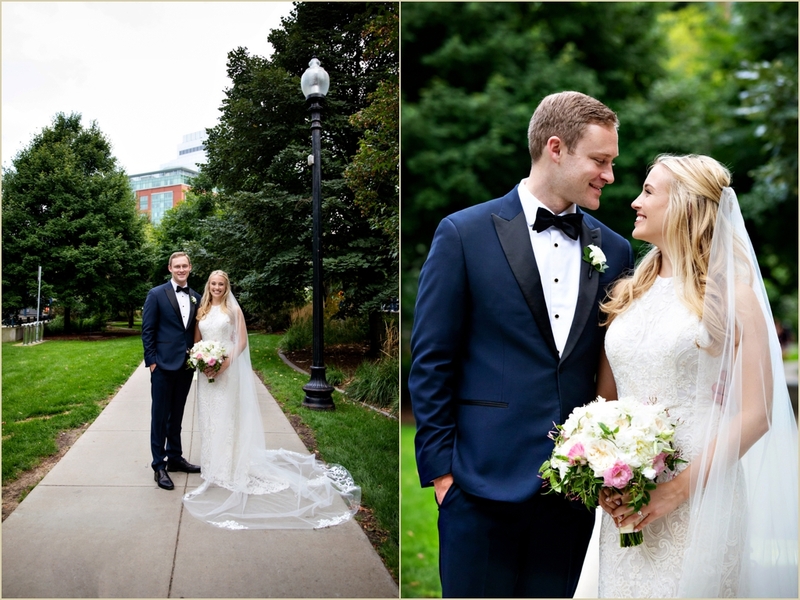 The bride and groom met in the Boston Public Garden for their first look, and we stayed outside for formal photos with the couple and with their wedding party. 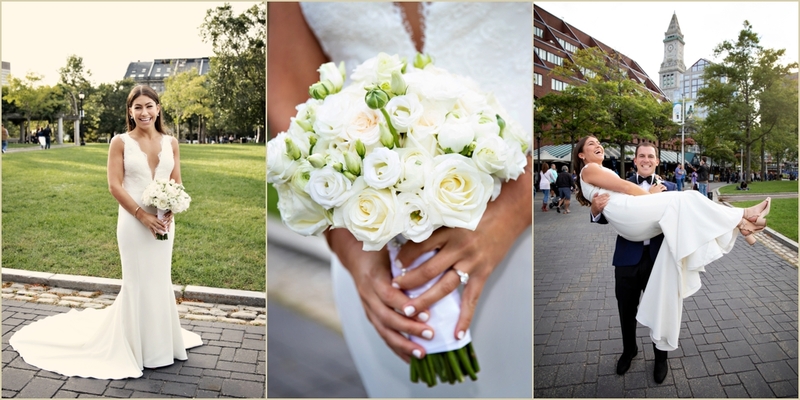 We loved Maritza’s bright and colorful bouquet, arranged with a mix of purple and white flowers — a wonderful pop of color to contrast with her white wedding gown. 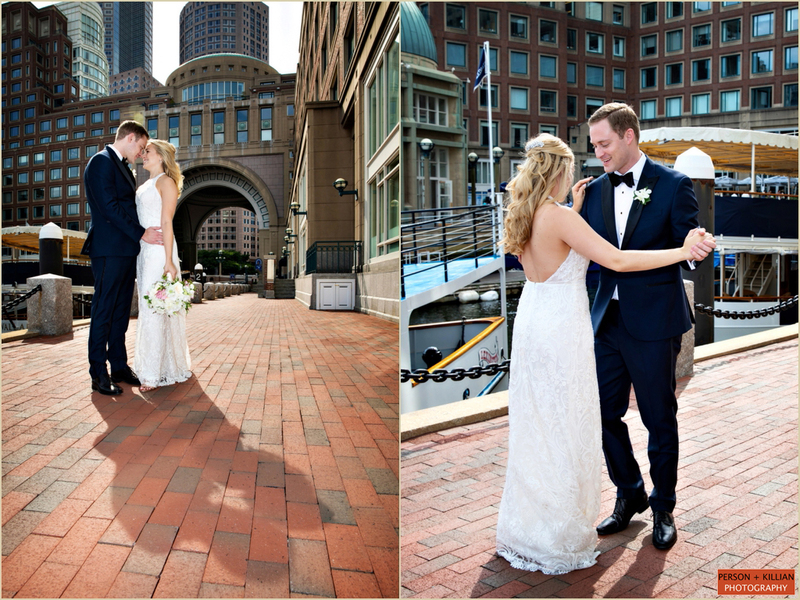 We made a stop at the Boston Public Library for a few more formal photos with Maritza and Matt before it was time for the ceremony. 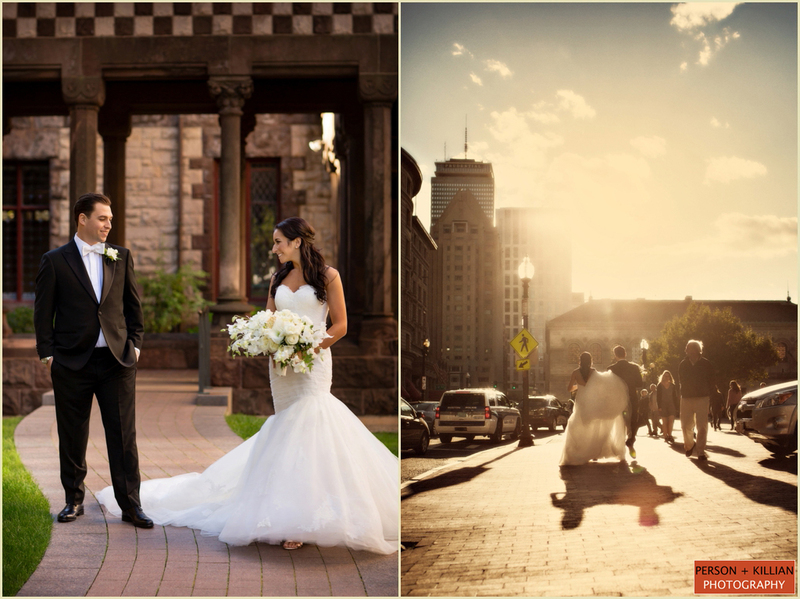 It was a quick walk the Old South Church, which is right across the street from the Boston Public Library in Copley Square. 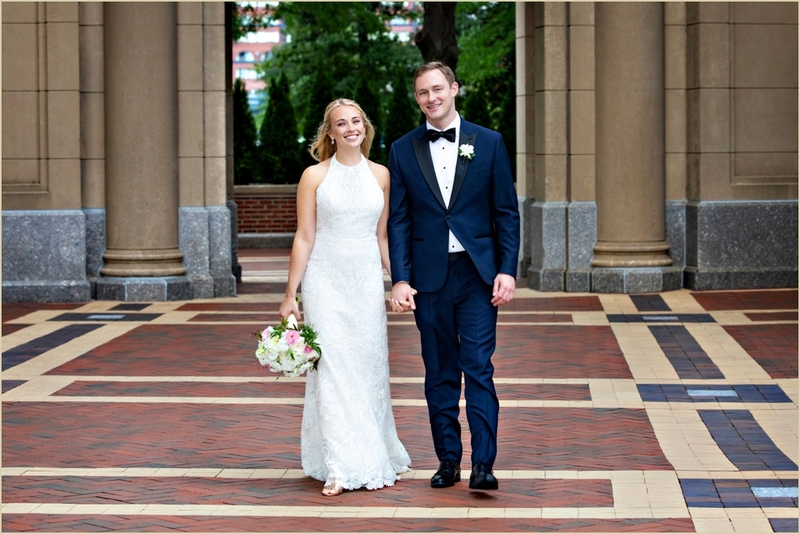 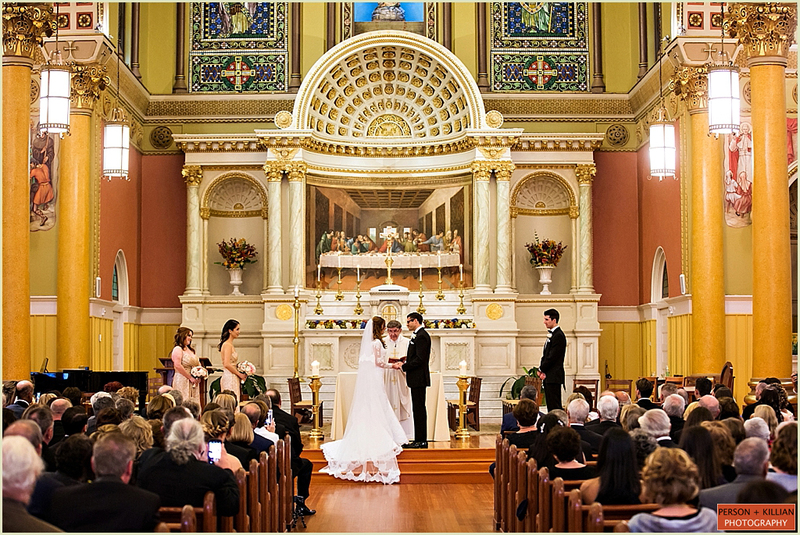 The couple said their I do’s in a traditional Episcopalian wedding ceremony, in one of Boston’s oldest and most iconic historic churches. 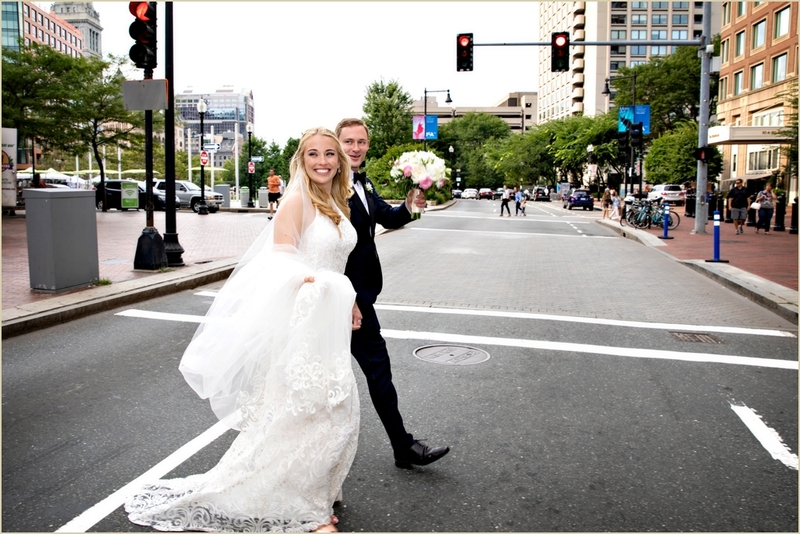 The newlyweds greeted their guests in a receiving line after the ceremony, and we made the short walk across the street back to the Boston Public Library to start the celebration. 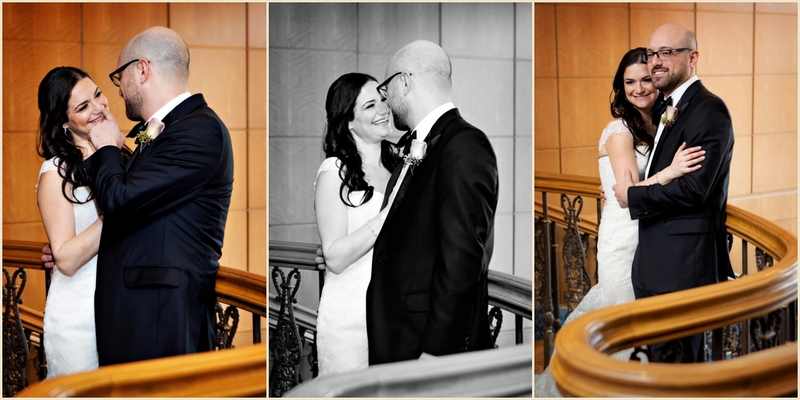 While guests enjoyed cocktails in the Boston Public Library’s Guastavino Room, we took Maritza and Matt around the venue for a few more formal photos before the reception began. 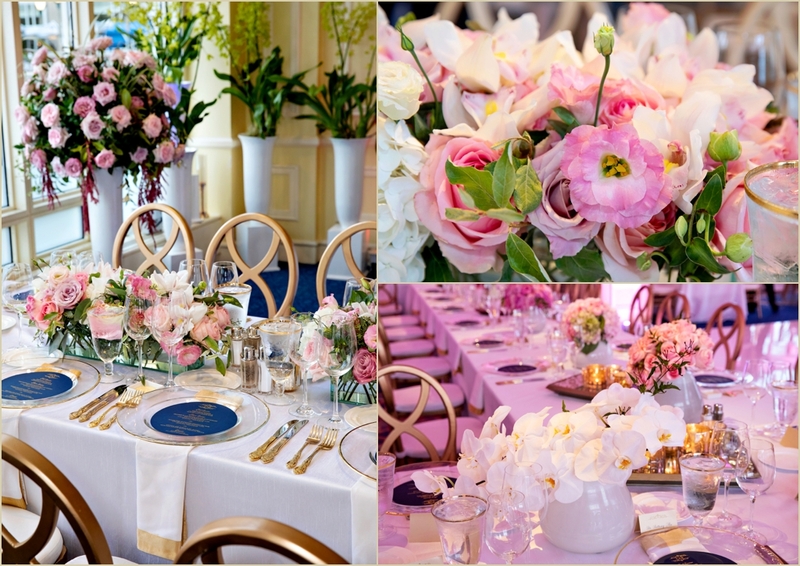 Bates Hall was transformed for dinner, with gorgeous rose bouquets full of spring colors on every table. 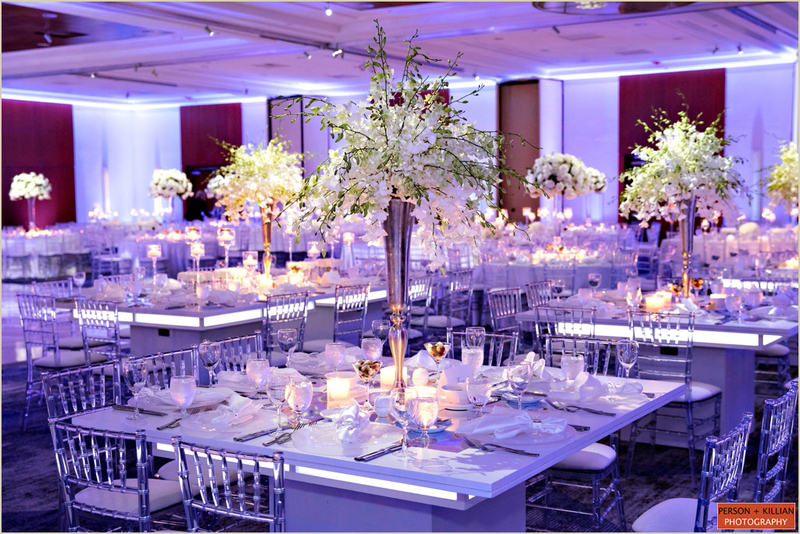 Red, yellow, pink, purple and classic white flowers filled the room, with simple white runners and linens to compliment the wooden tables. 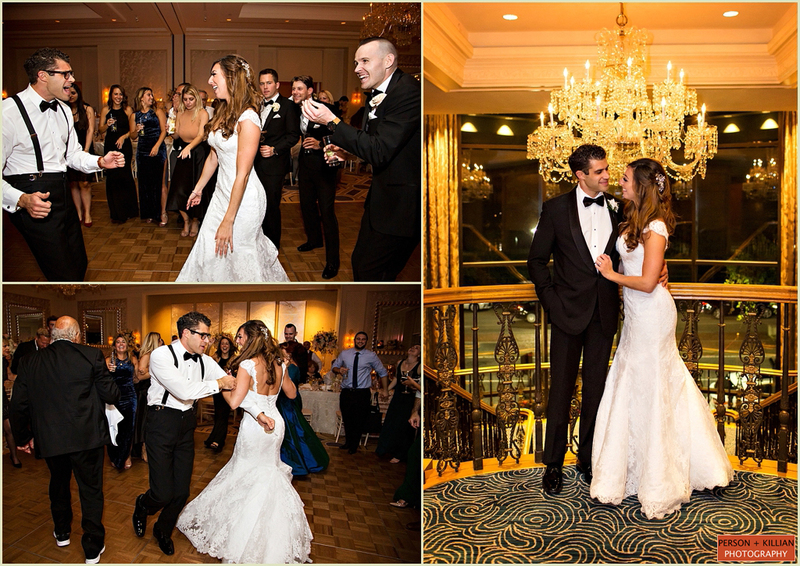 Before guests were invited into Bates Hall for dinner, they enjoyed a traditional Armenian line dance and welcome toast in the Abbey Room. 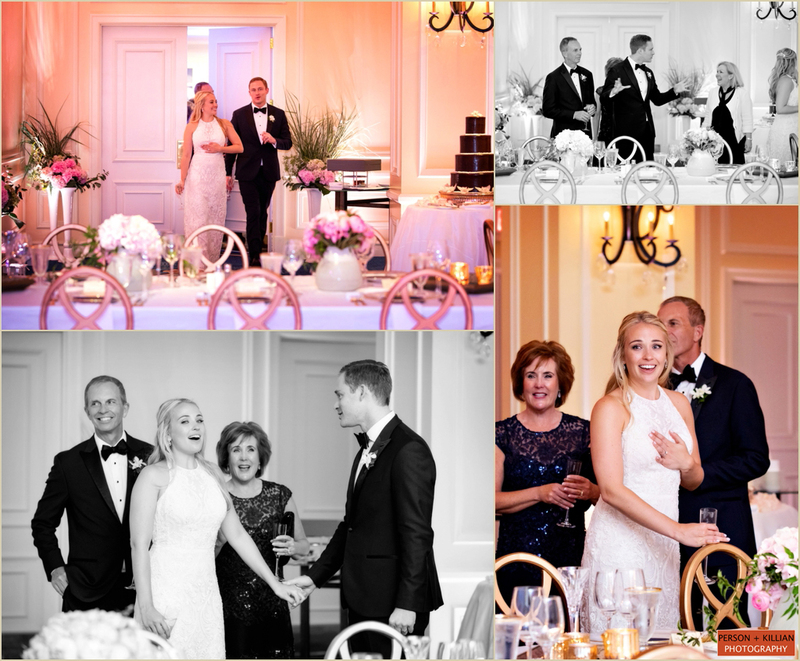 After dinner it was back to the Abbey Room for more dancing, desserts, and a night of celebration with the happy newlyweds. 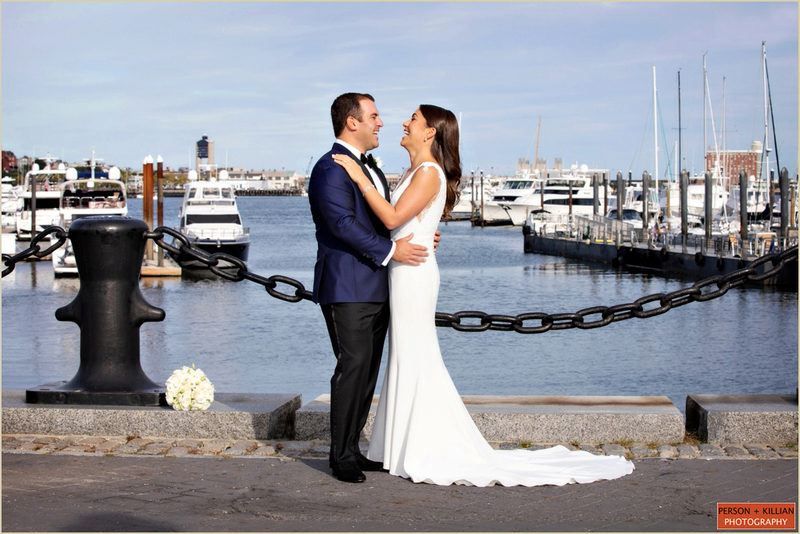 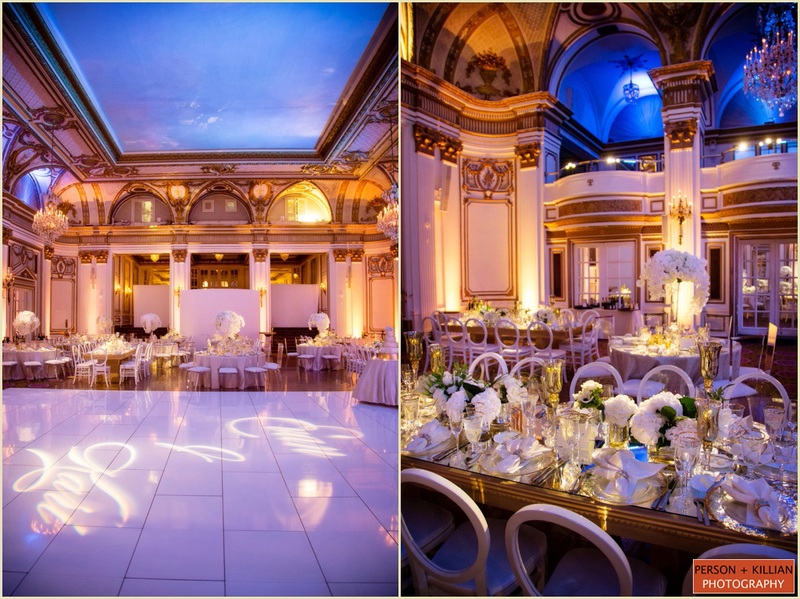 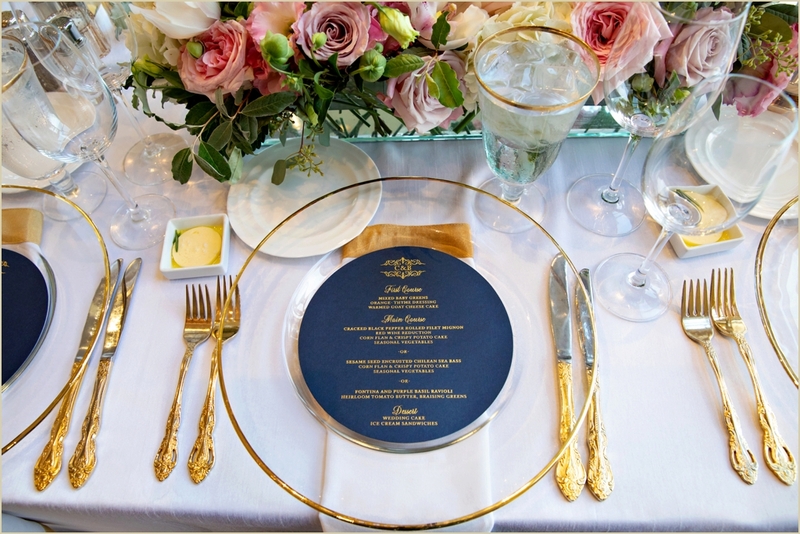 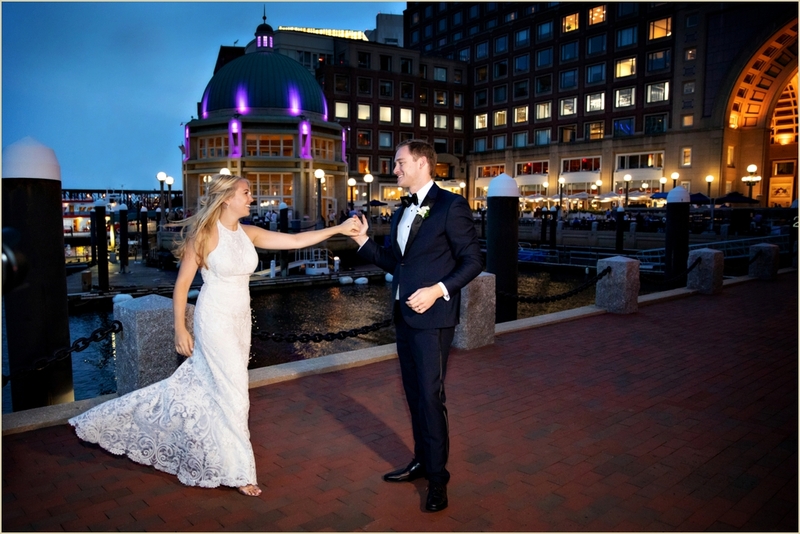 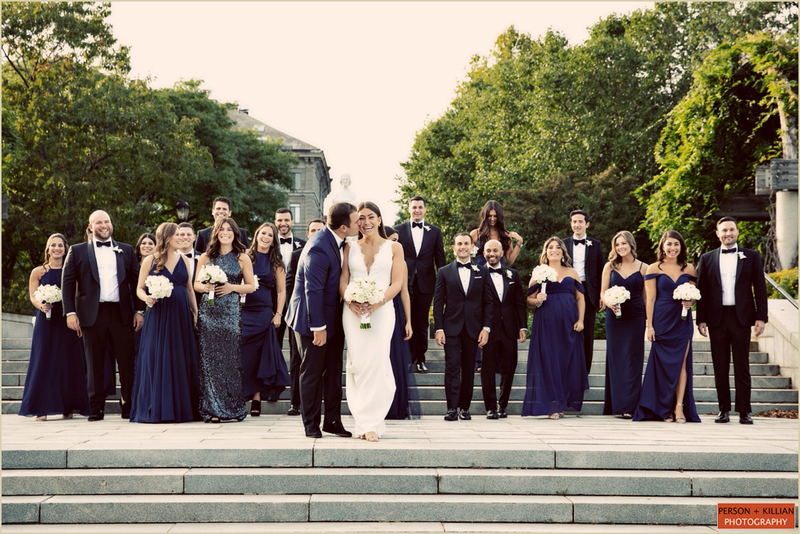 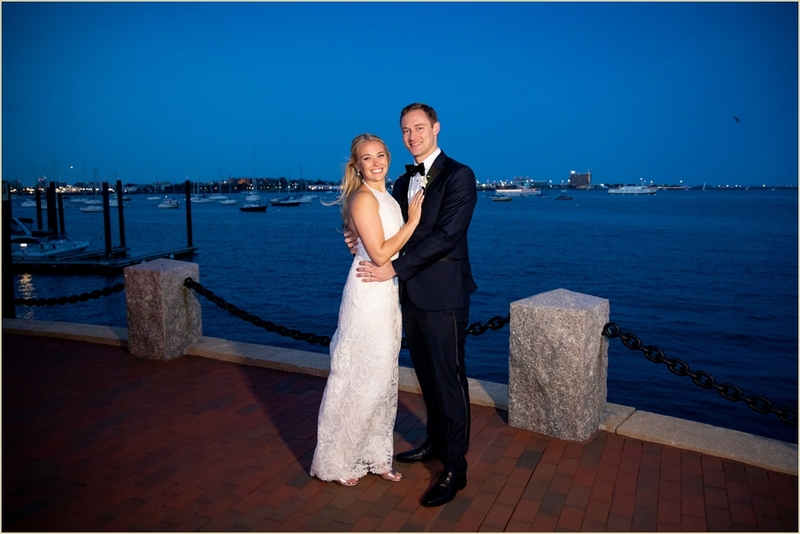 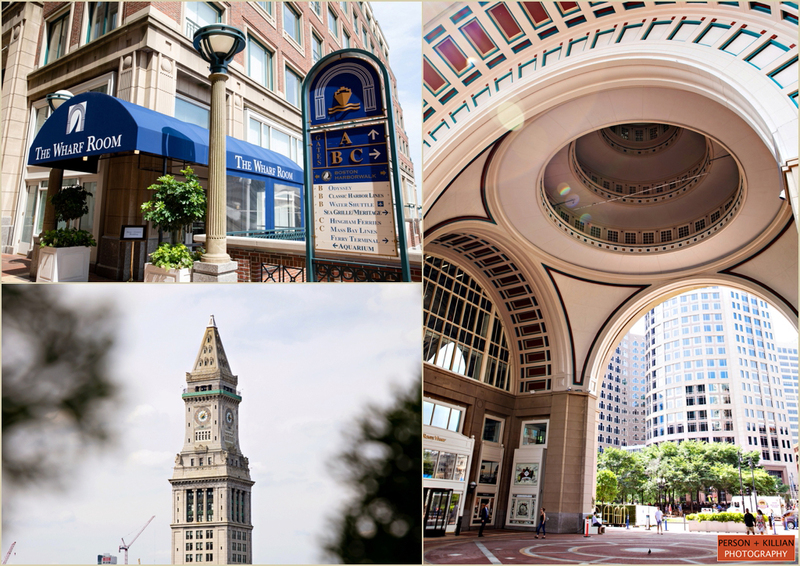 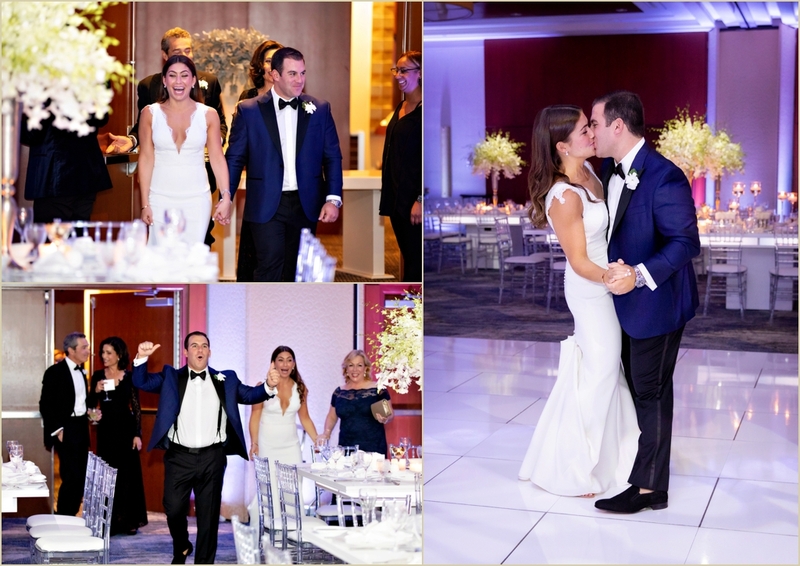 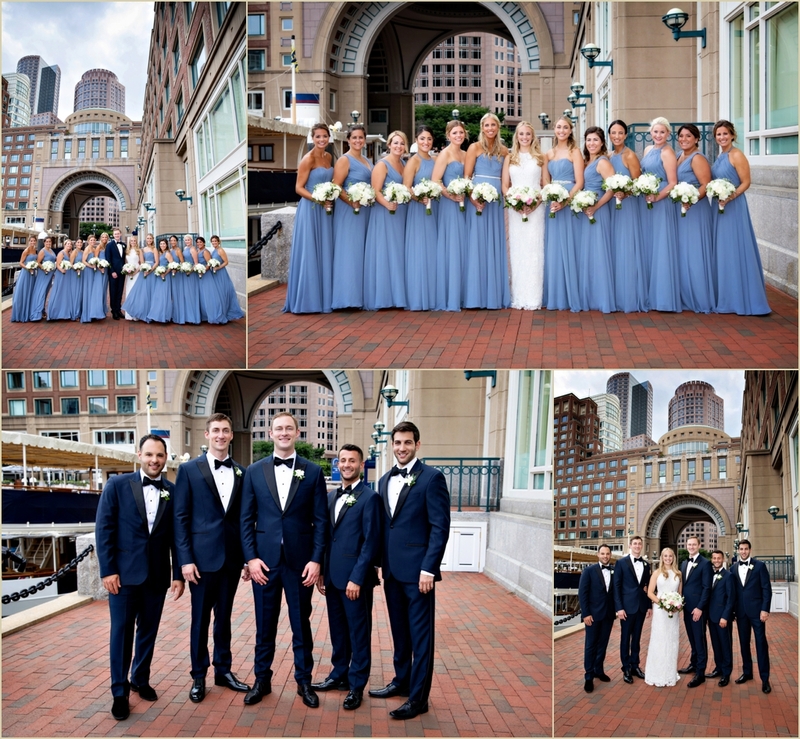 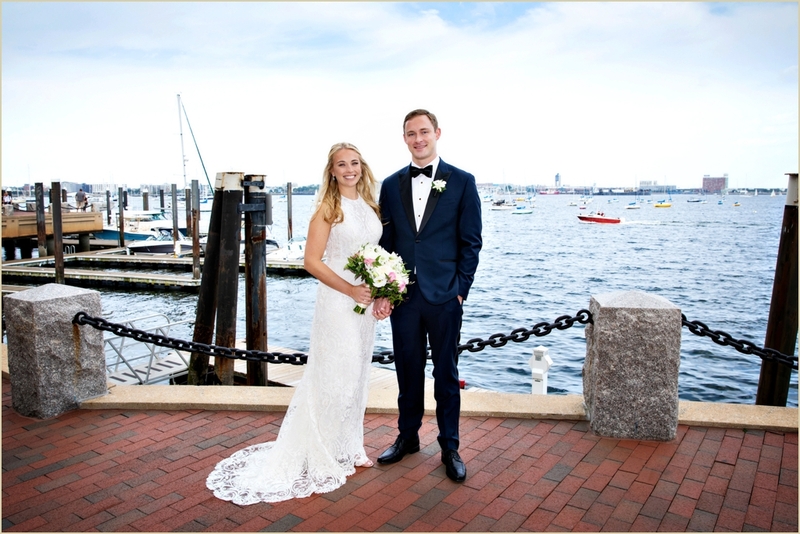 Special thanks to Maritza and Matt for including us in your spring Boston Public Library wedding day, and to the entire team at the Catered Affair and Jodi Raphael Events for a gorgeous evening! 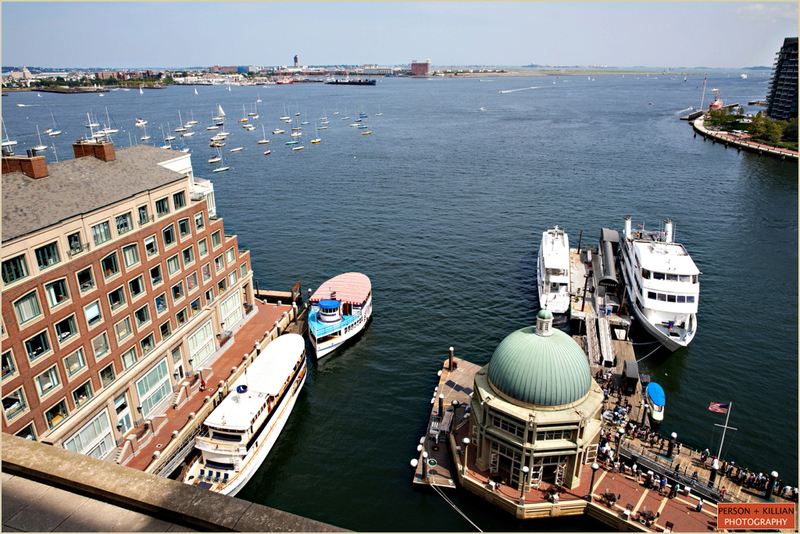 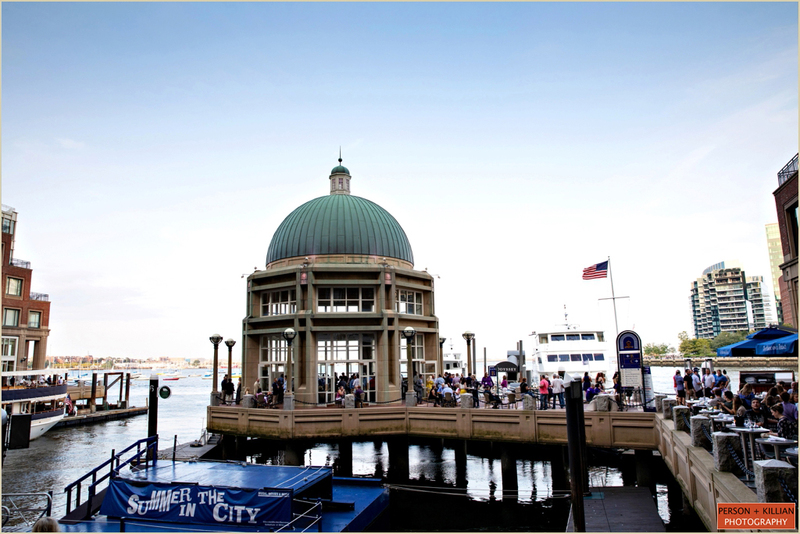 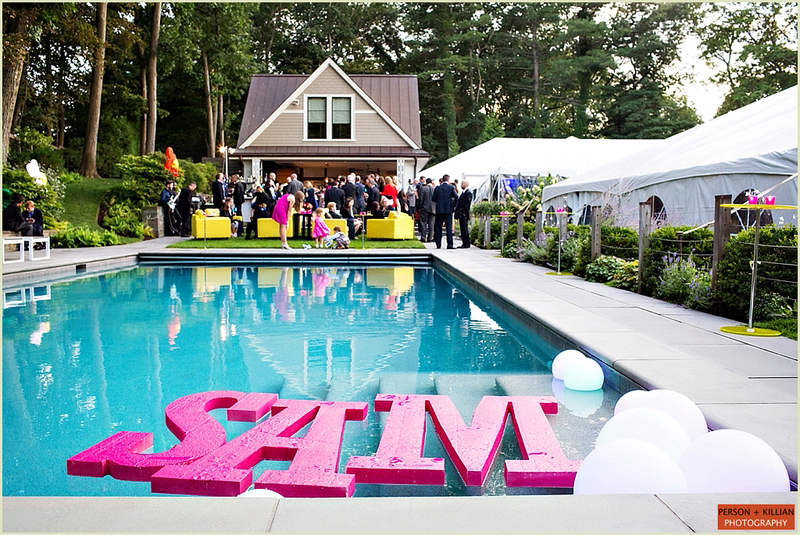 This month’s warm winter heat wave has us dreaming of summer — even if it doesn’t last very long! 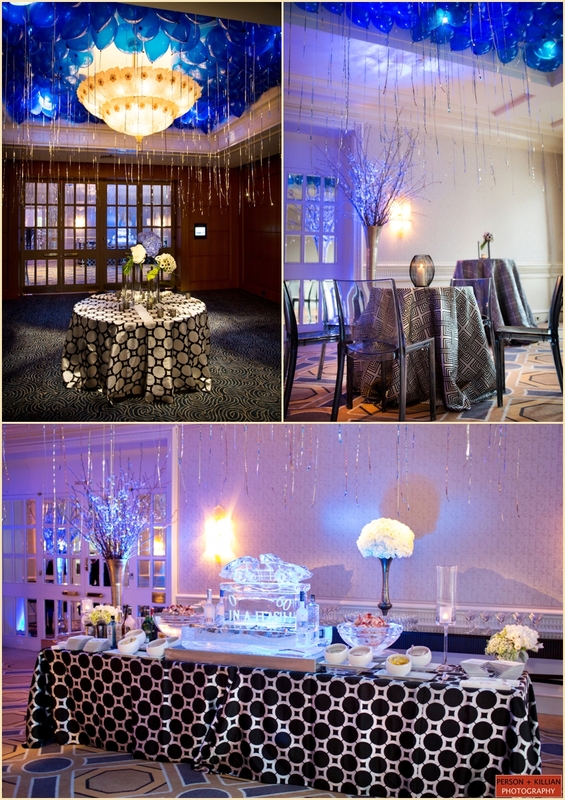 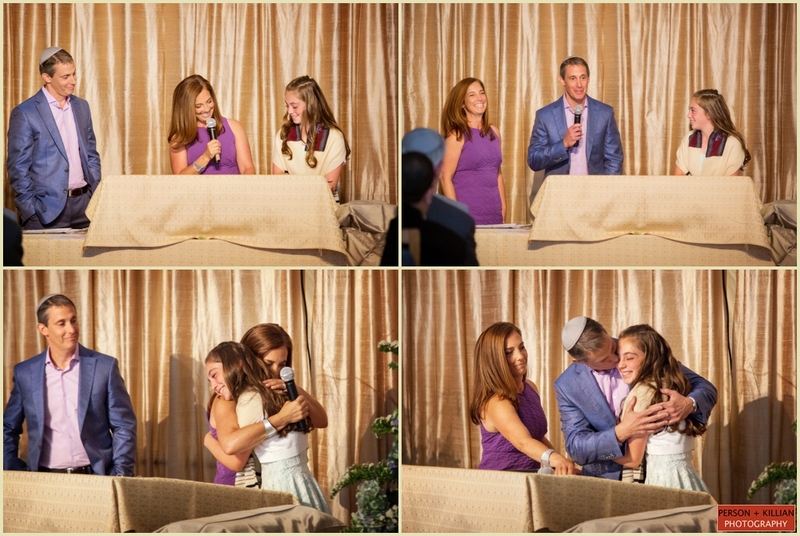 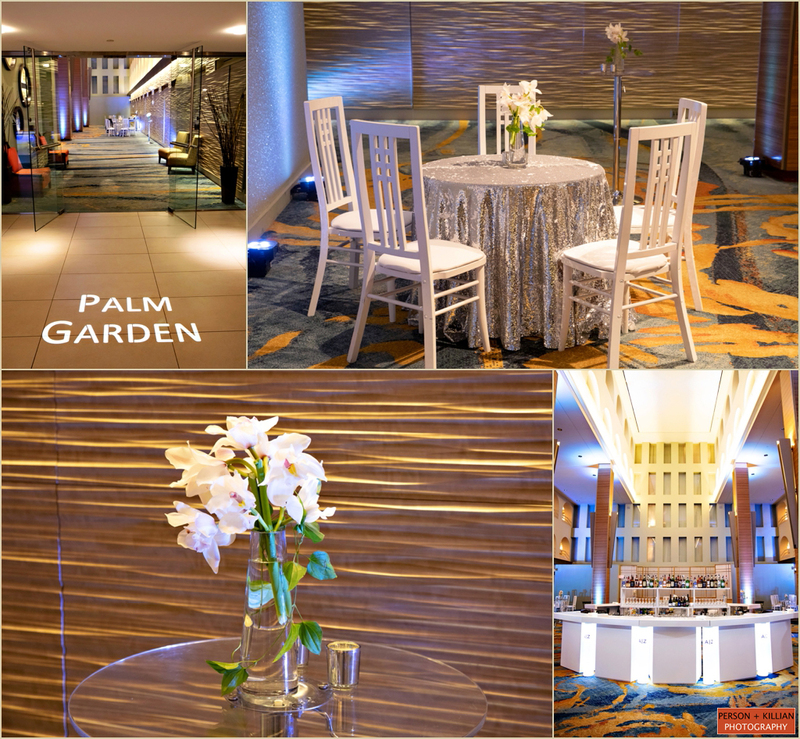 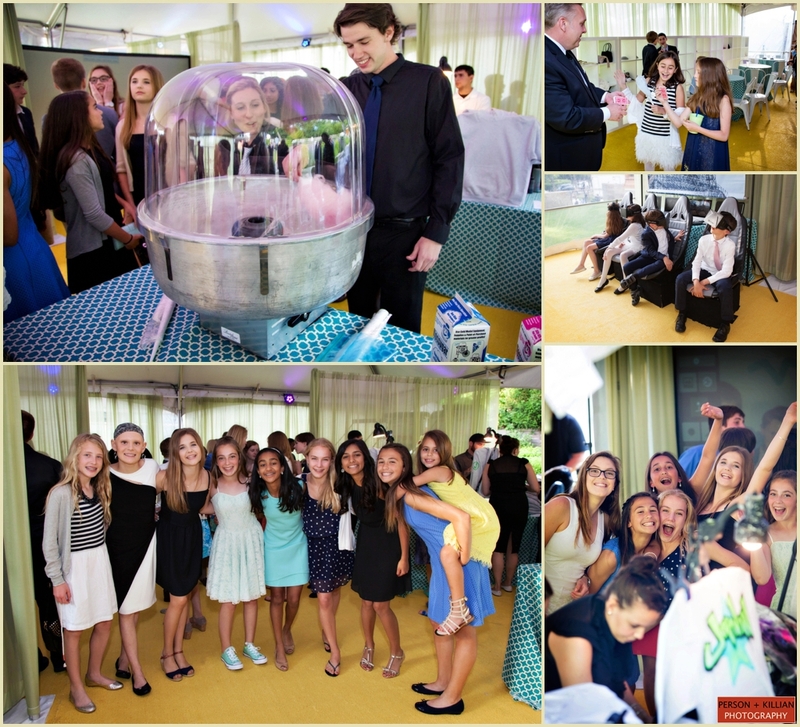 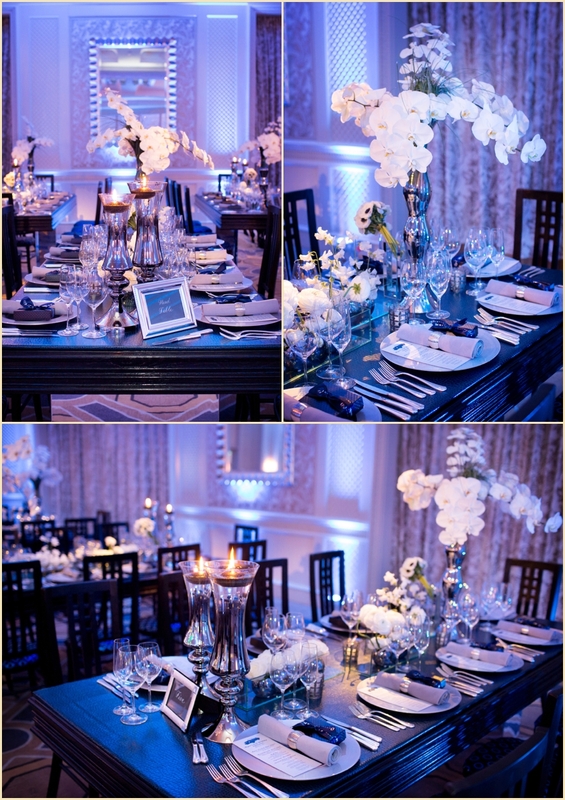 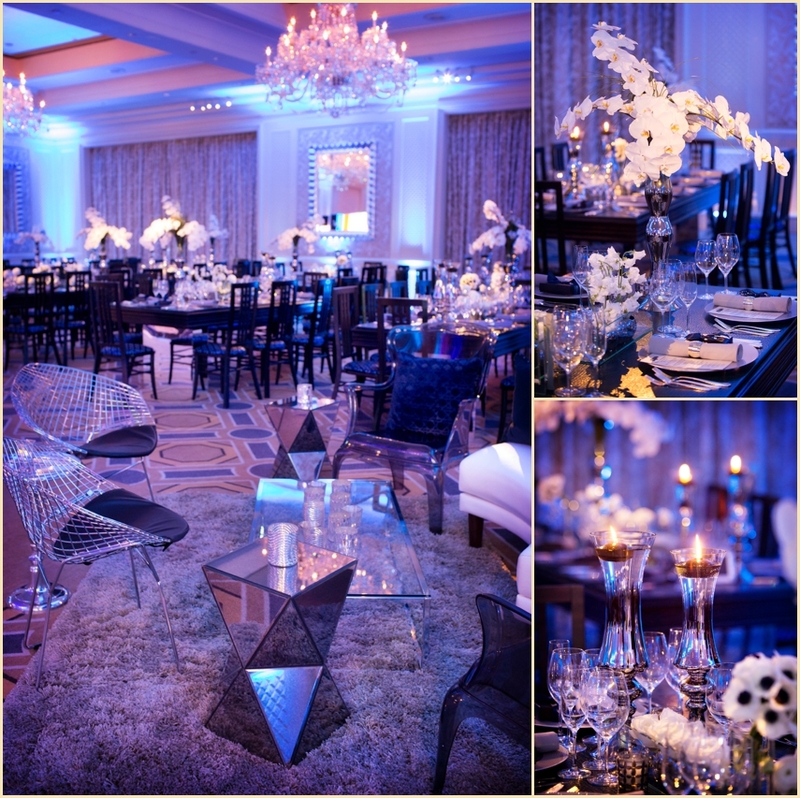 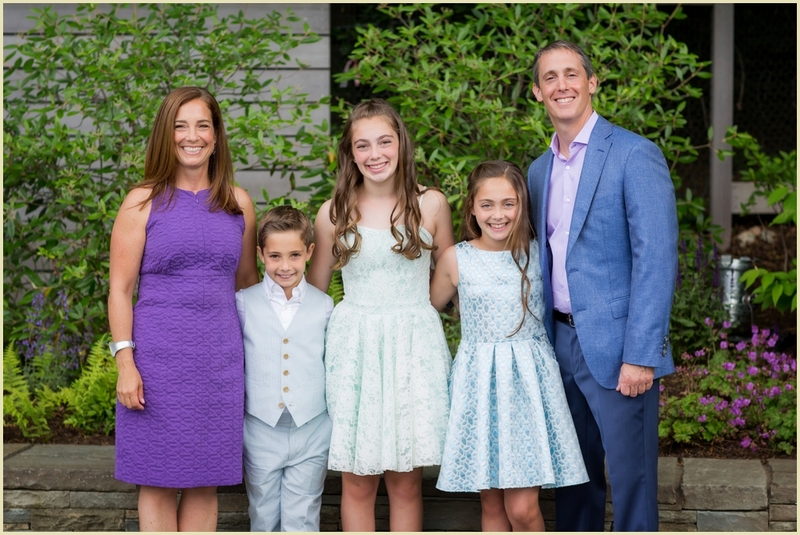 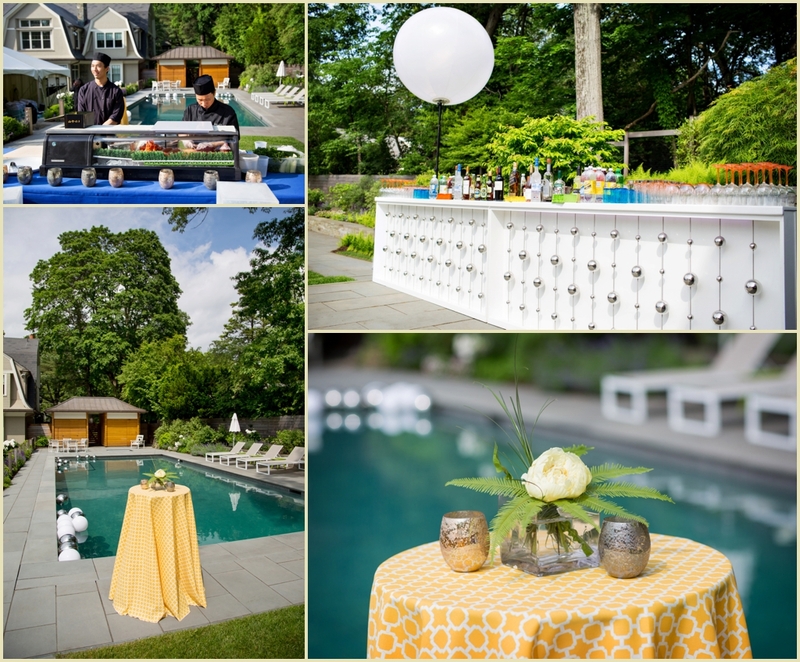 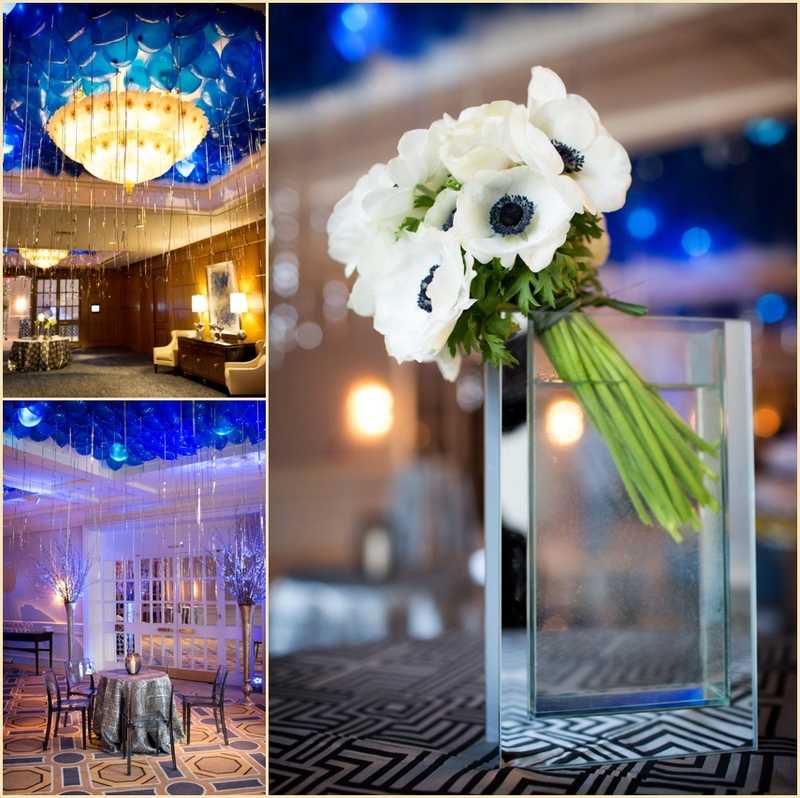 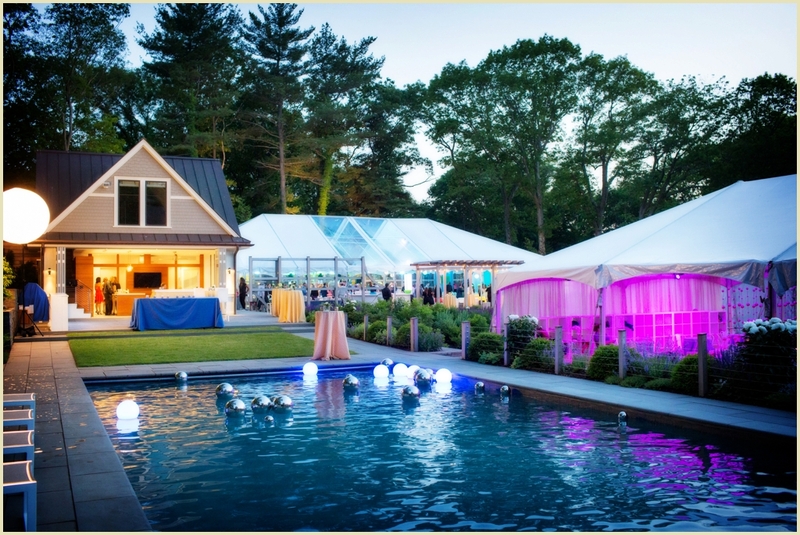 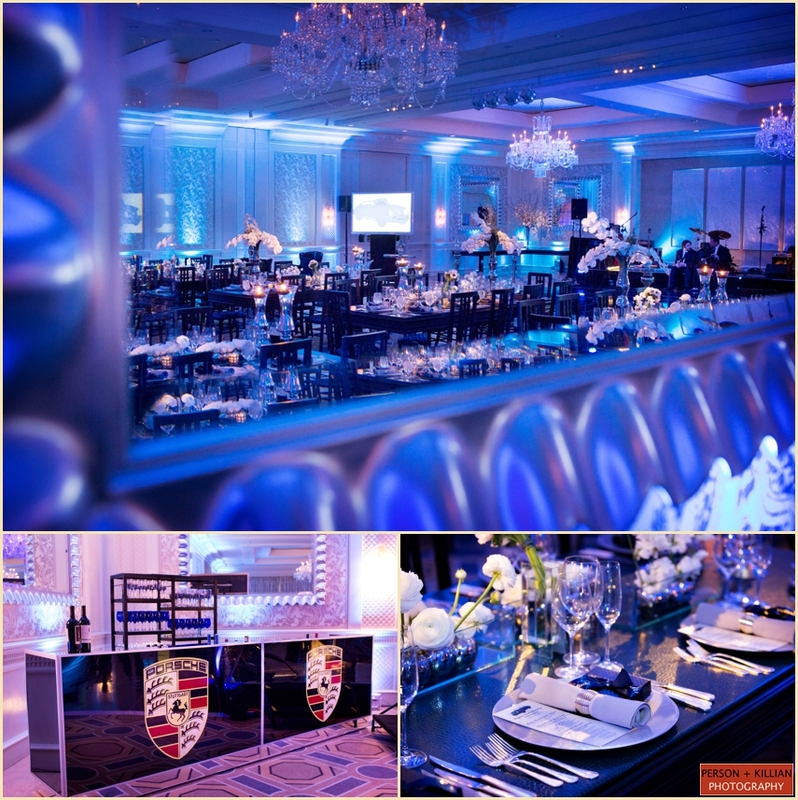 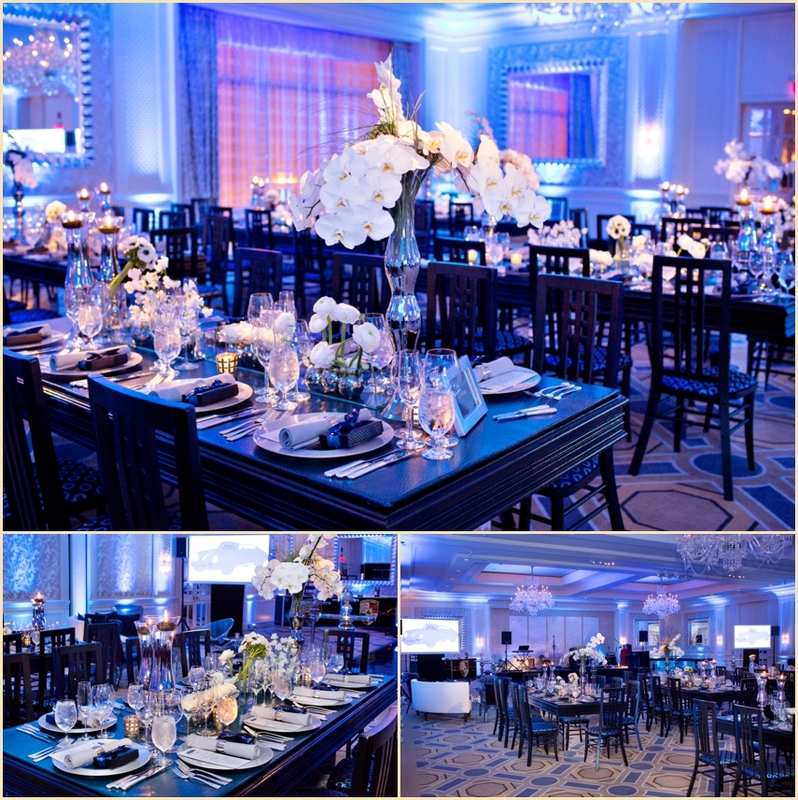 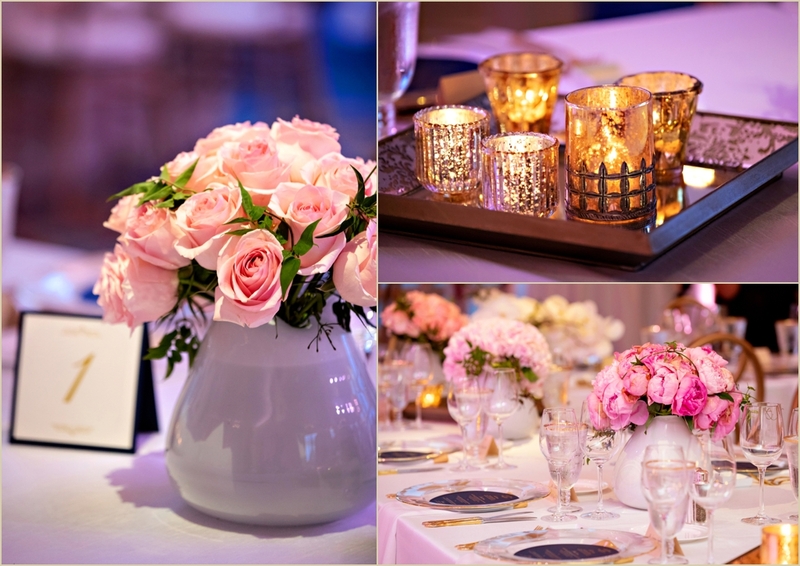 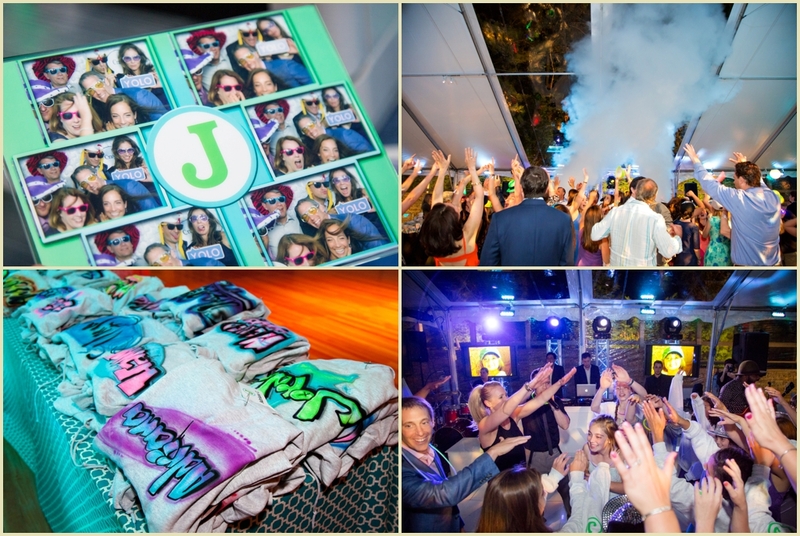 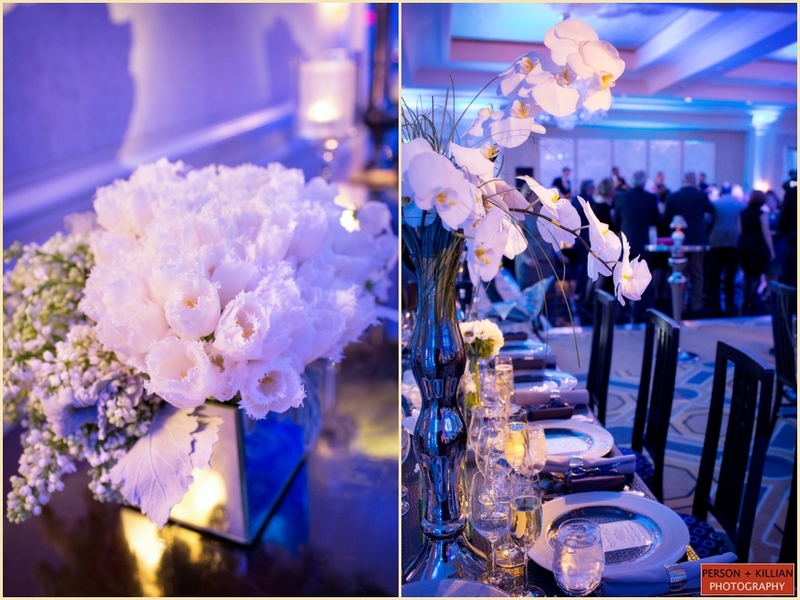 We want to make the warmer weather last a little bit longer with a flashback to this poolside Boston Bat Mitzvah with Jodi Raphael Events. 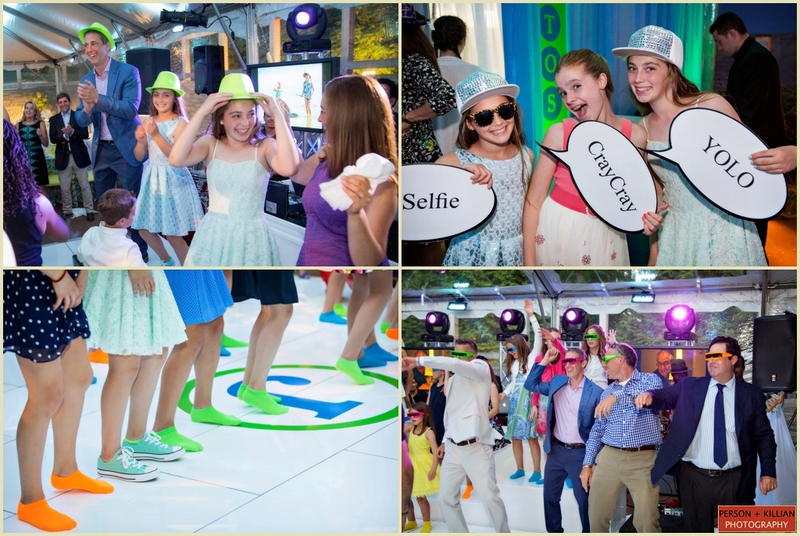 This super chic, modern Bat Mitzvah was all about the neon. 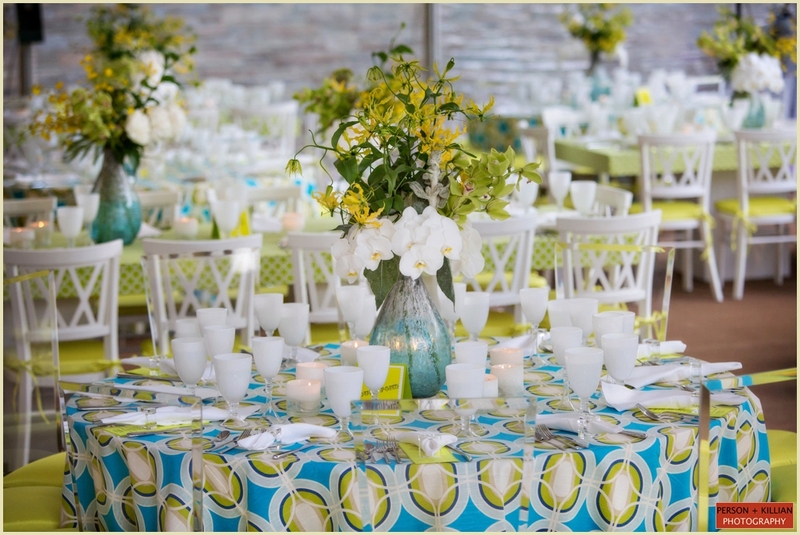 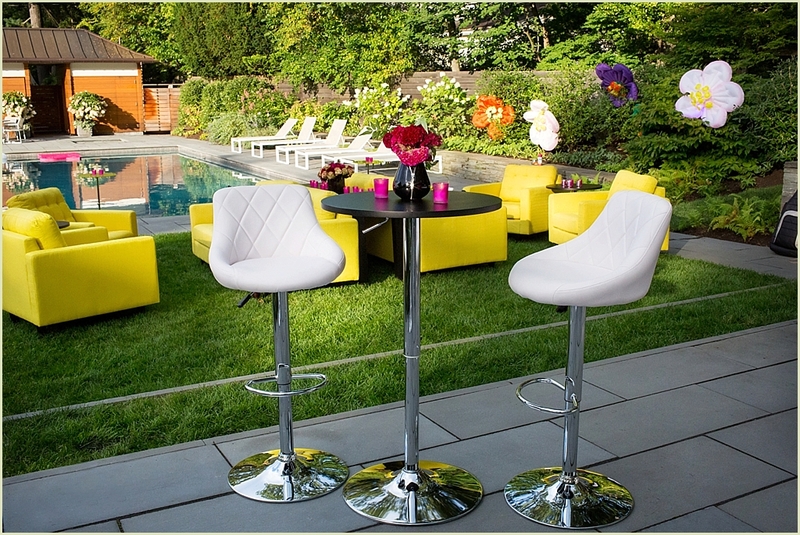 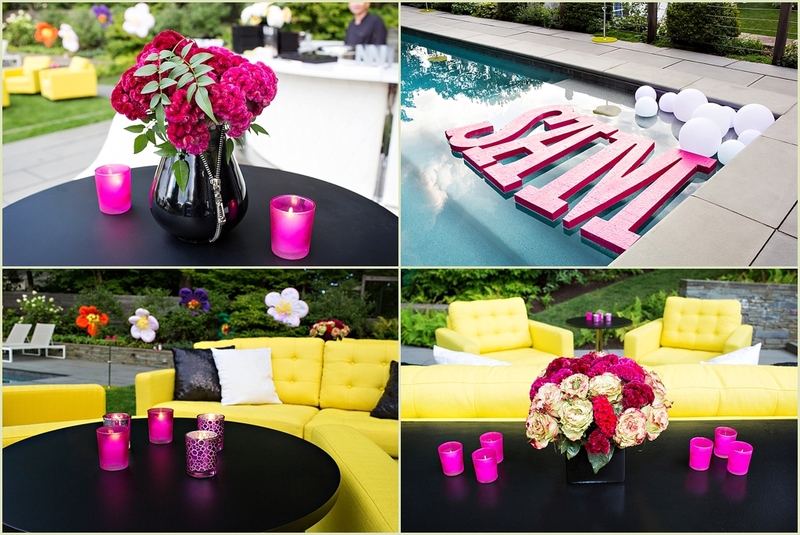 Bright yellow lounge furniture sat poolside with super mod hightop tables and pops of pink in the flowers, votive candles, and custom pool floats. 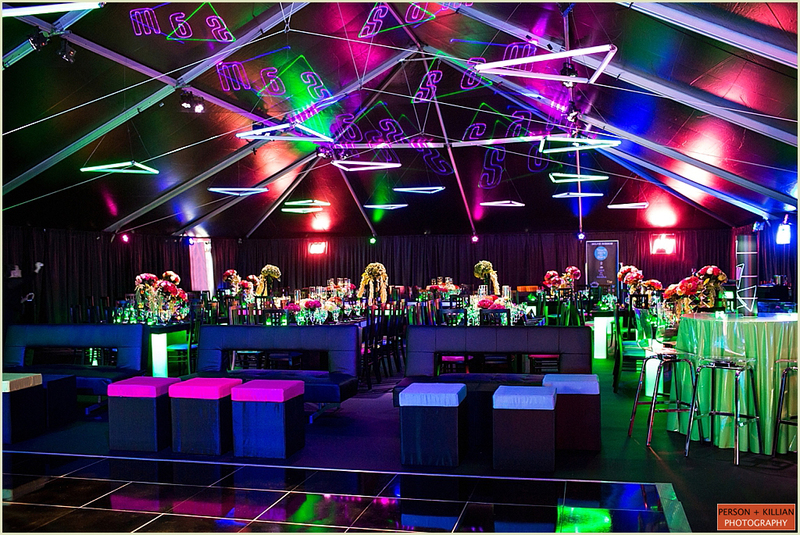 Inside the tent the neon was kicked into high gear — a custom event logo was made with neon lights and lots of triangles, which carried into the rest of the decor. 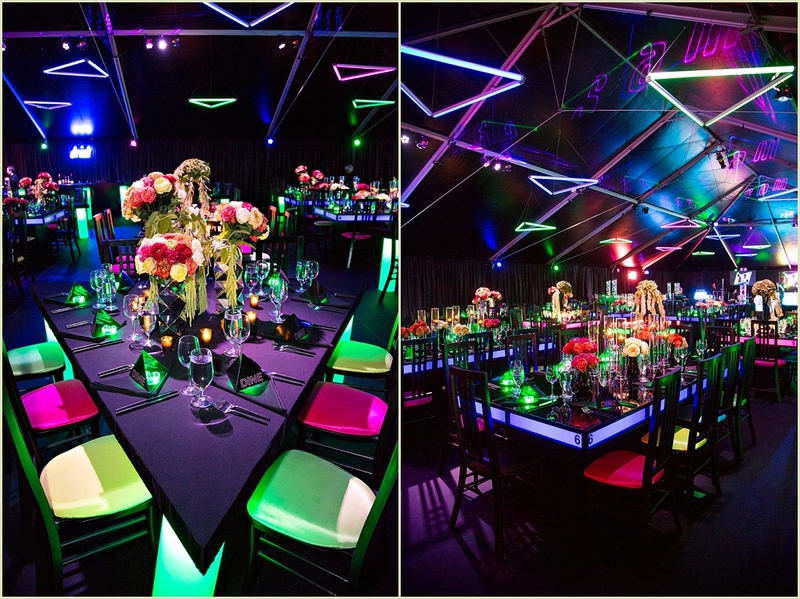 A chic black and neon lounge area surrounded the dance floor and high top tables were covered in a mix of bright colors like pink, yellow, and green. 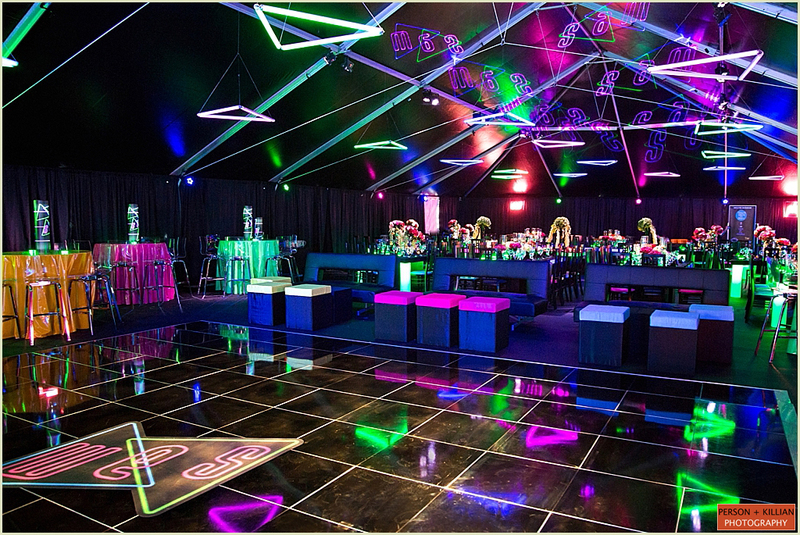 Neon triangle lights hung from the ceiling and custom triangle dining tables were made to match with the theme. 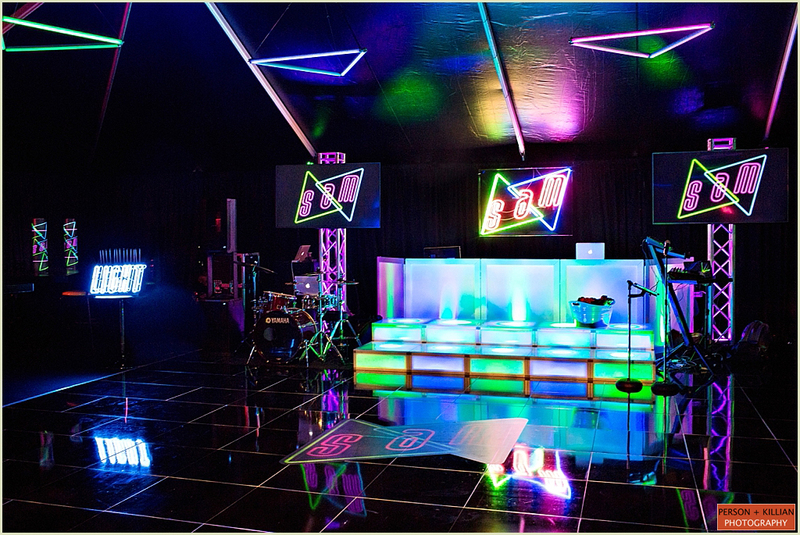 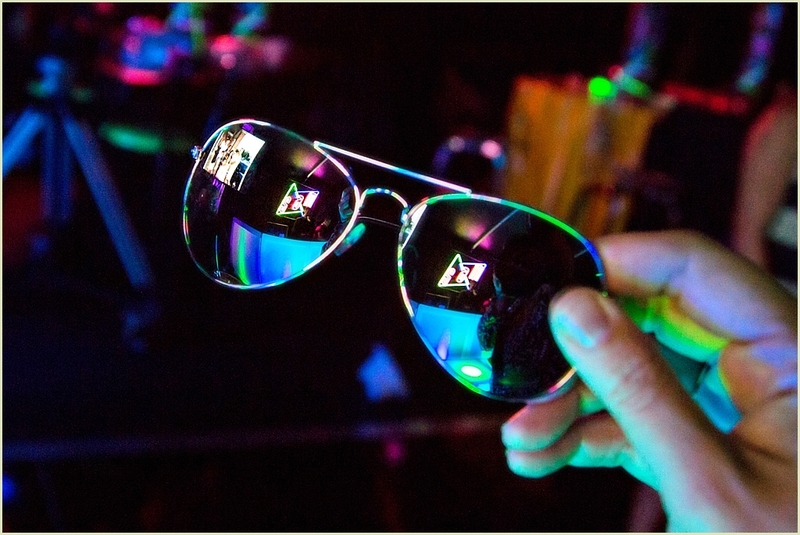 A custom neon laser light show was created to add to the atmosphere. 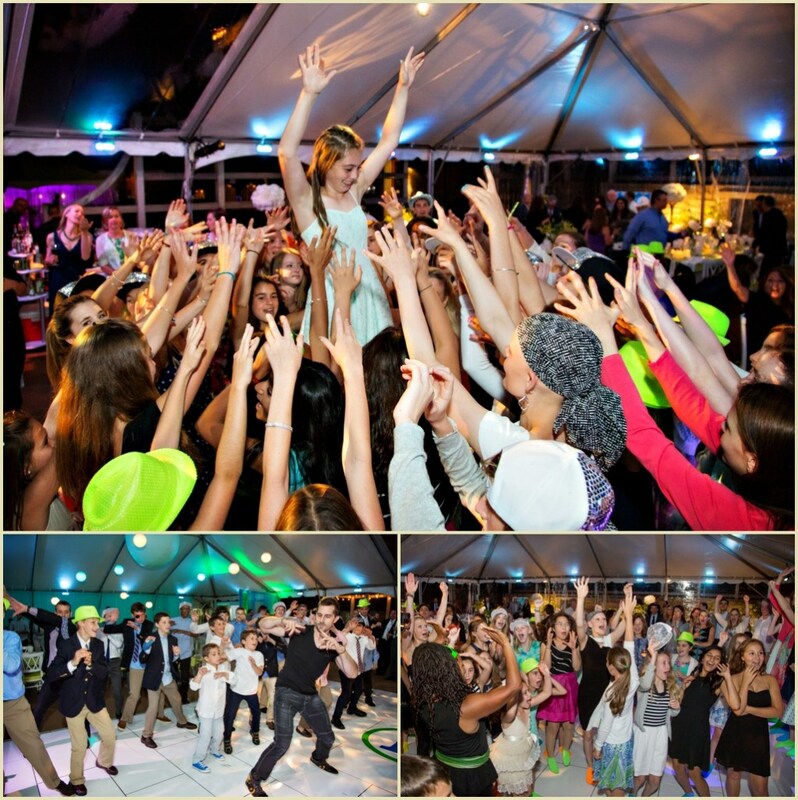 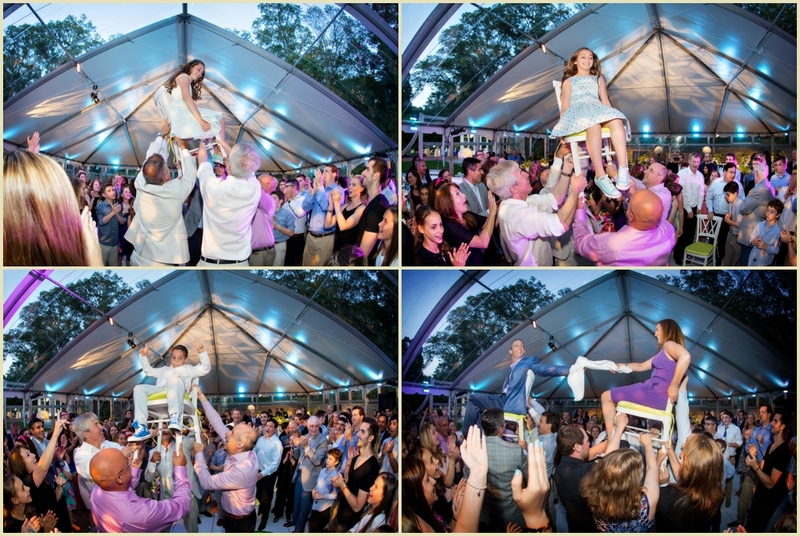 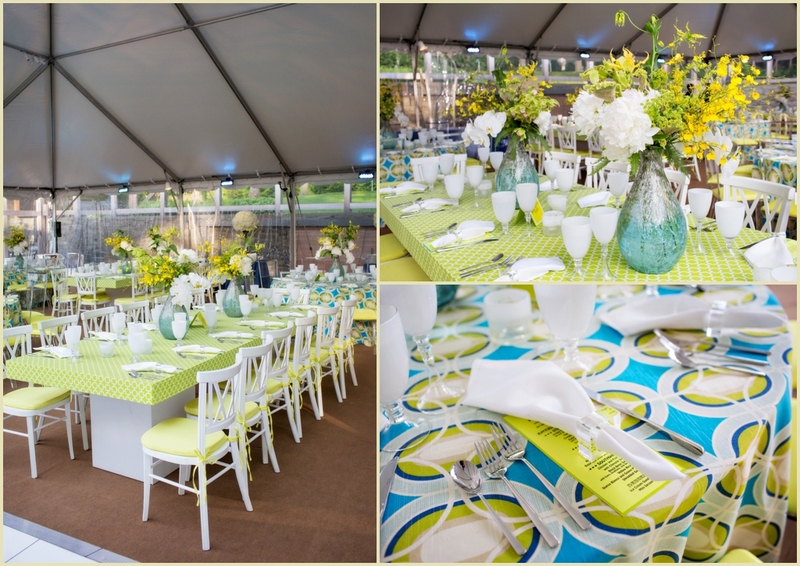 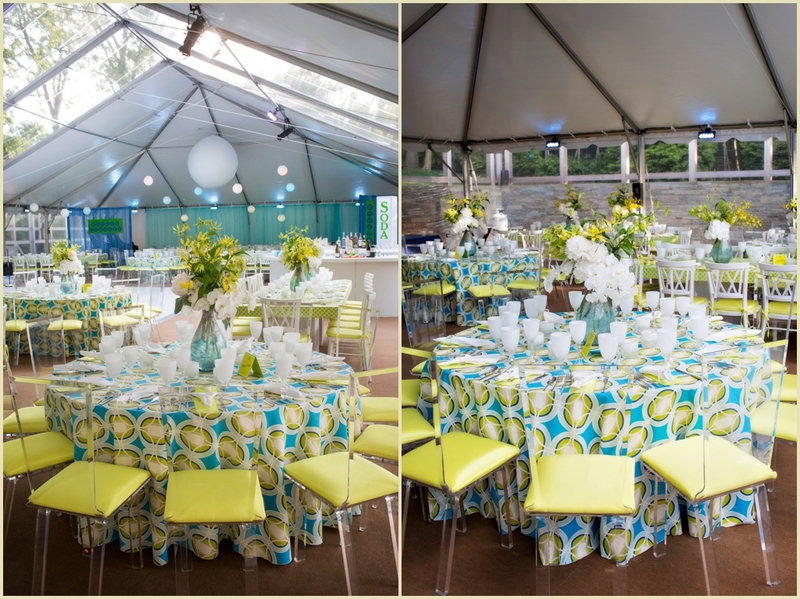 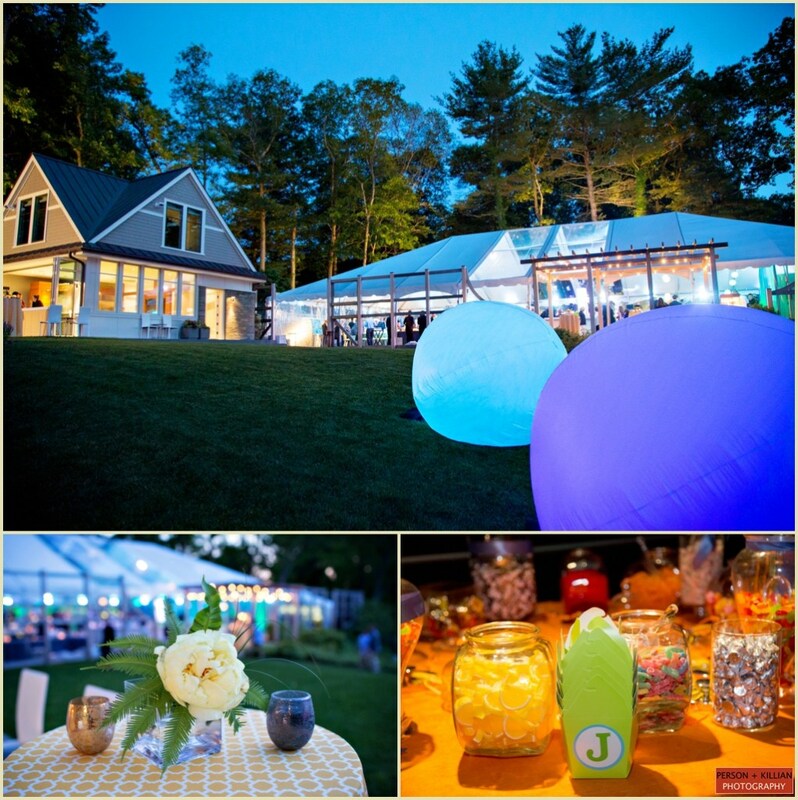 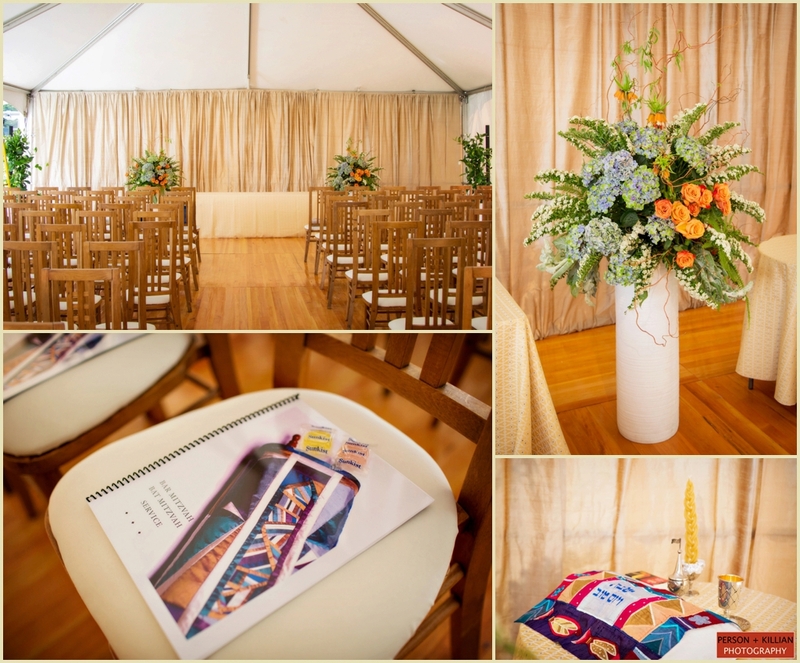 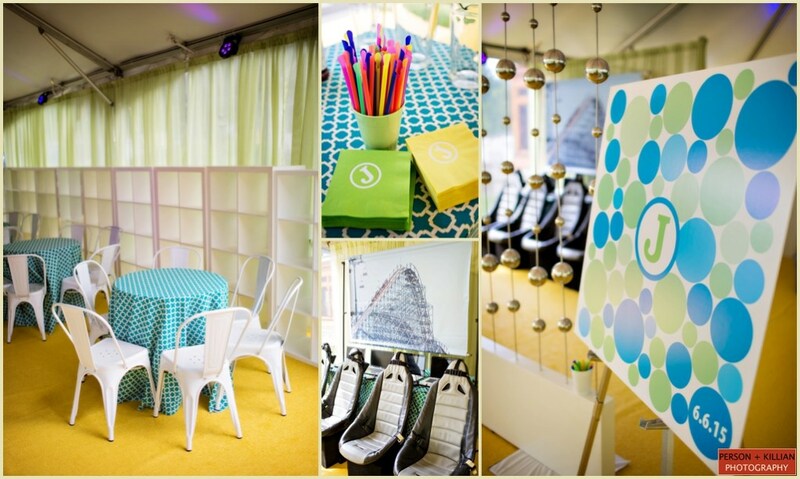 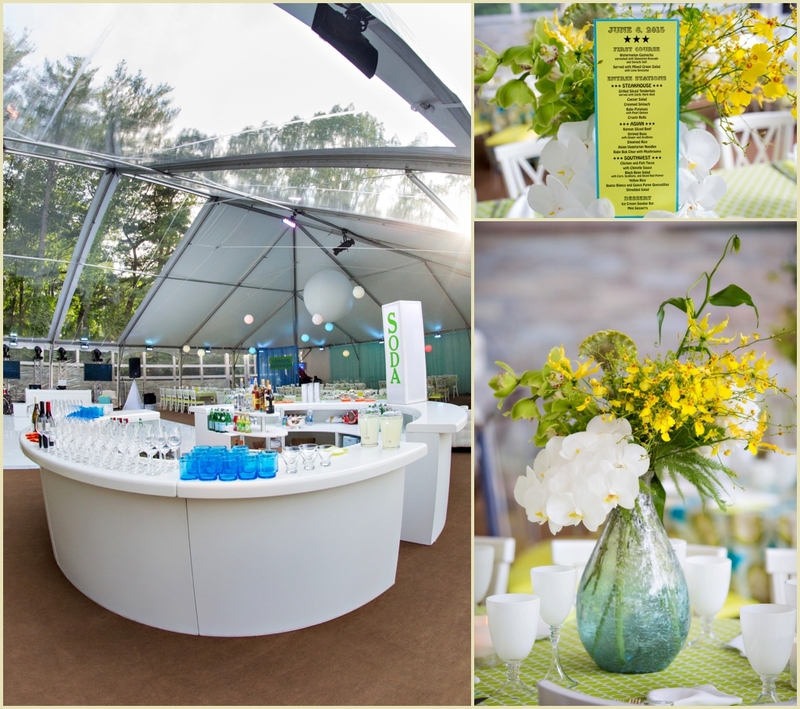 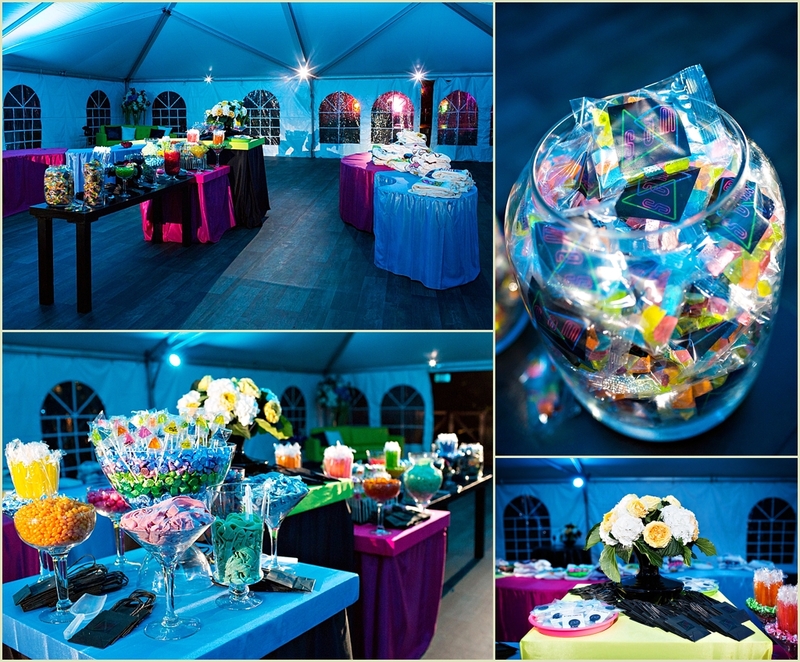 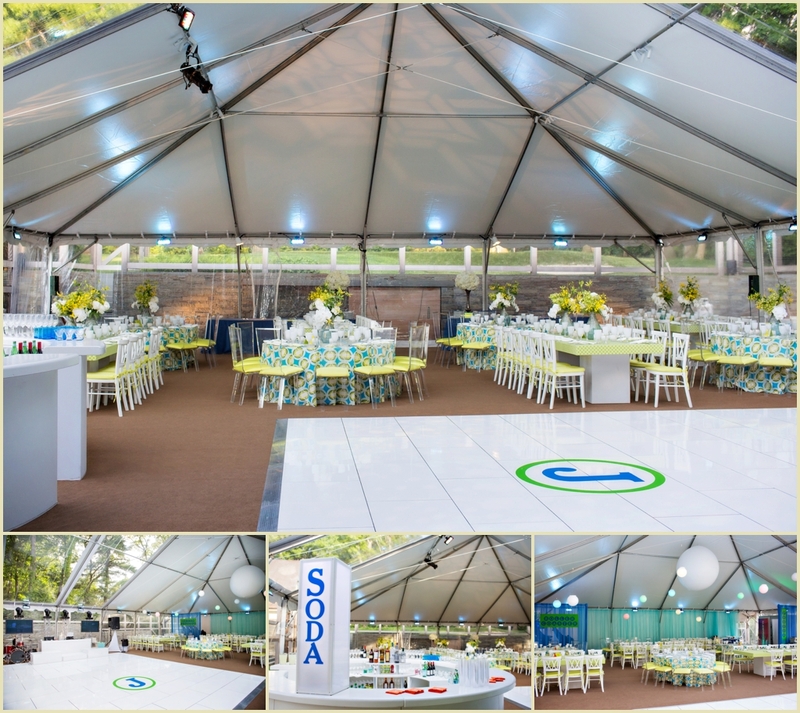 The entire tent was absolutely bursting with light and color, the perfect environment for a fun and fabulous Boston Bat Mitzvah. 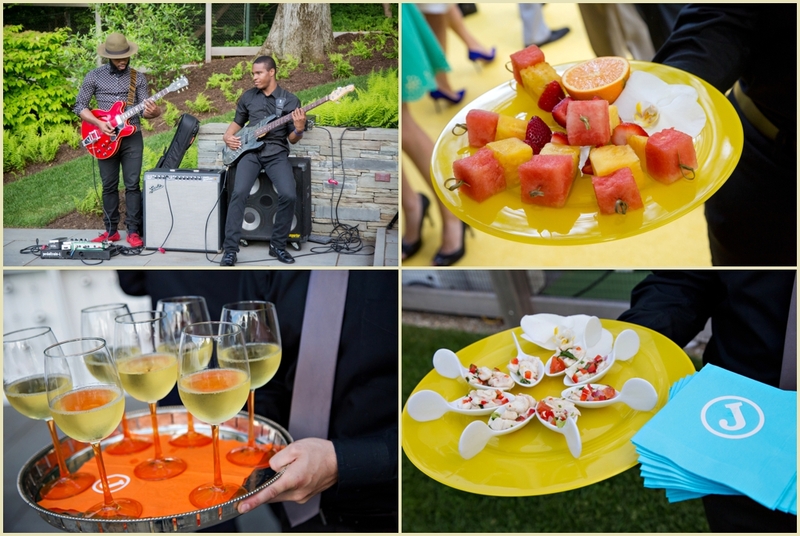 A big thank you to Jodi Raphael and her team for this bright and colorful event — it won’t be too long before we’ll be enjoying the summer sunshine again! 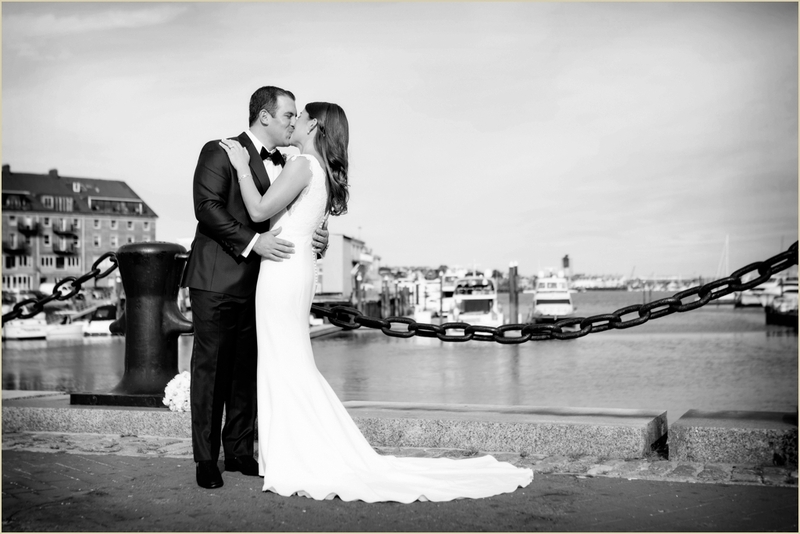 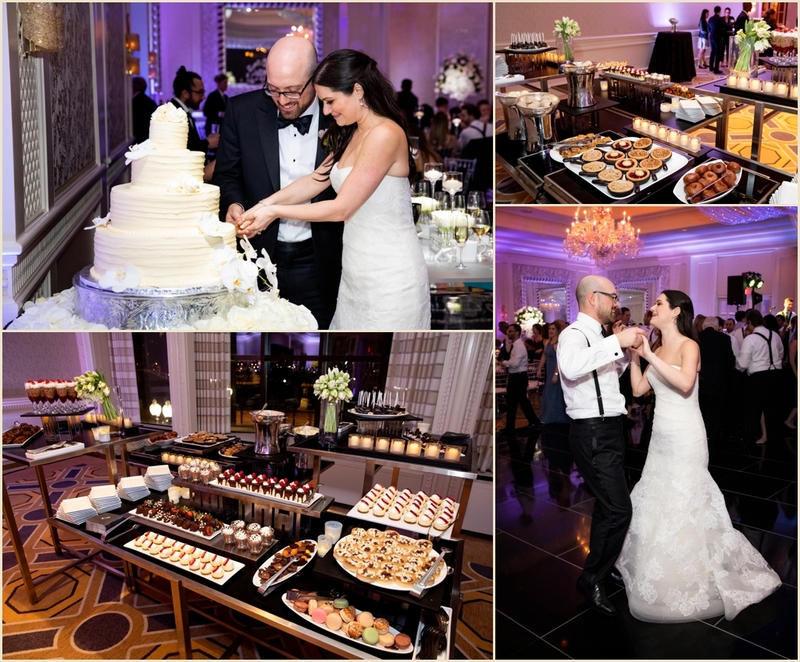 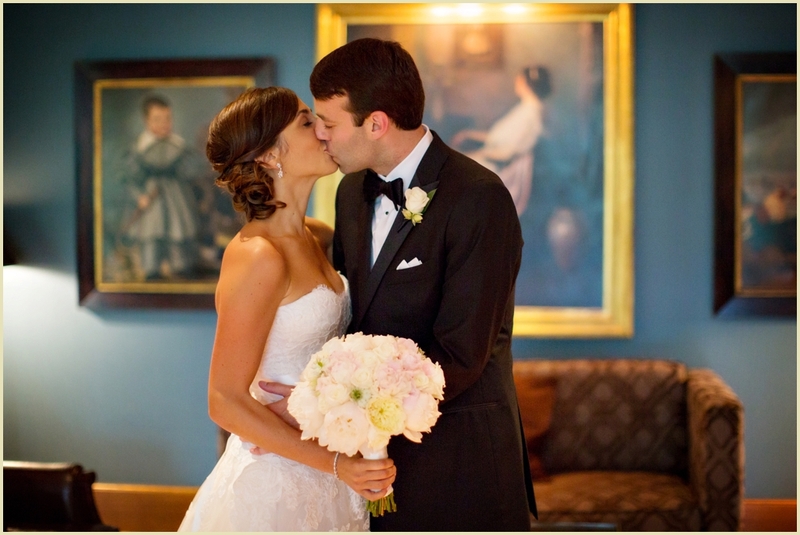 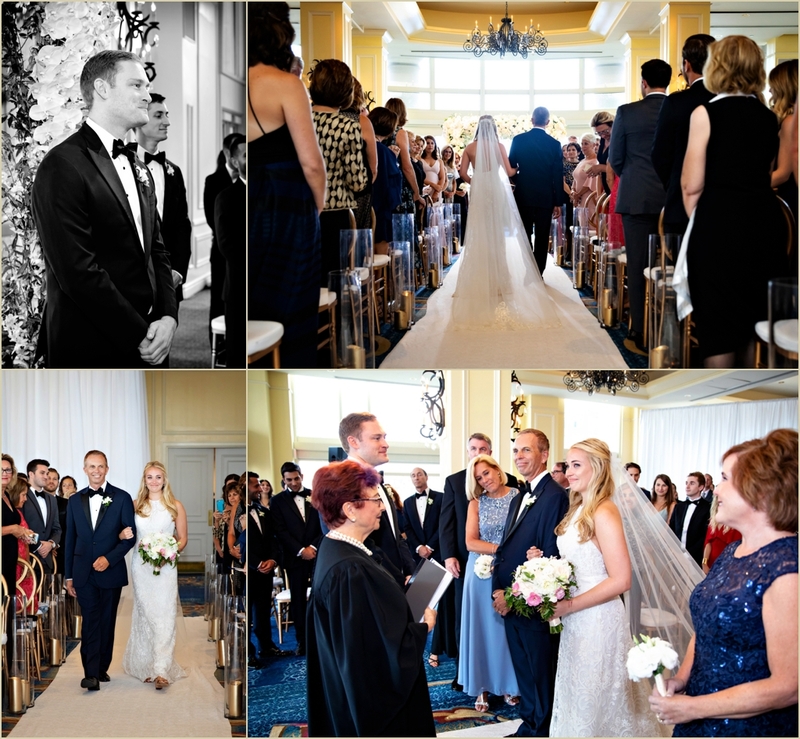 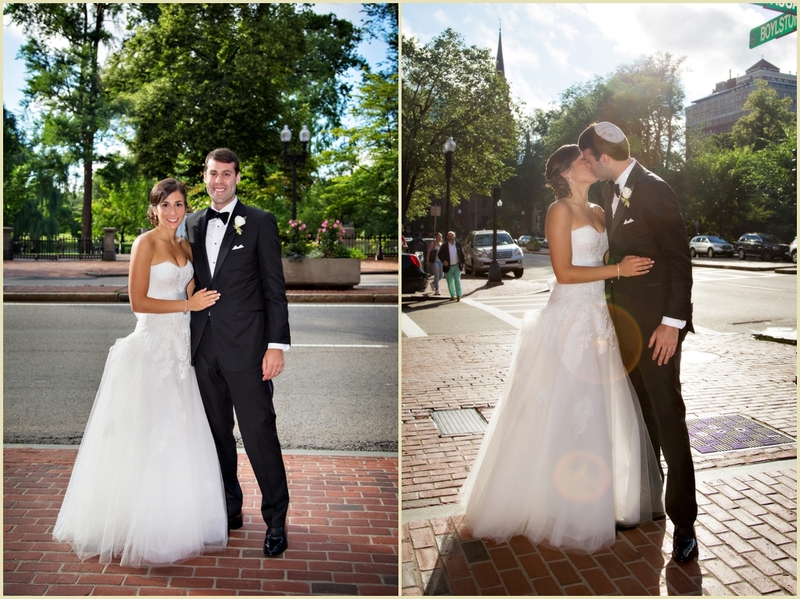 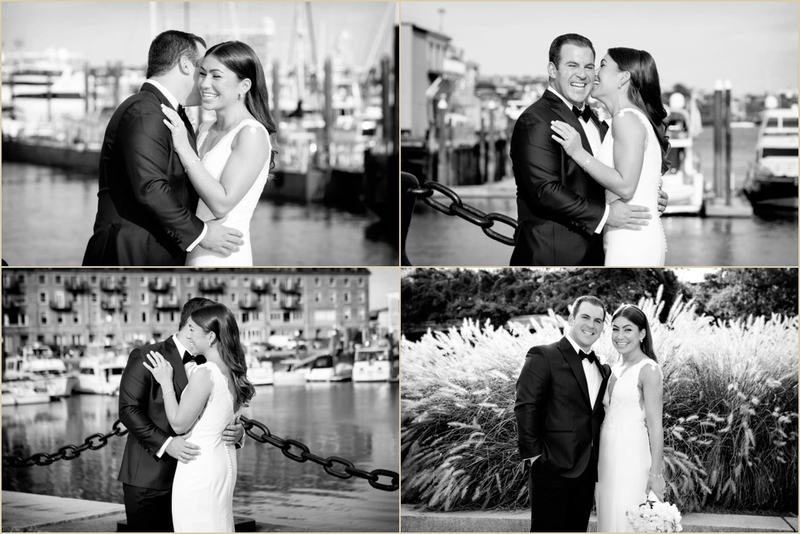 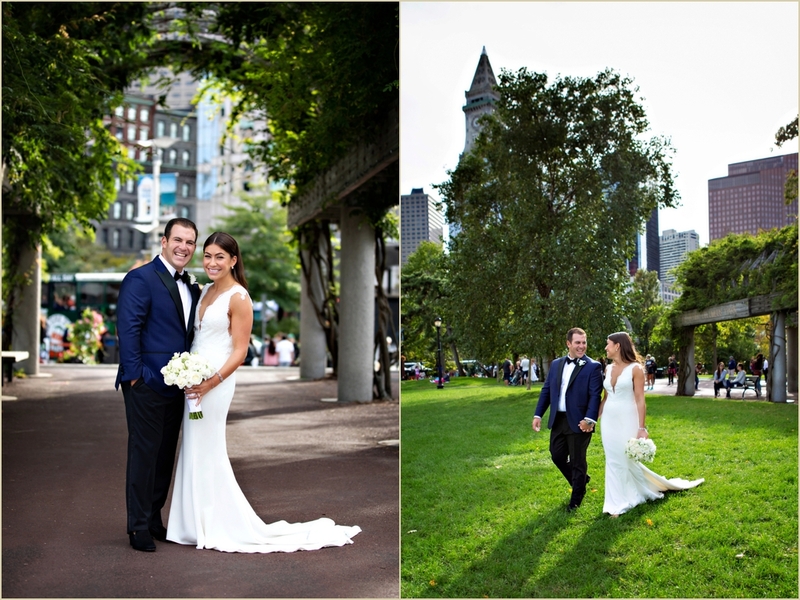 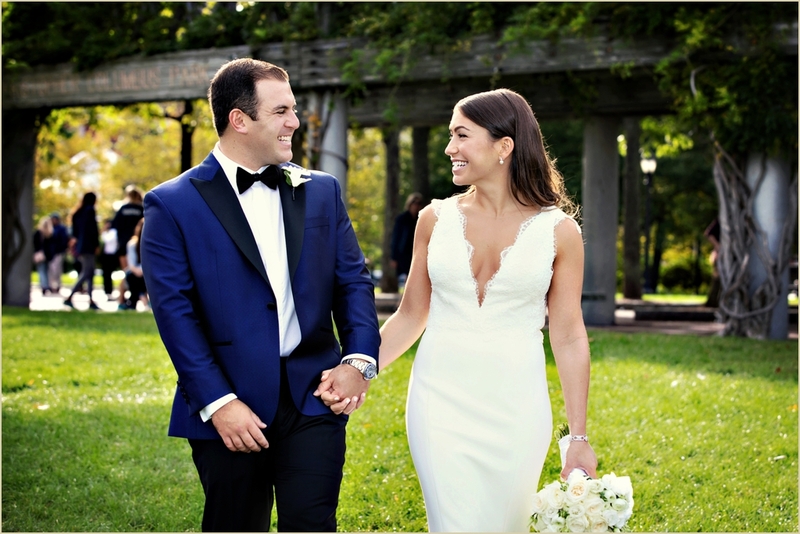 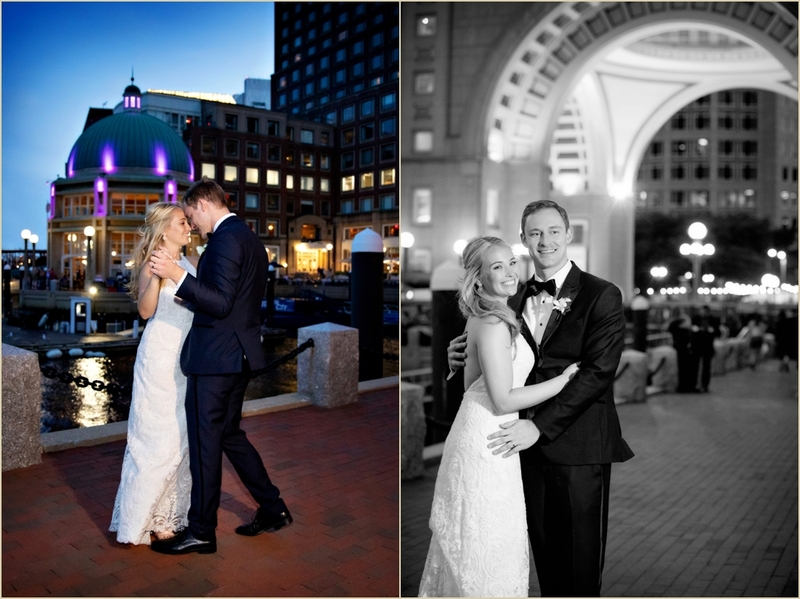 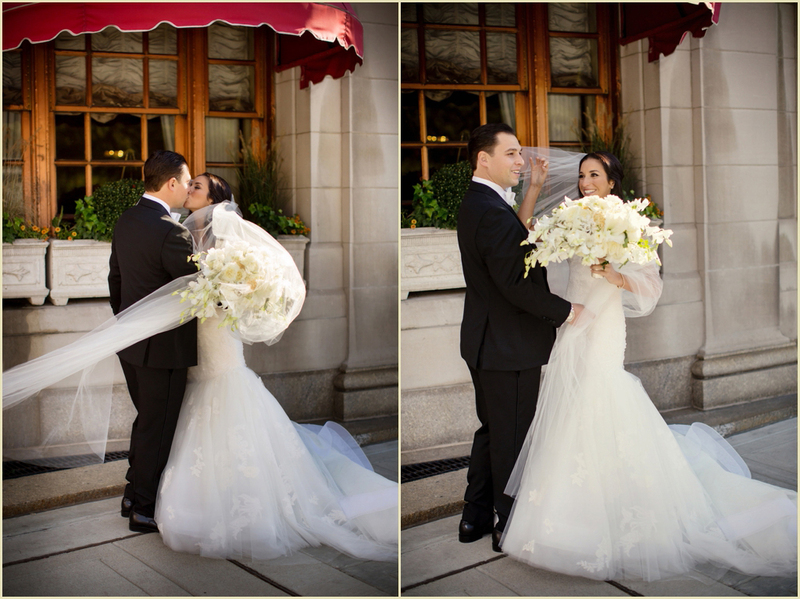 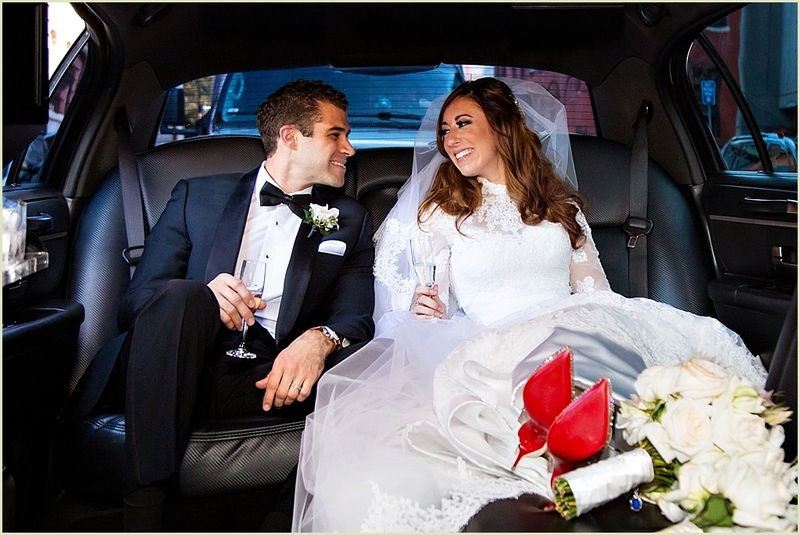 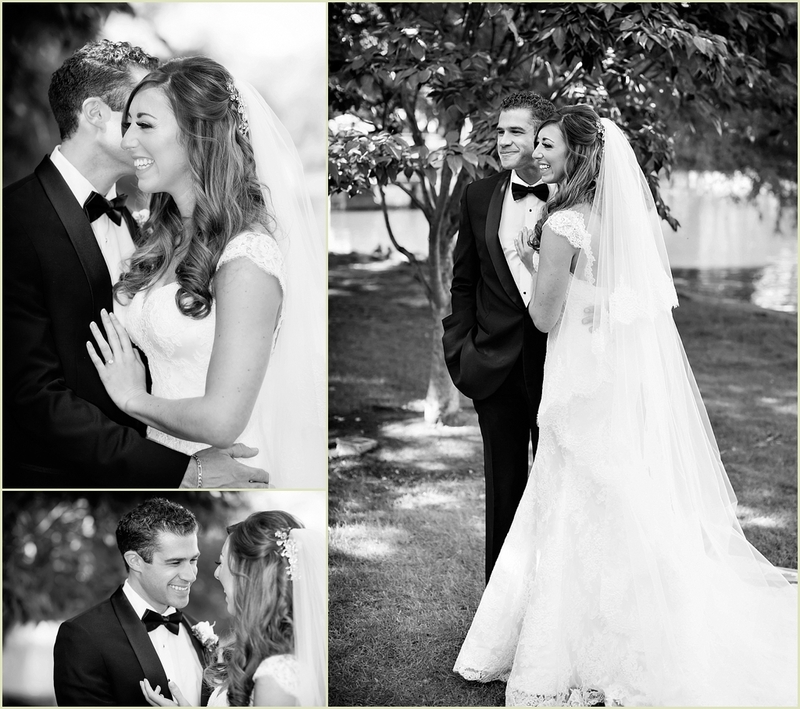 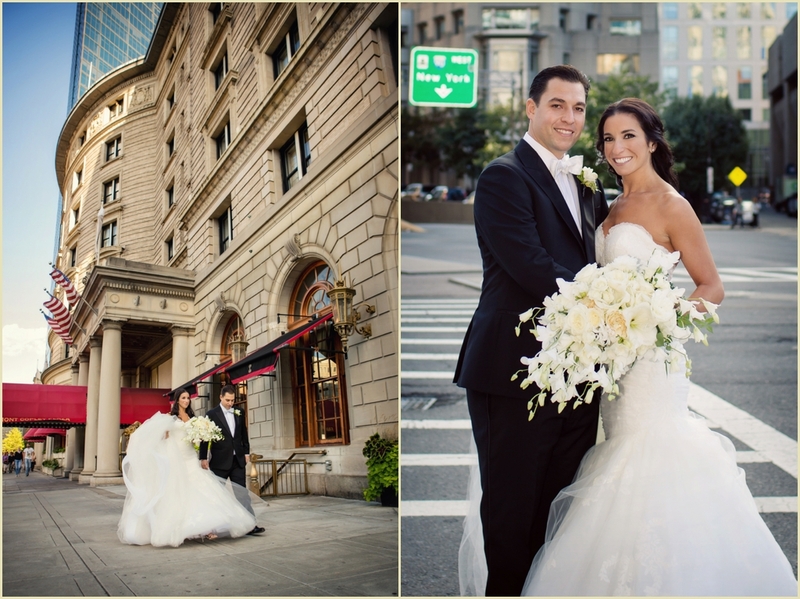 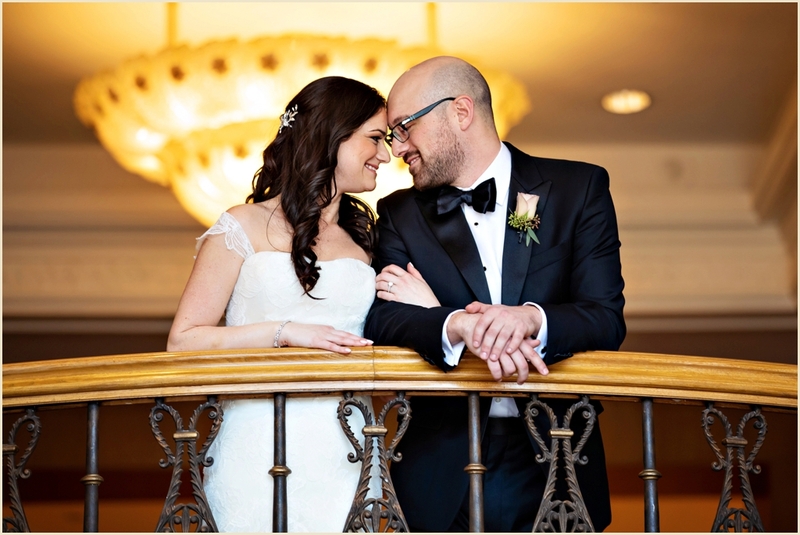 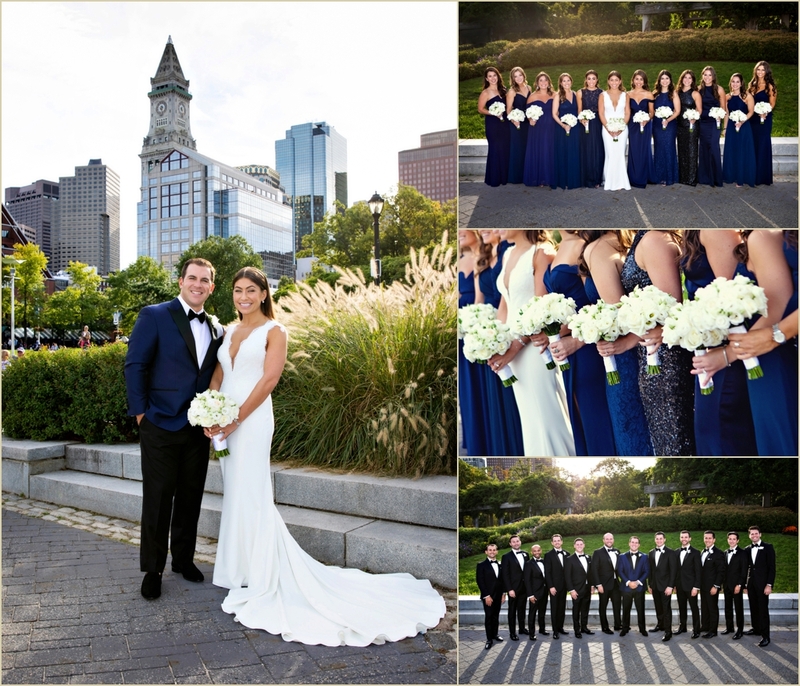 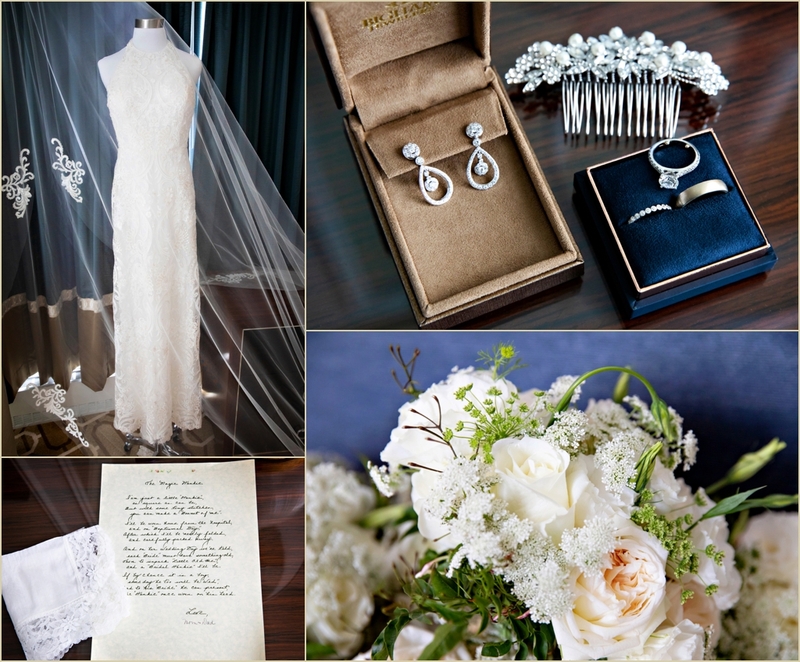 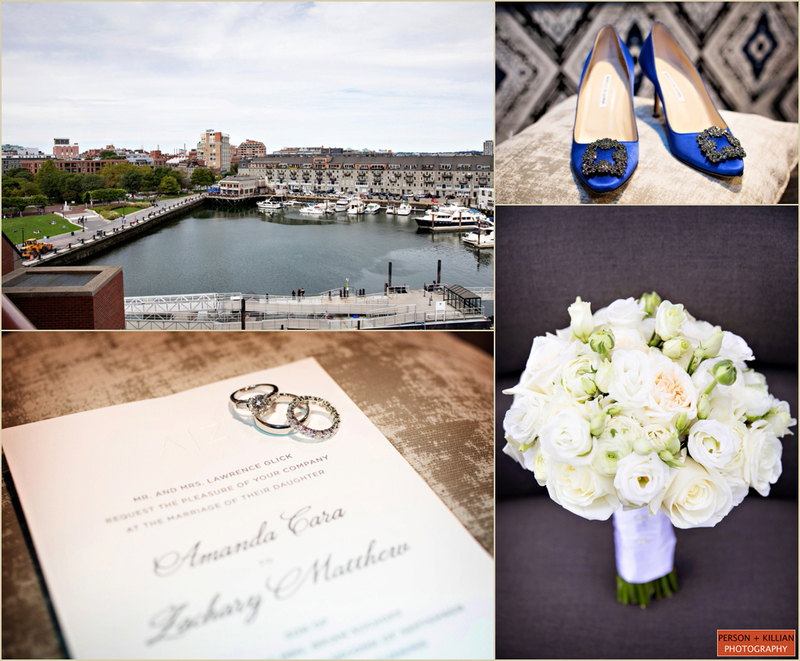 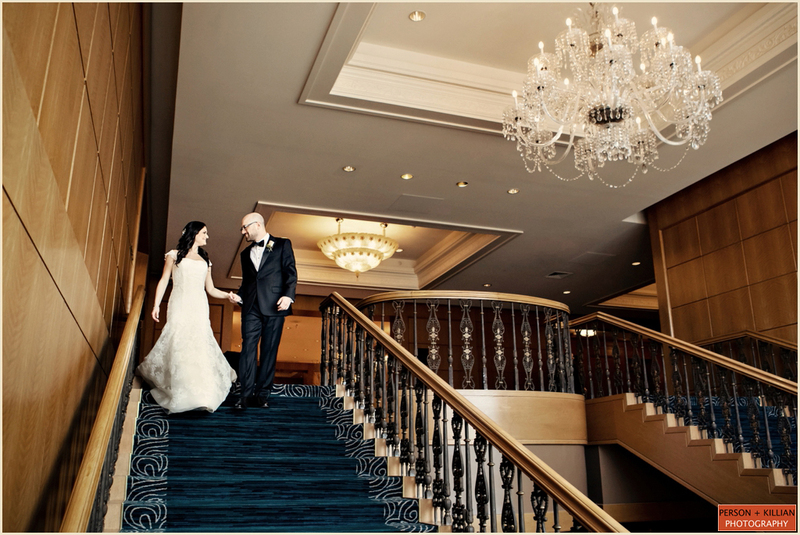 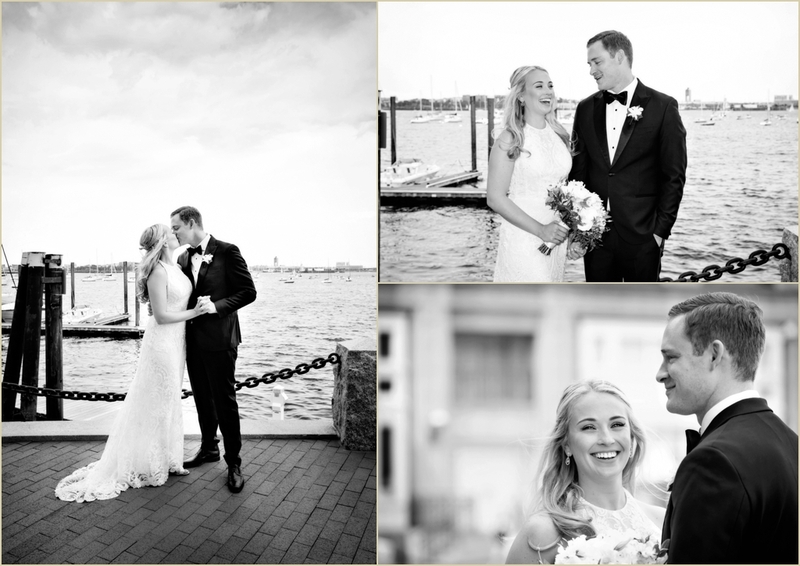 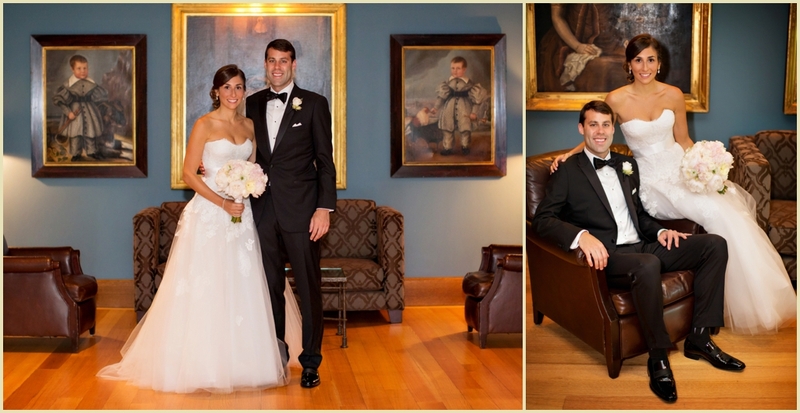 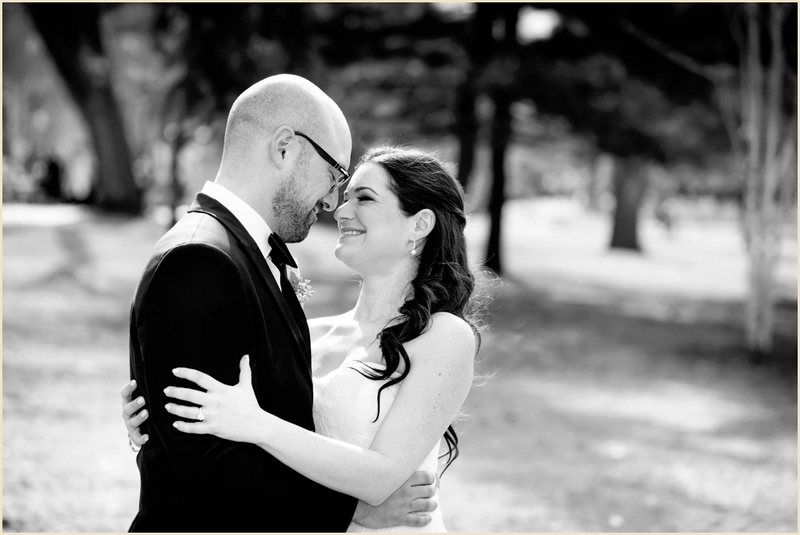 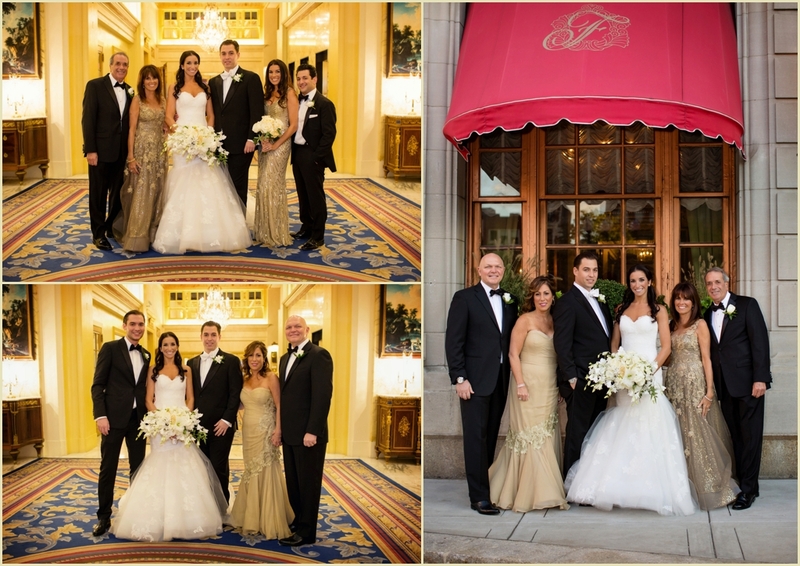 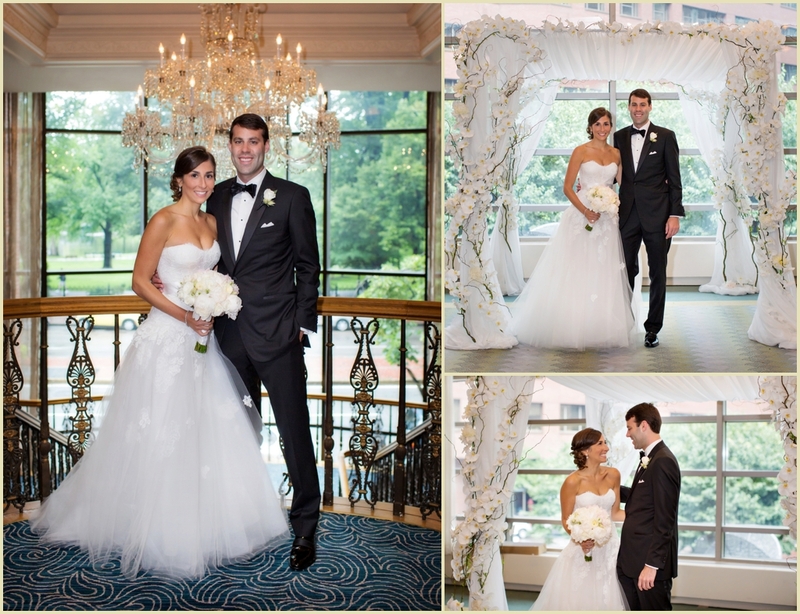 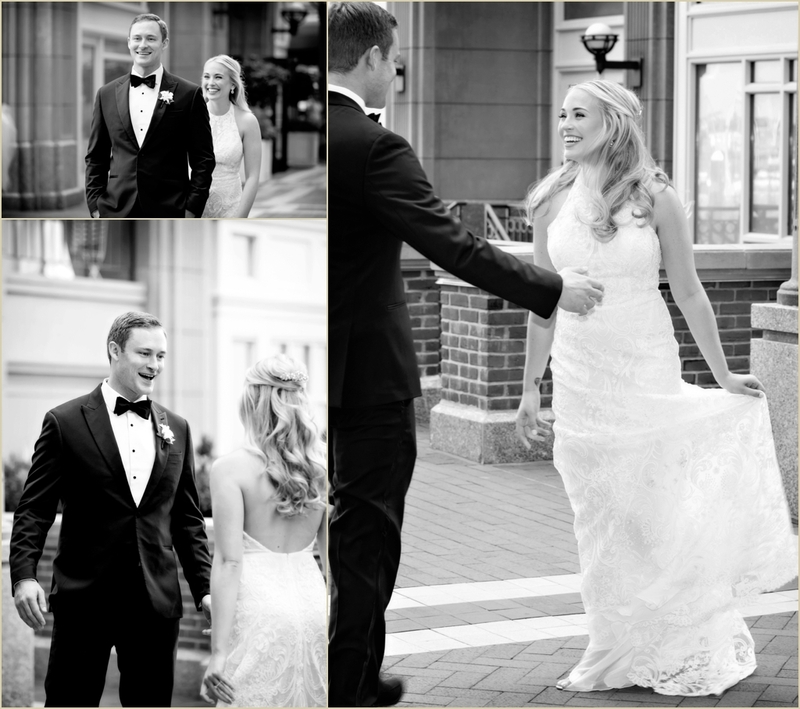 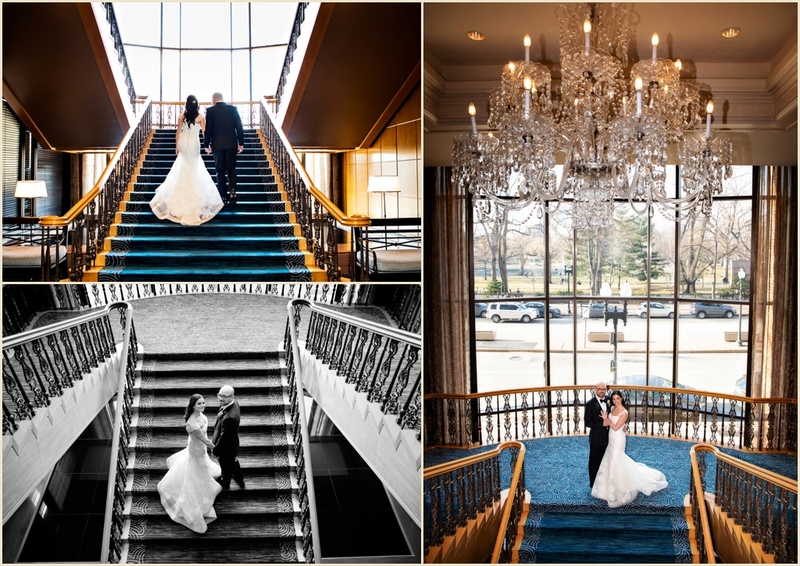 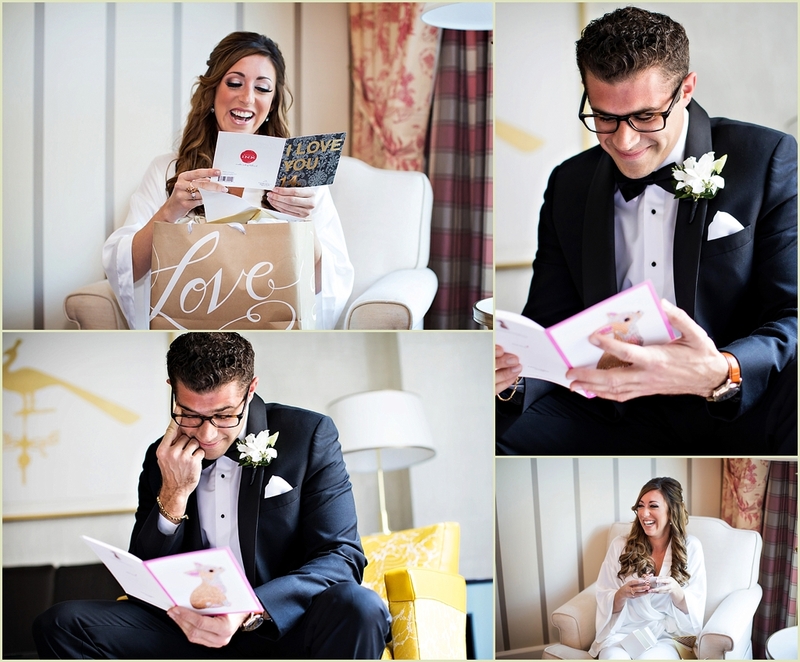 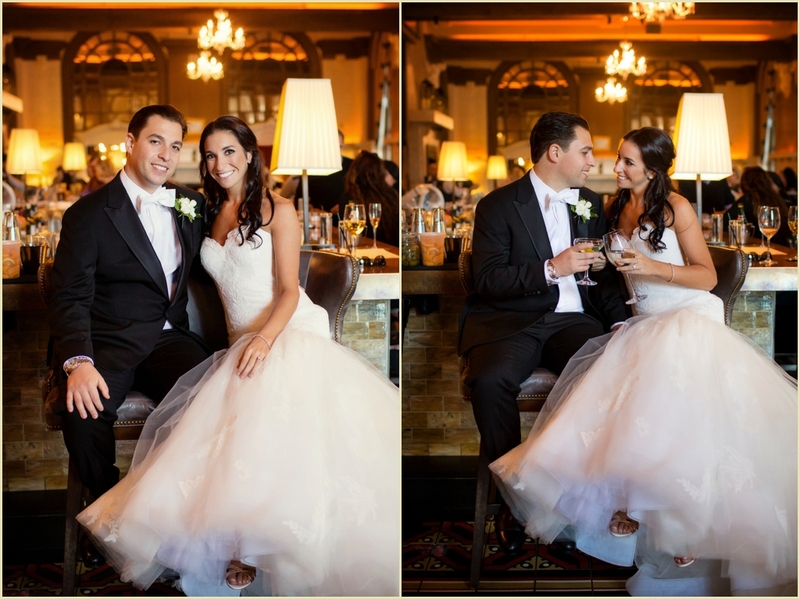 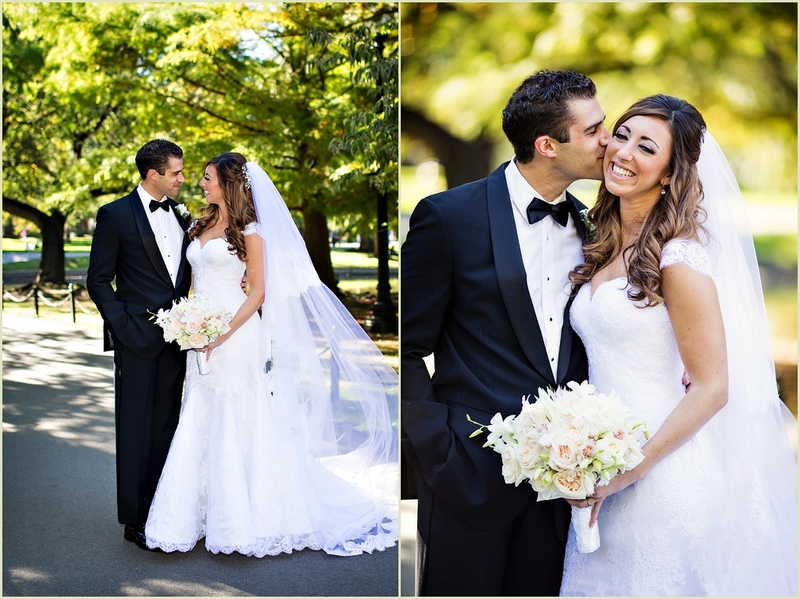 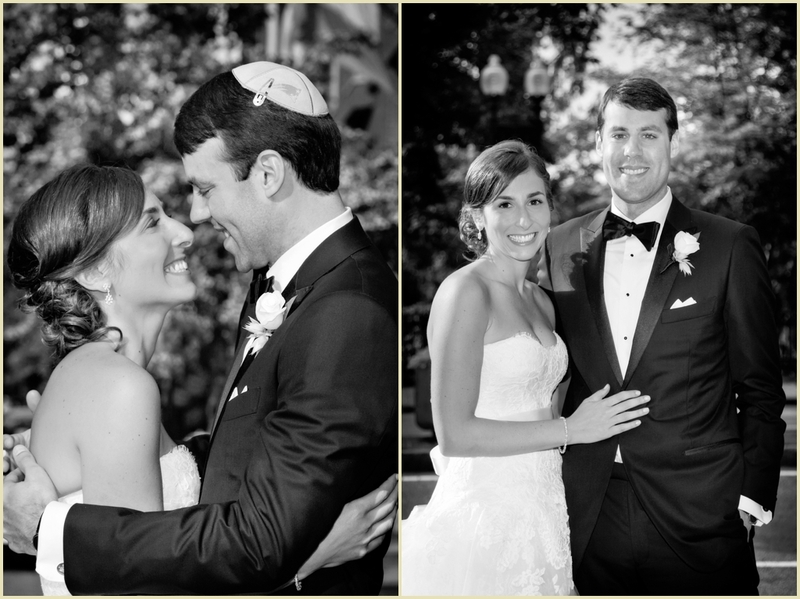 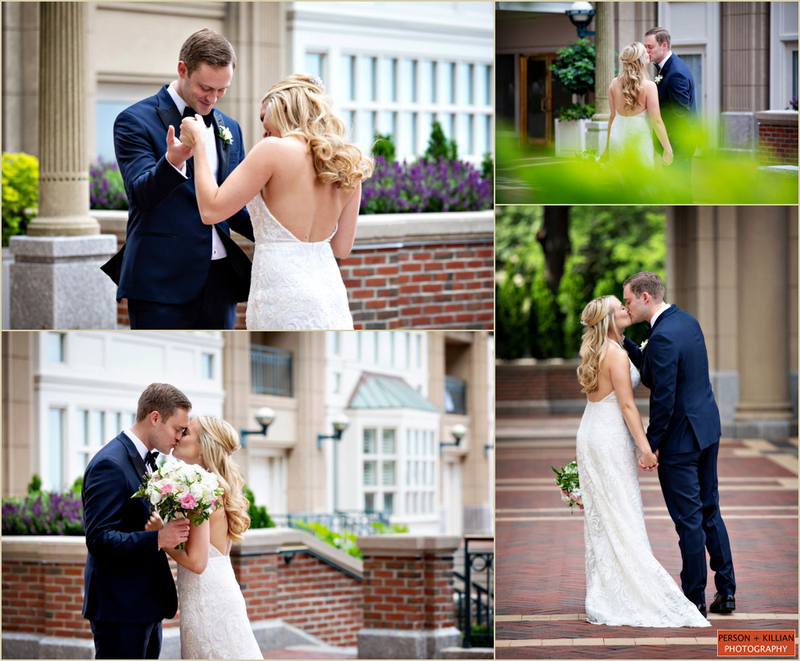 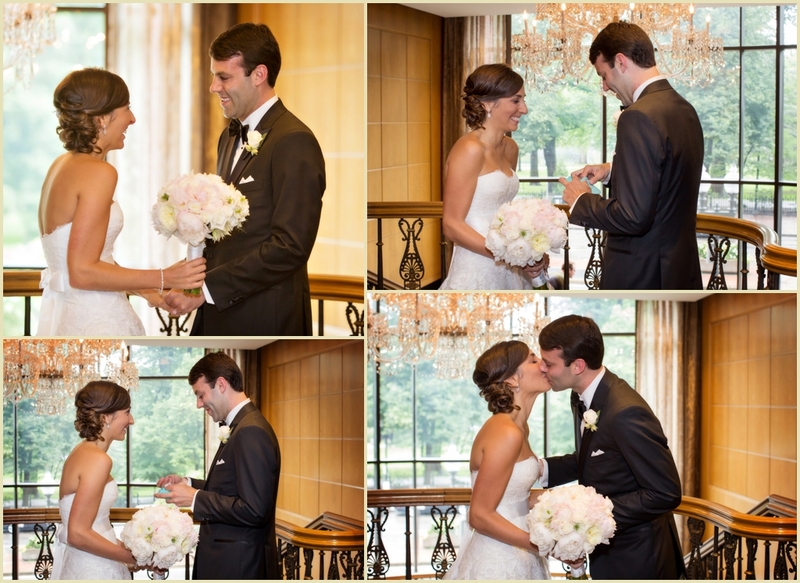 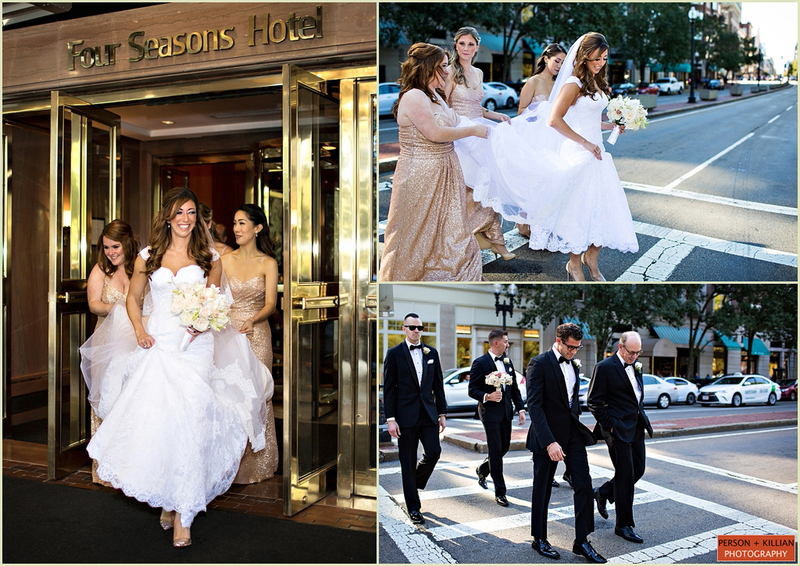 Jamie and Matt had a gorgeous traditional Jewish wedding at the always beautiful Four Seasons Hotel Boston. 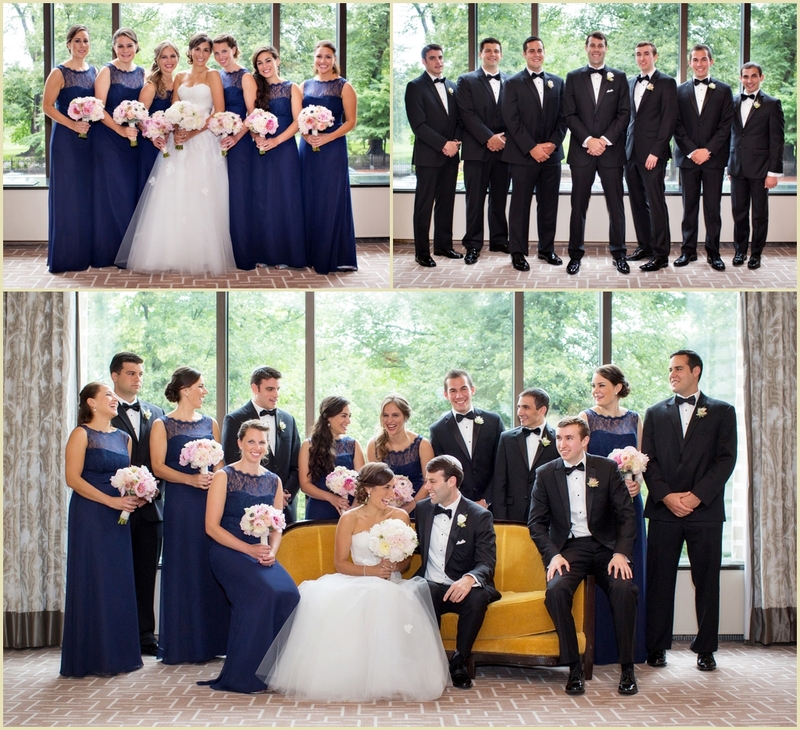 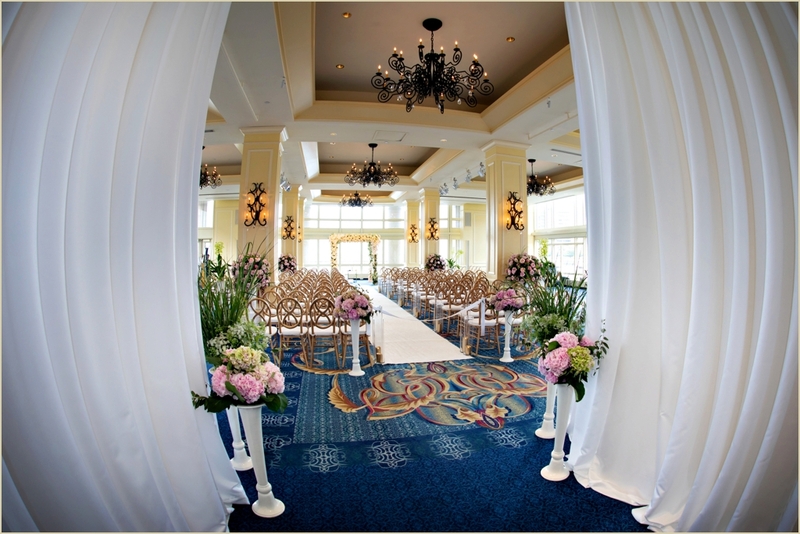 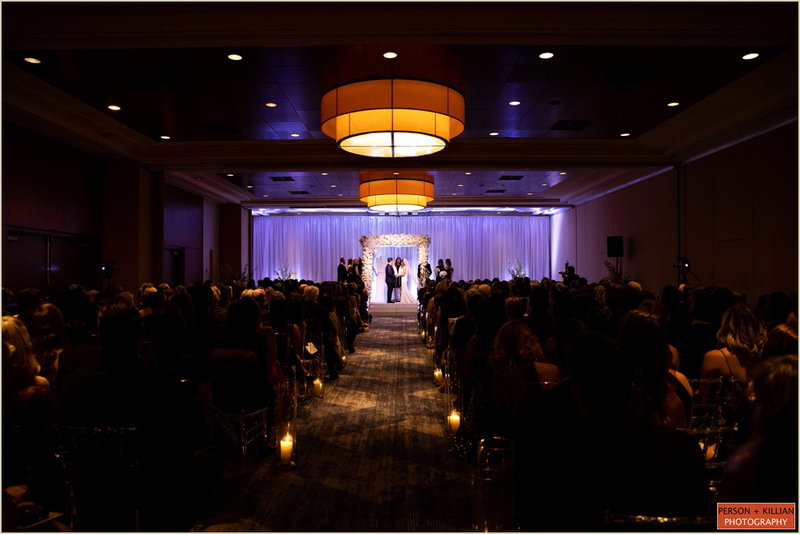 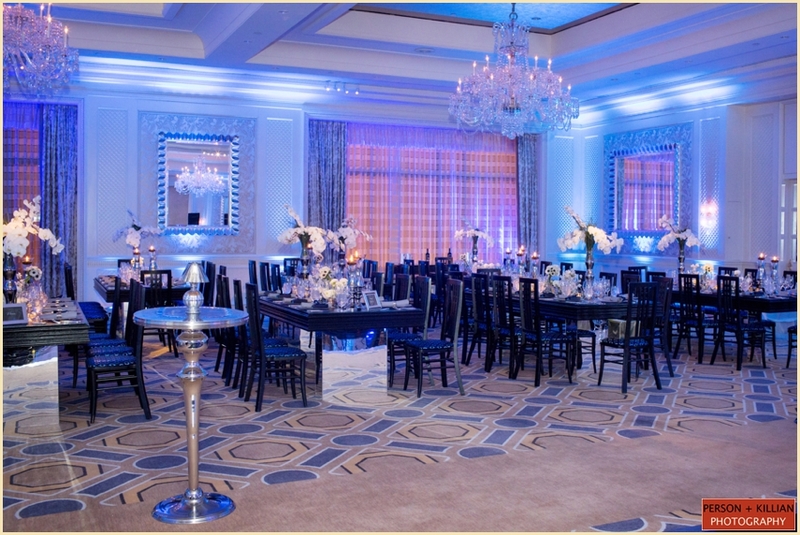 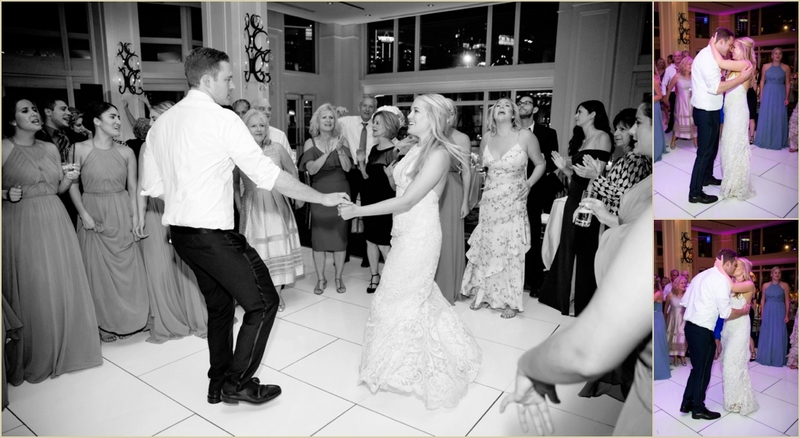 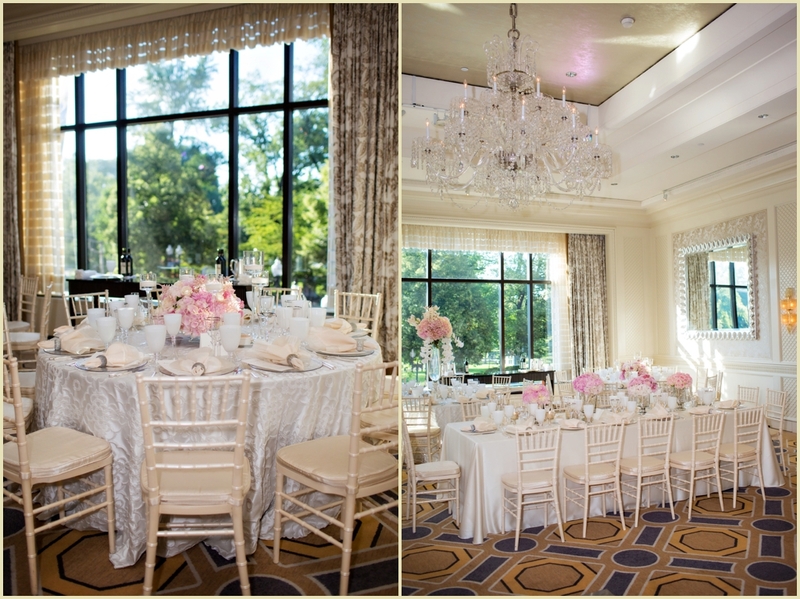 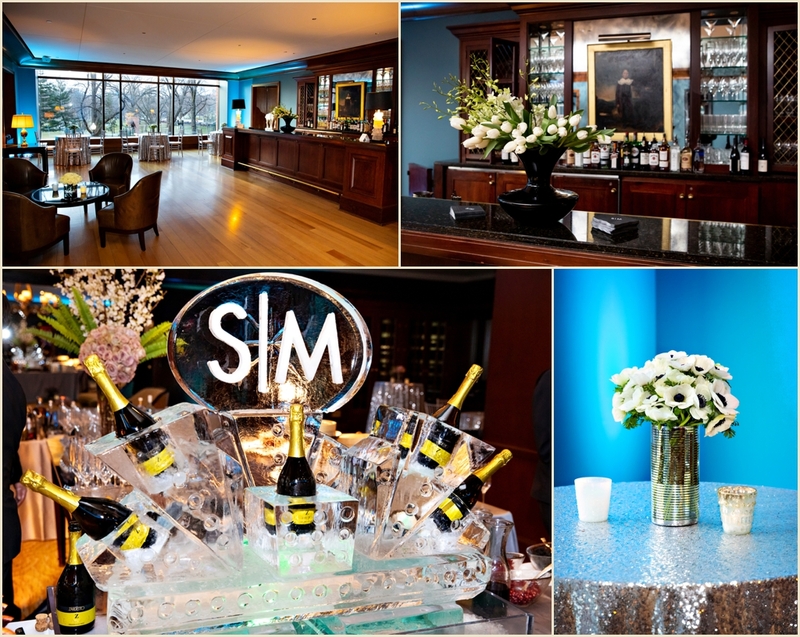 The bride and groom were able to utilize all of the rooms and spaces throughout the hotel including their ceremony in the Governor’s Room, cocktail hour in Aujourd’hui and dinner and dancing in the Ballroom. 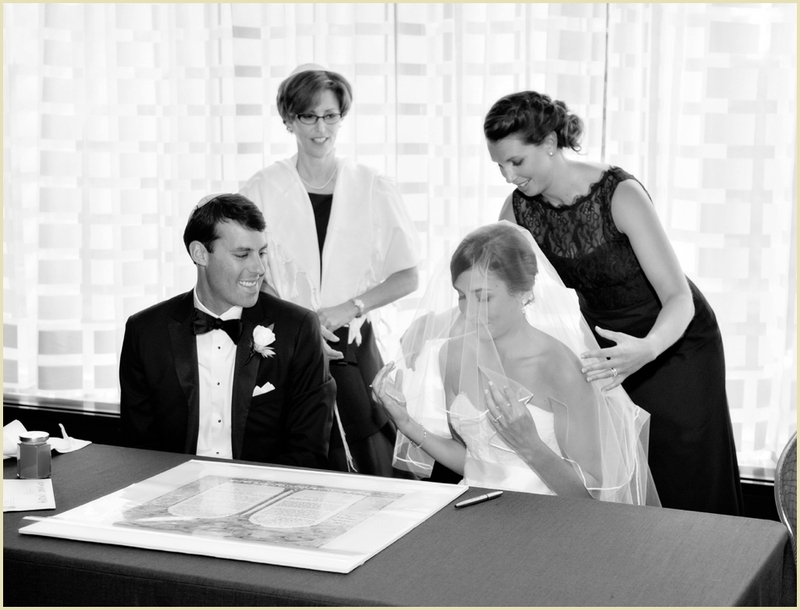 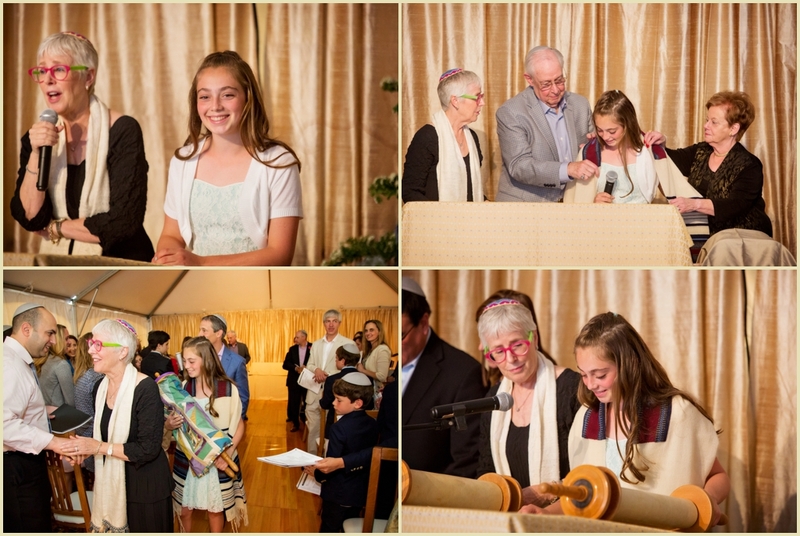 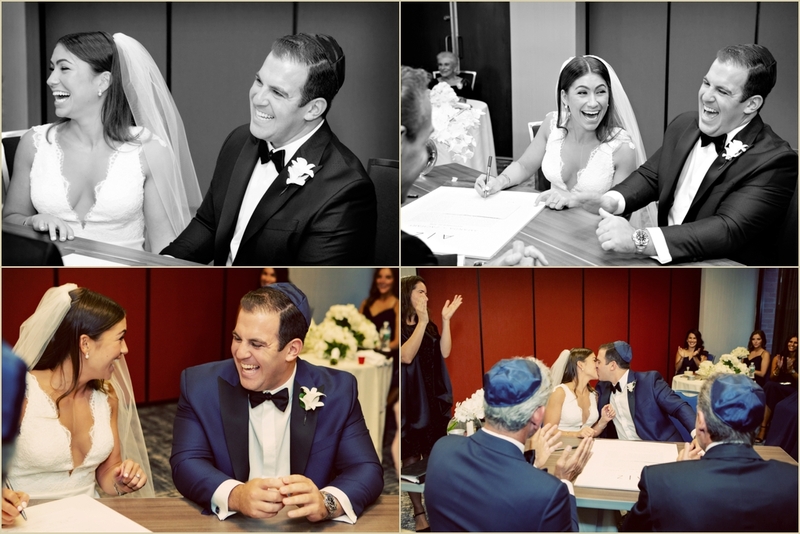 Before the ceremony, the couple had an intimate and beautiful ketubah signing, along with the traditional bedeken. 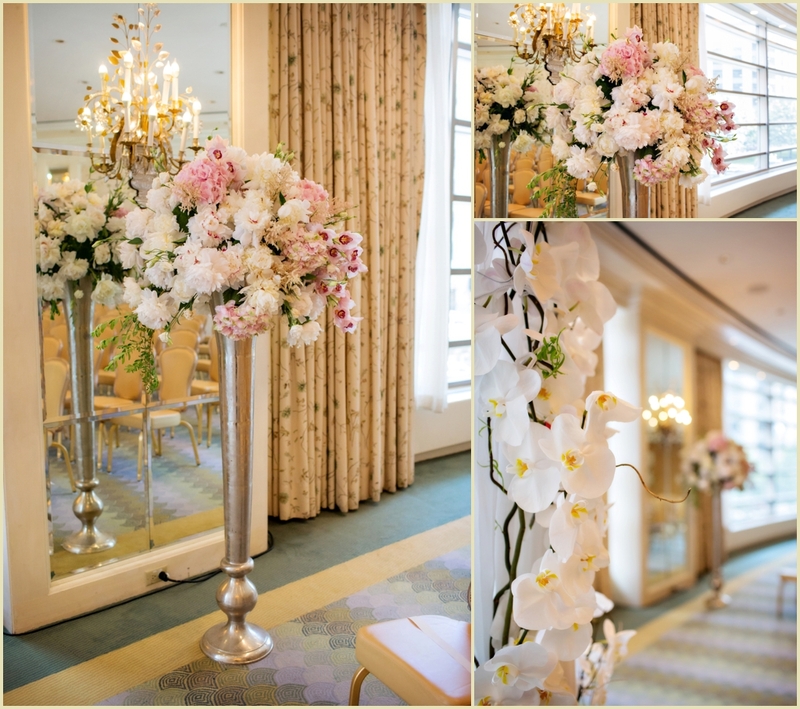 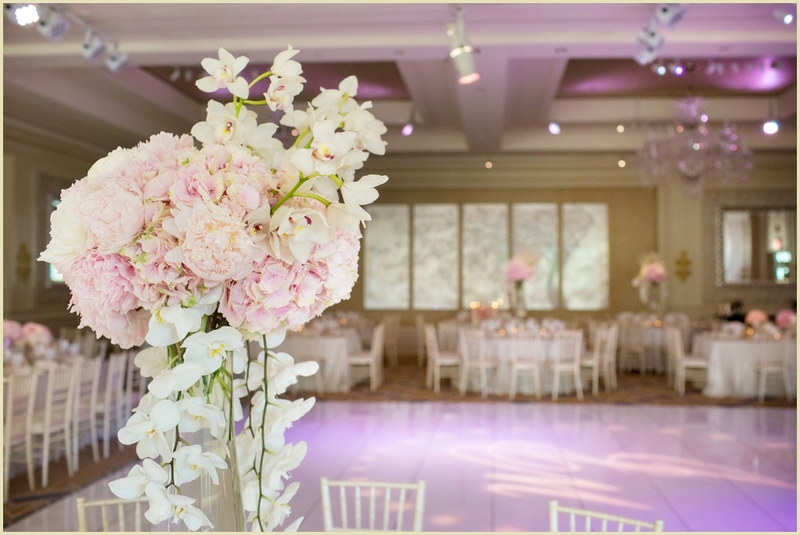 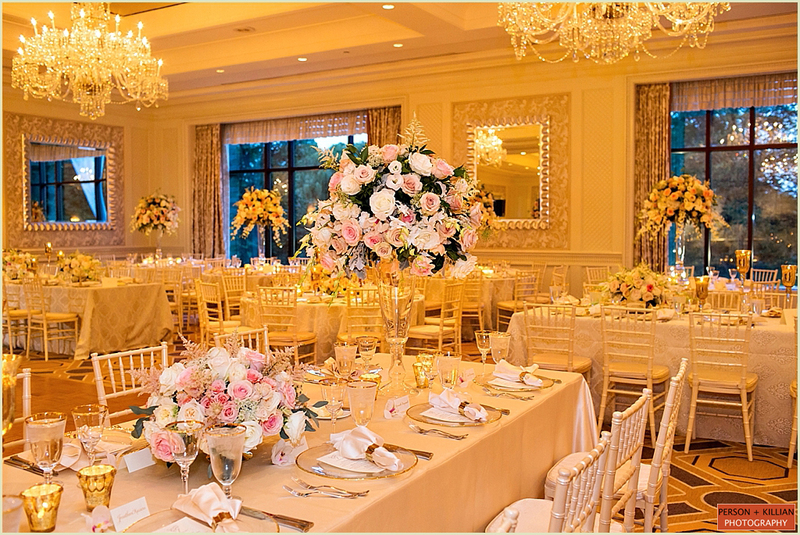 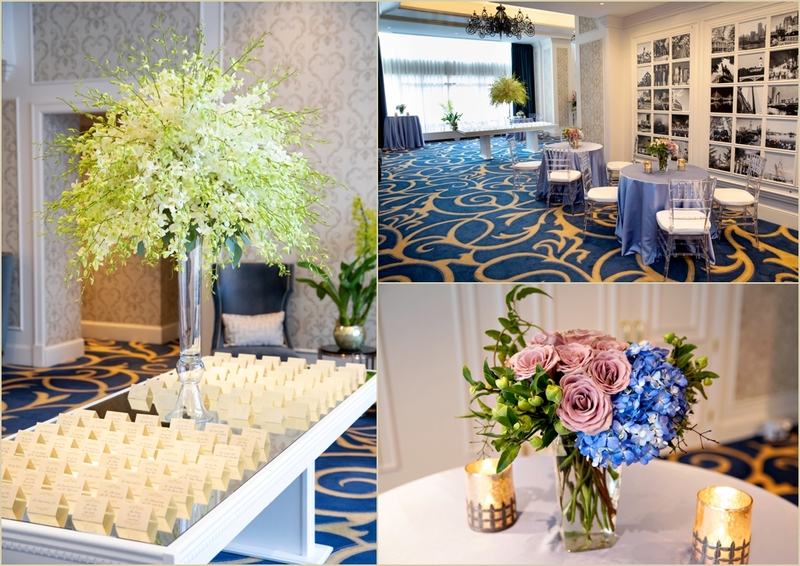 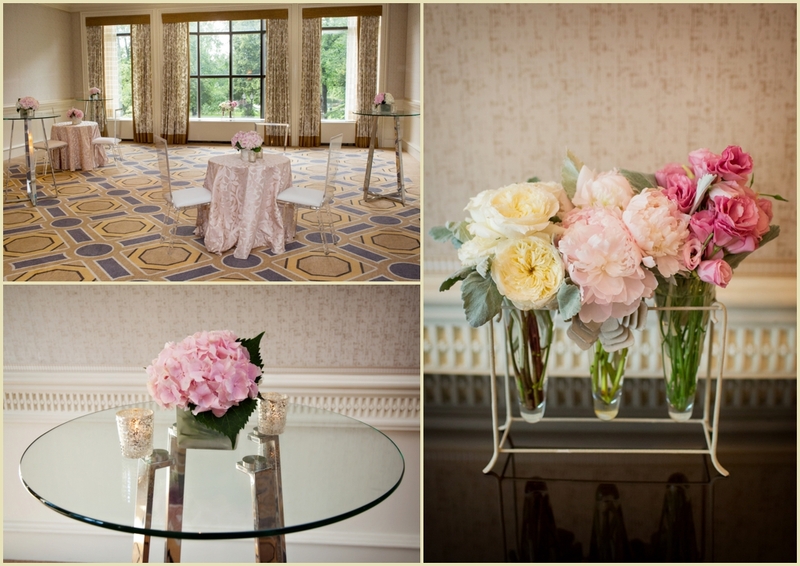 Stunning floral arrangements from Carol Silverston and her team at the Original Touch filled both the ballrooms and hallways in varying tones of green, pink and cream. 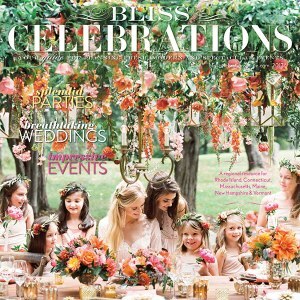 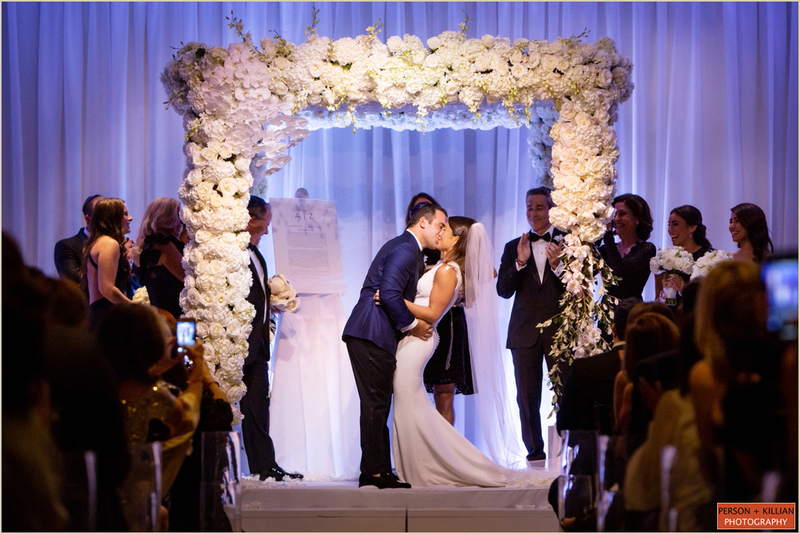 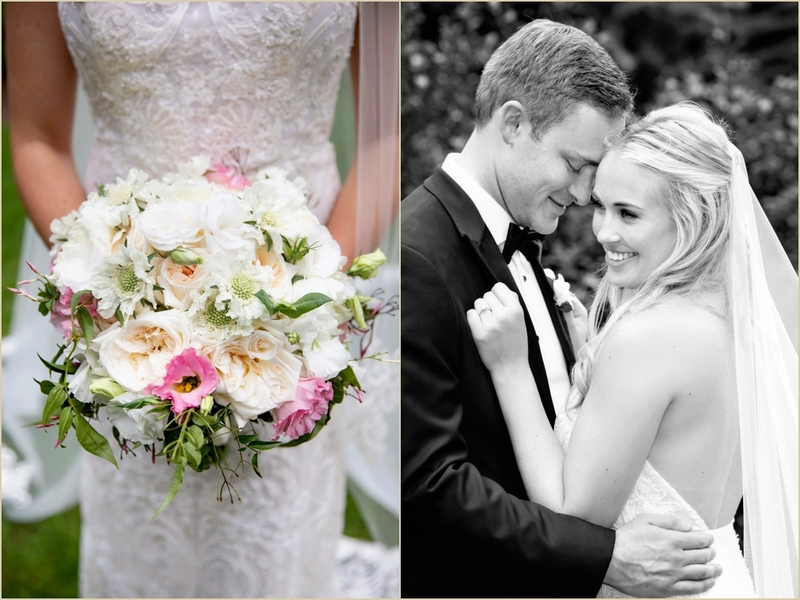 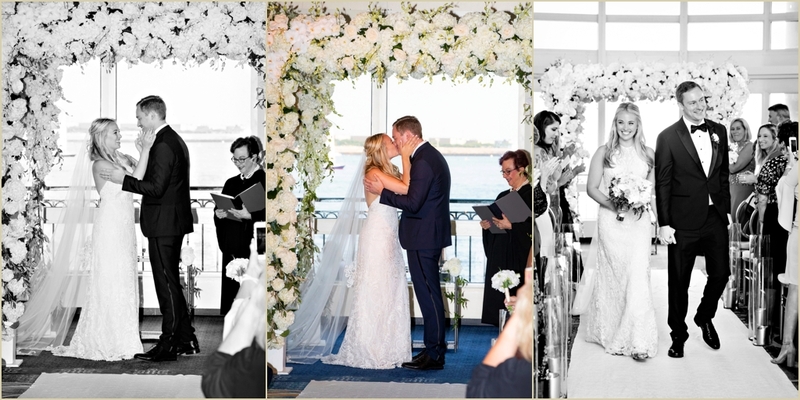 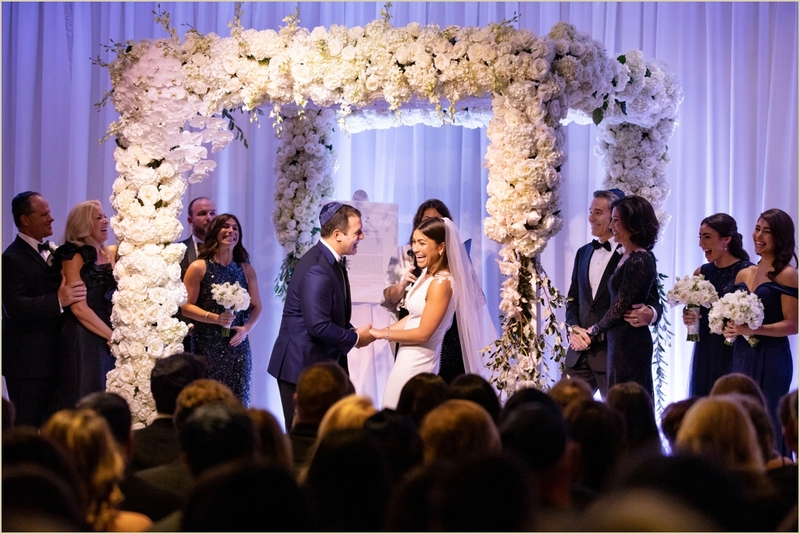 The ceremony chuppah was adorned with white orchids and brushed metal floor vases around the room were filled with Jamie’s favorite flowers – pink and cream peonies. 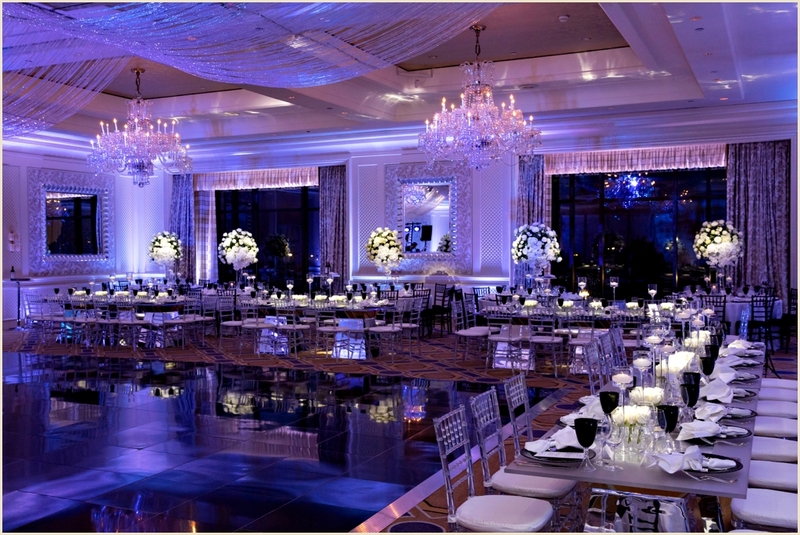 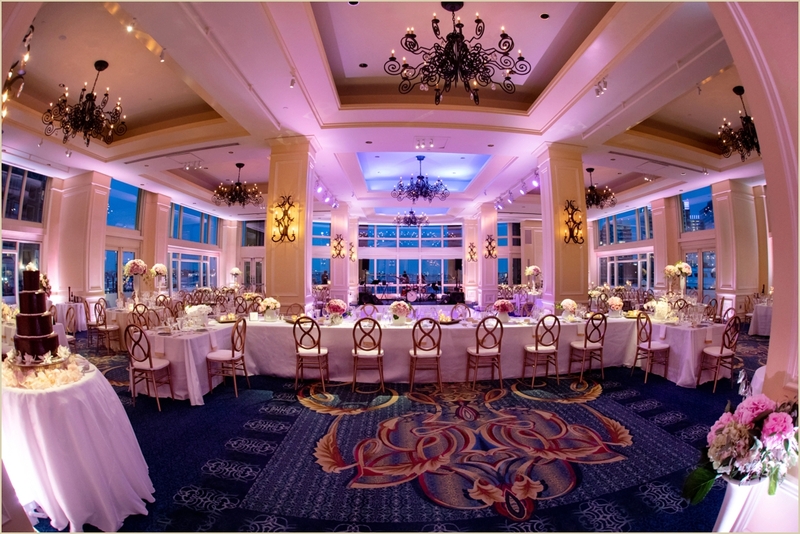 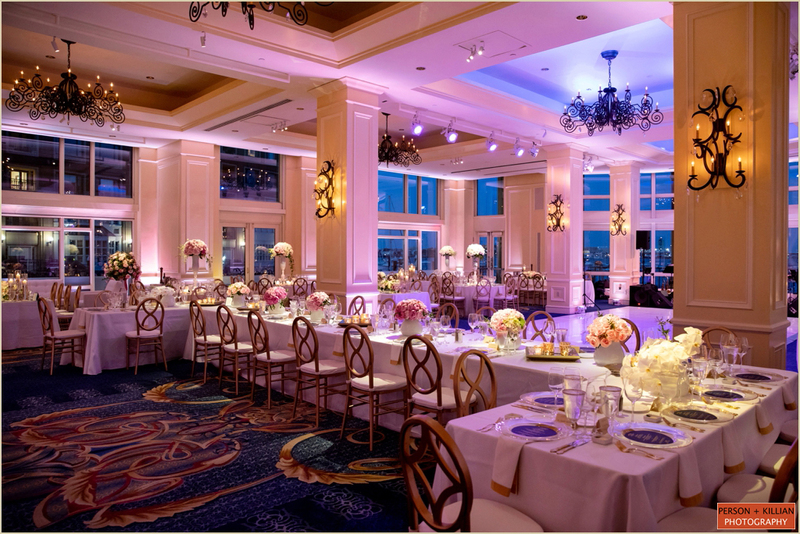 For the reception, the ballroom was filled with soft purple lighting. 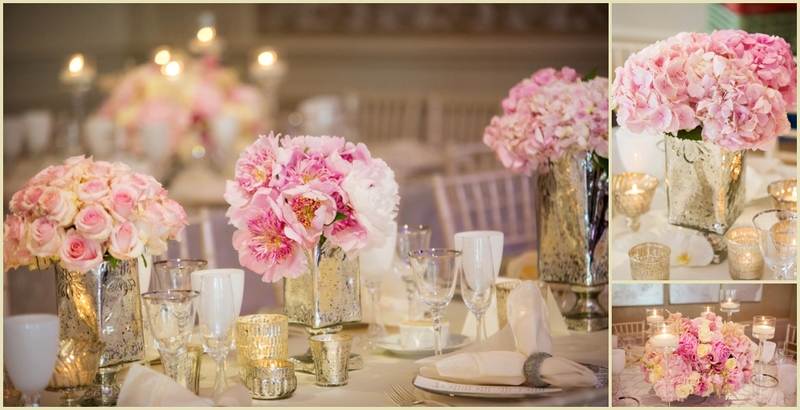 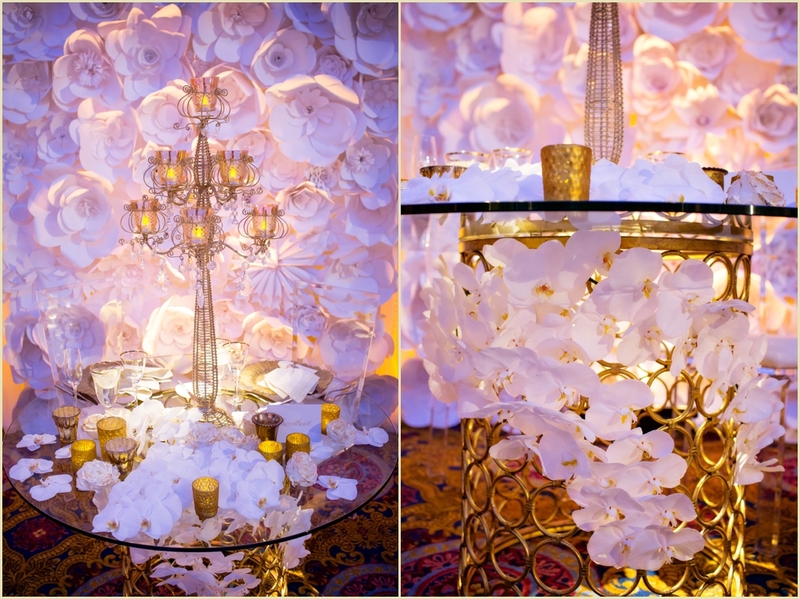 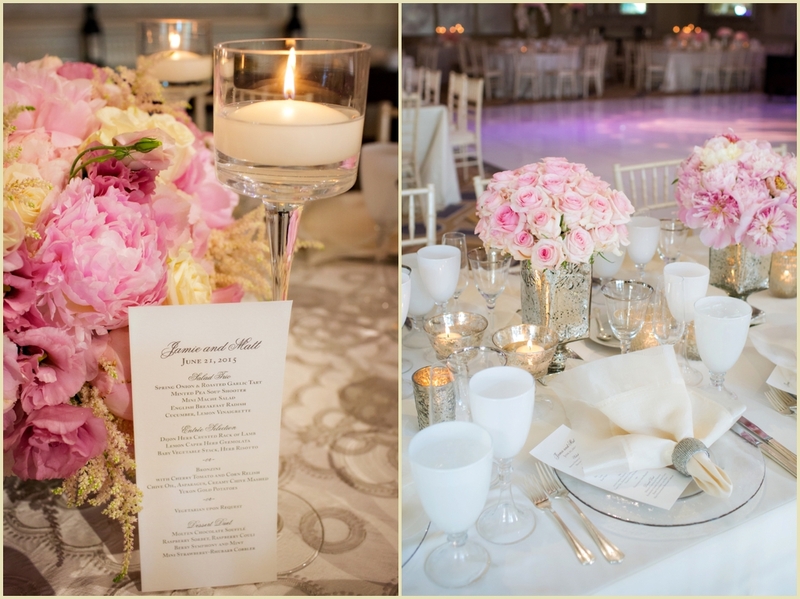 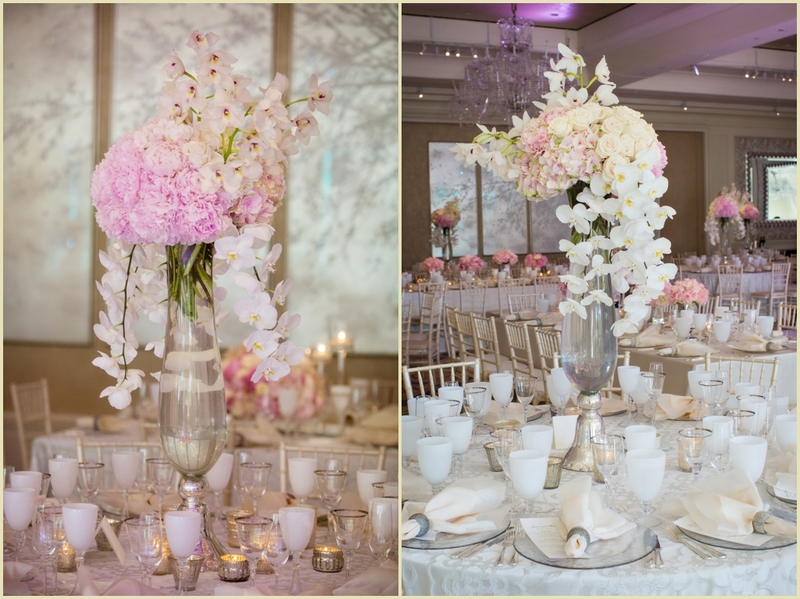 The mercury glass and clear glass vessels sparkled with the luscious white and pink flowers including peonies and cascading orchids. 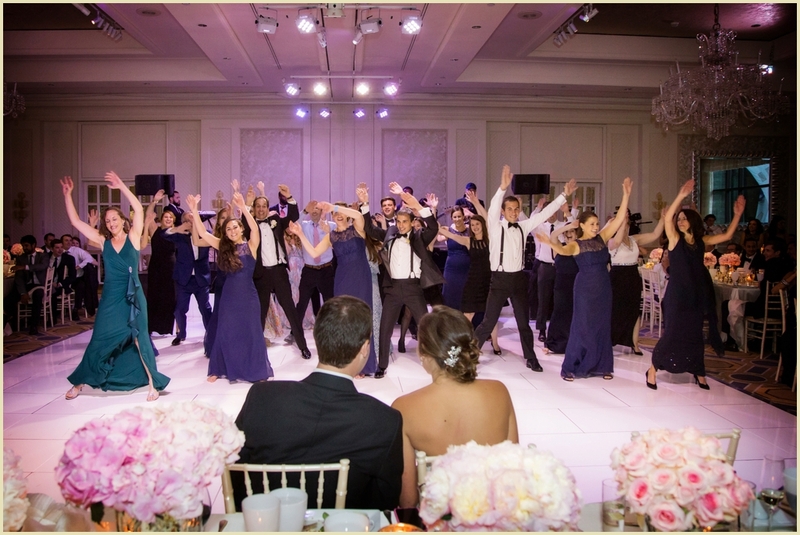 Following the energetic hora and the blessing of the challah bread, was a surprise fully choreographed flash mob. 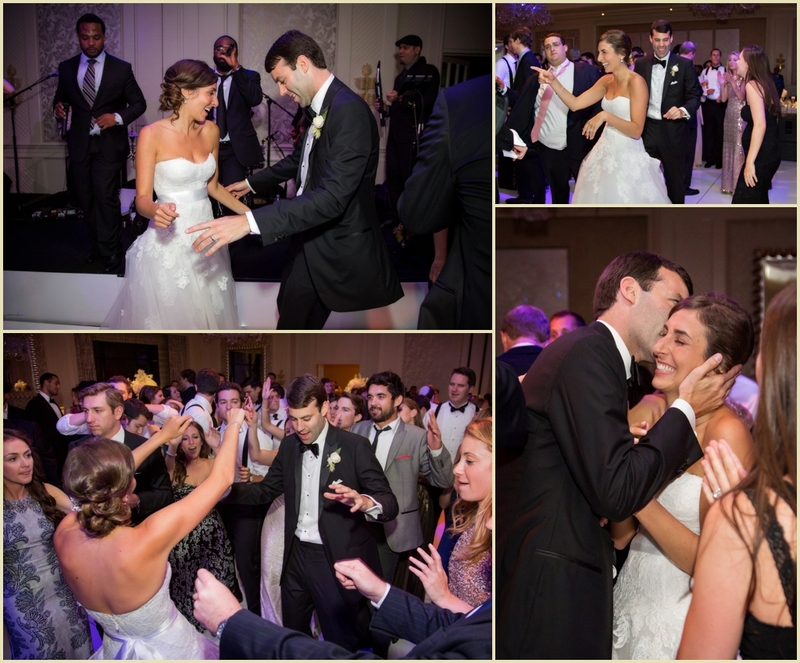 Secretly planned by about 30 of Jamie and Matt’s family and friends, the couple was thrilled by the dance (and it made for some great photographs)! 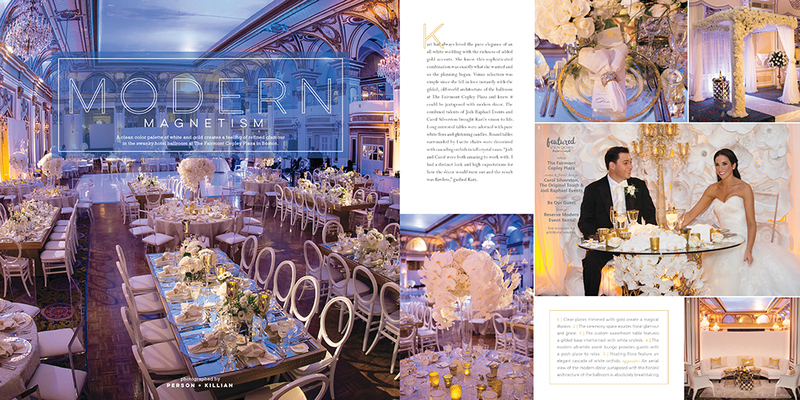 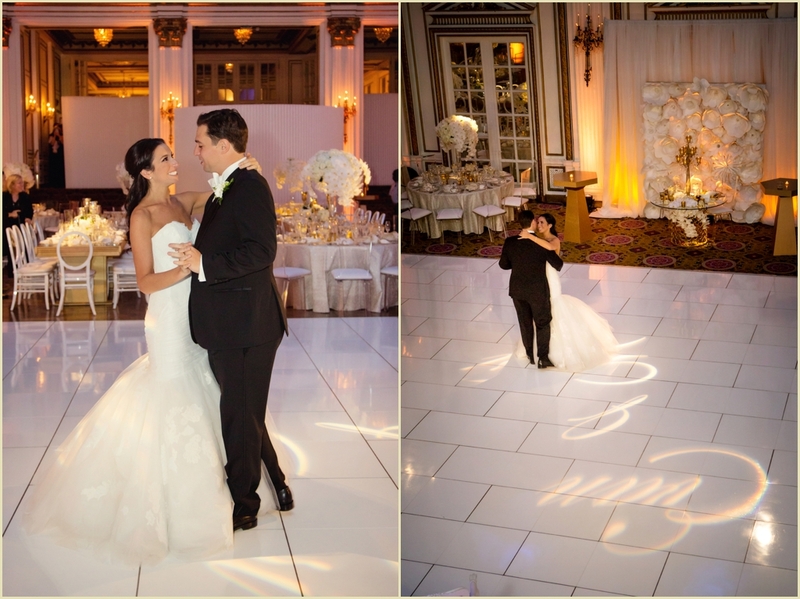 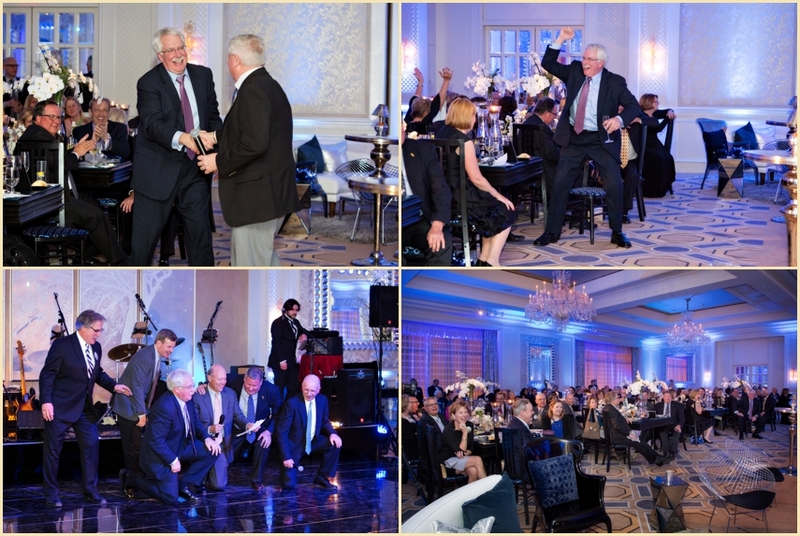 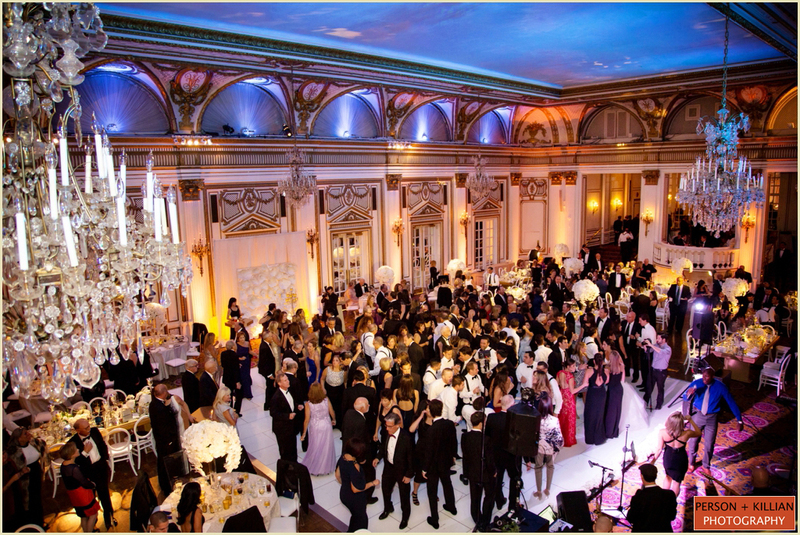 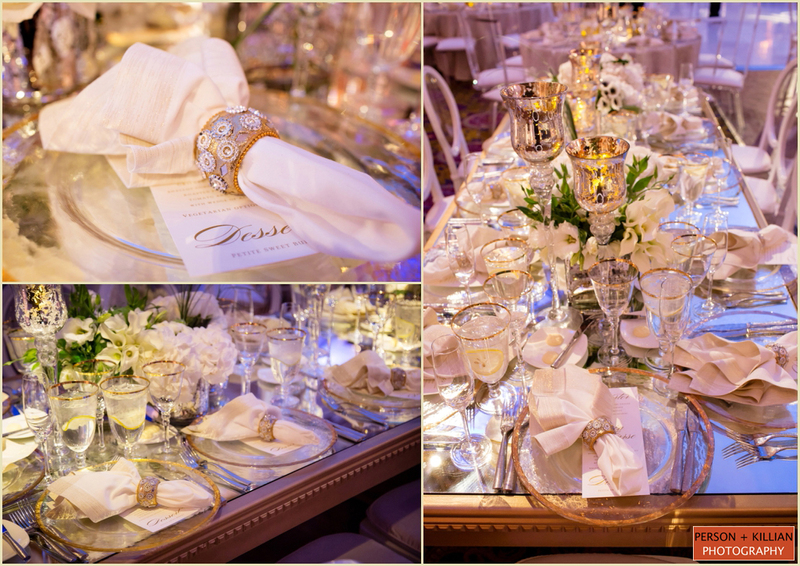 The shining white dance floor with the couple’s monogram was underfoot as the guests celebrated and danced the night away. 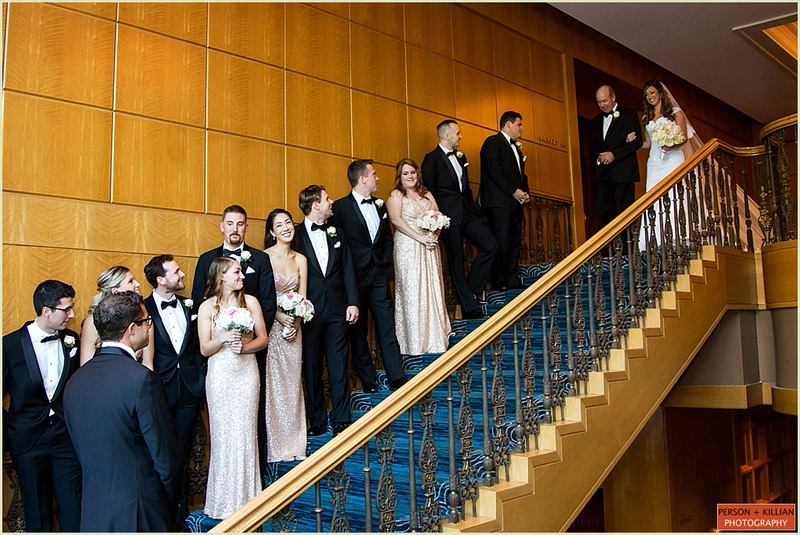 Congratulations Jamie and Matt! 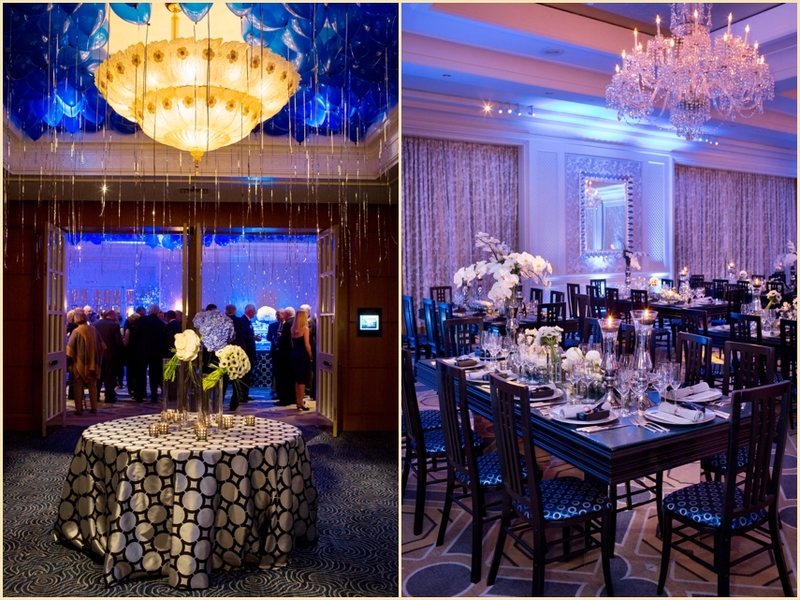 Thank you to Philip Deschamps and his team at the Four Seasons for a perfectly planned evening and Carol Silverston and her team at the Original Touch. 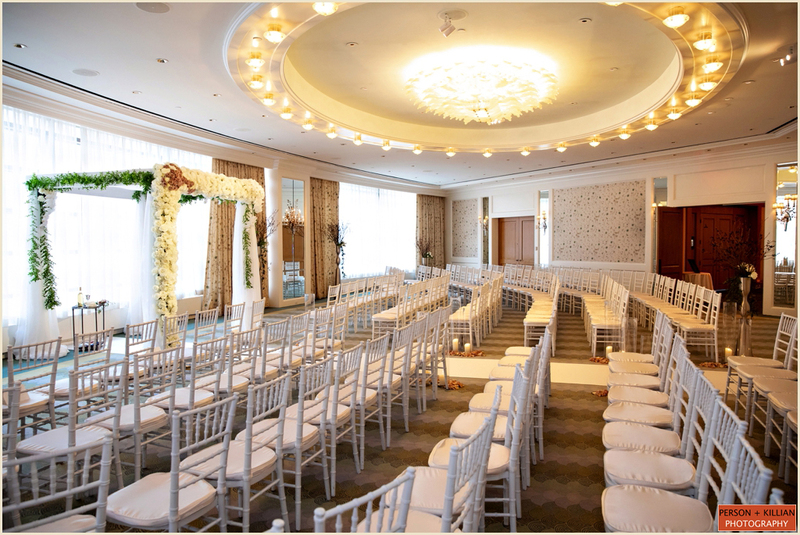 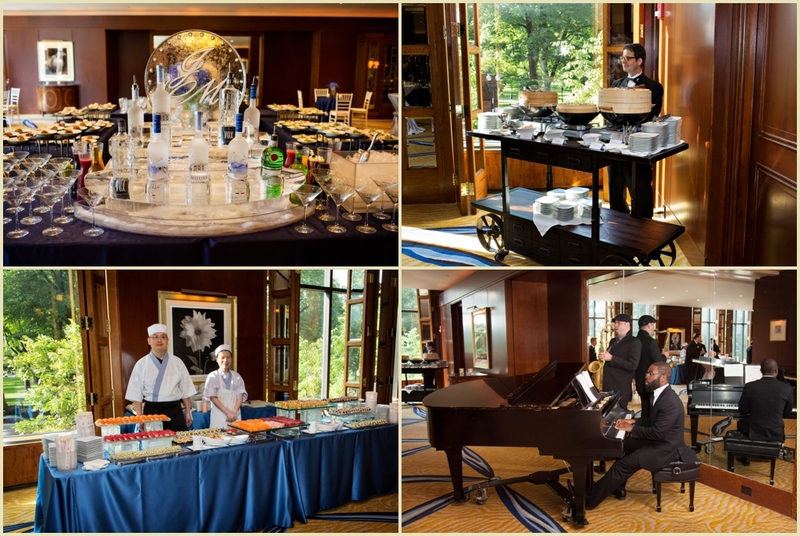 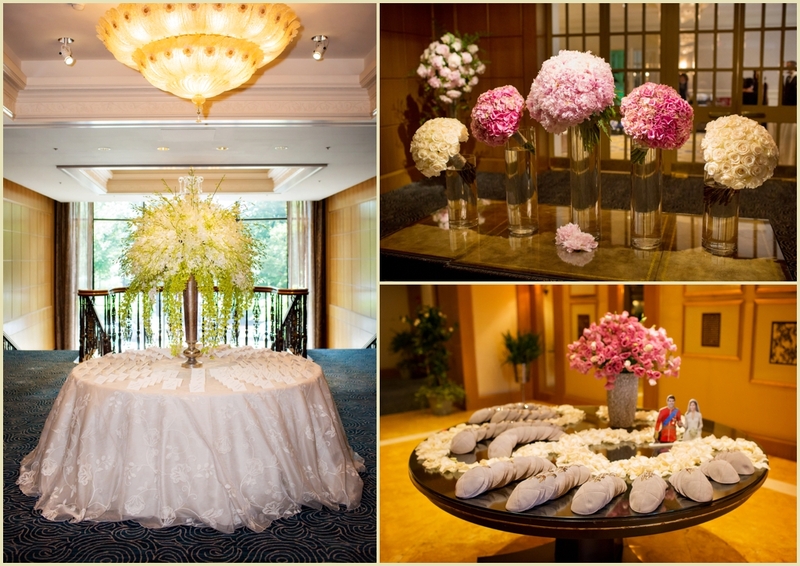 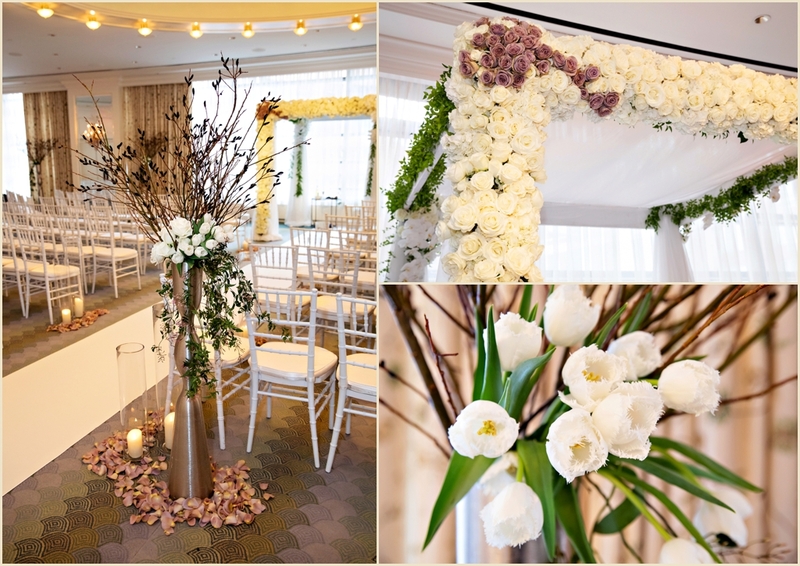 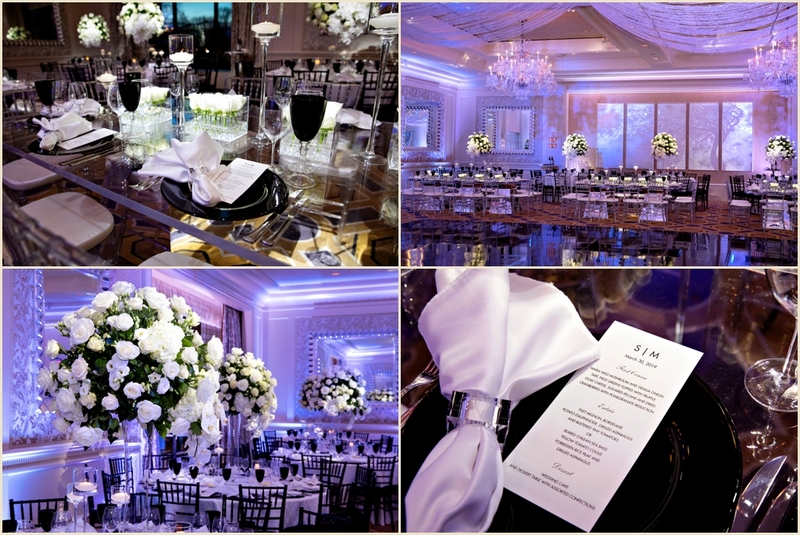 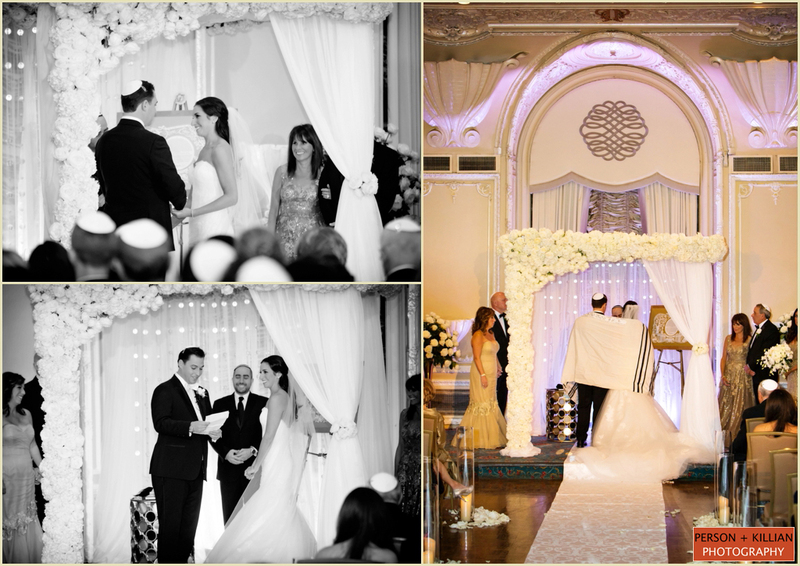 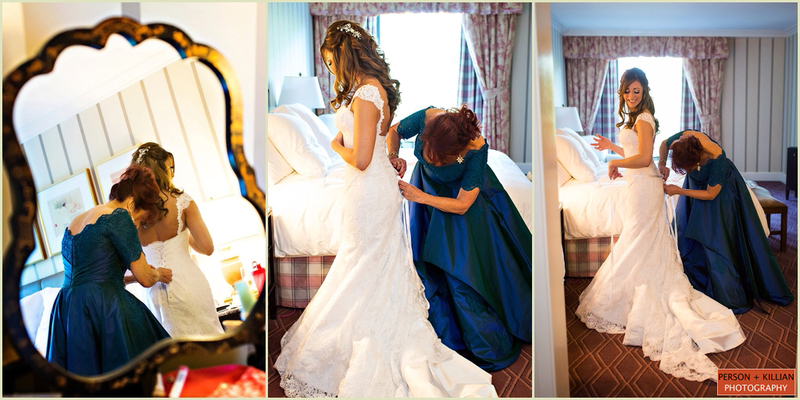 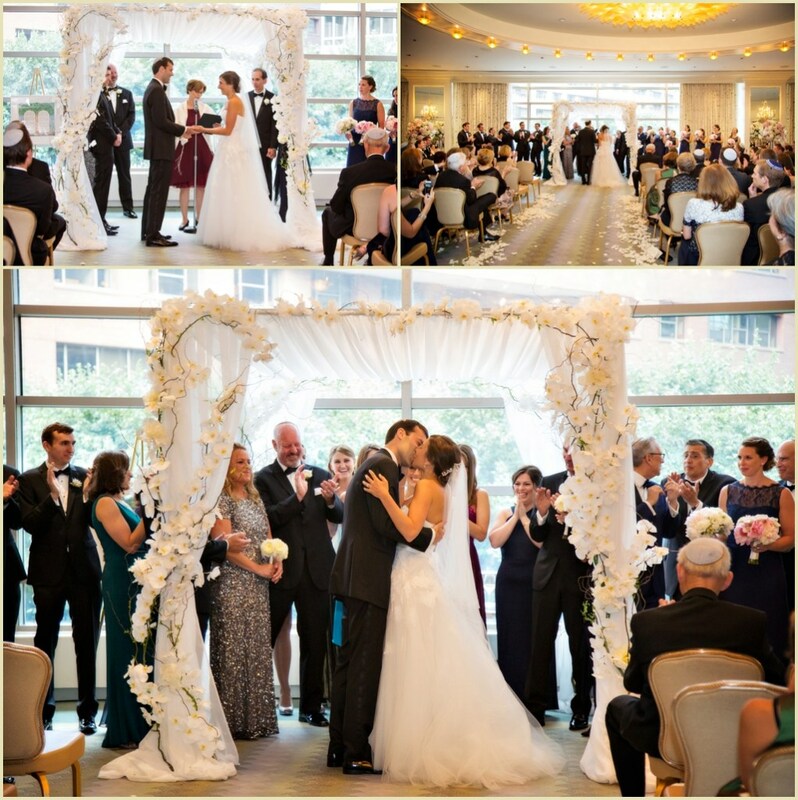 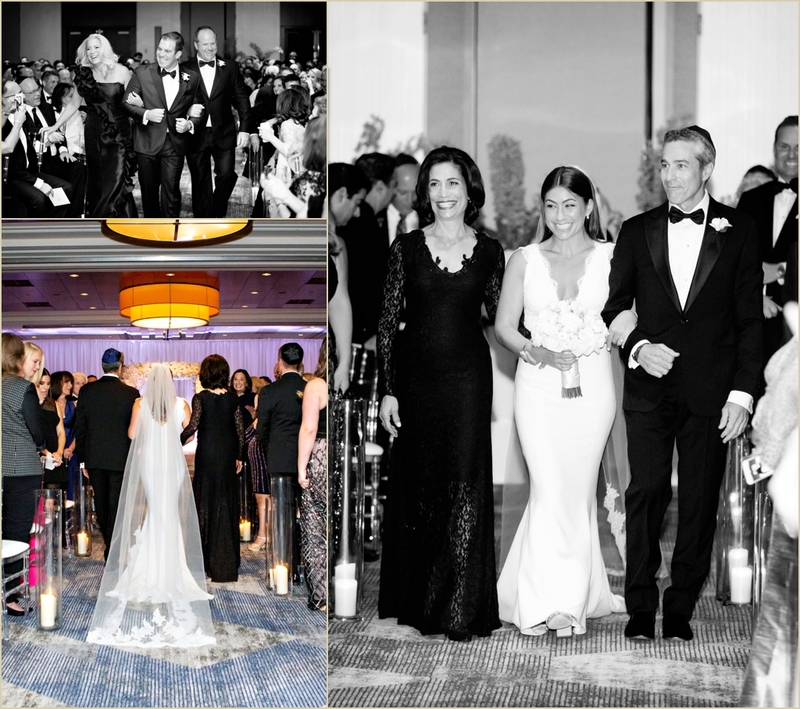 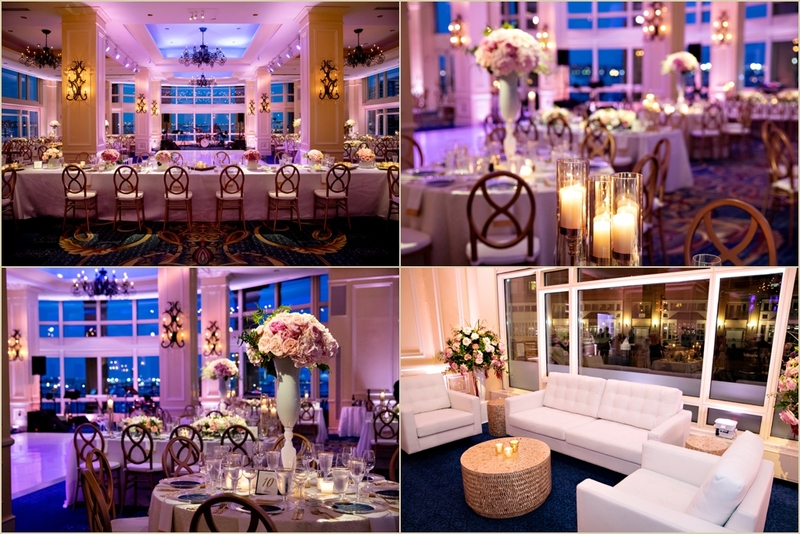 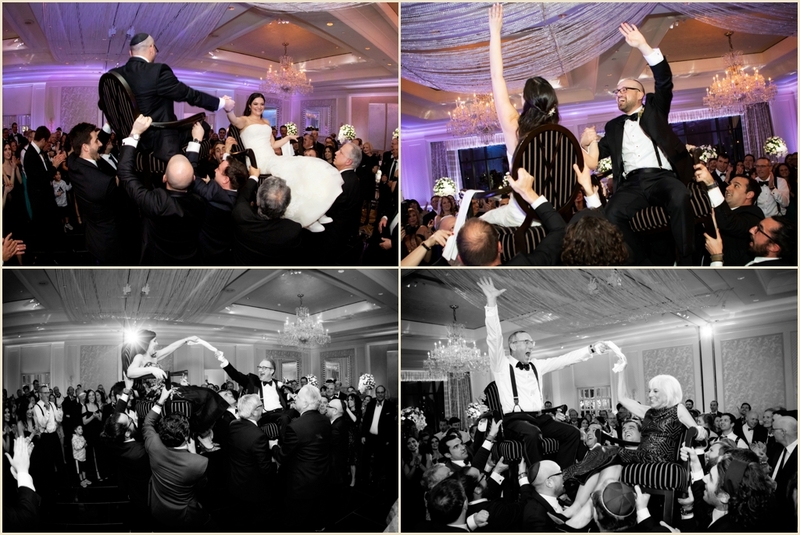 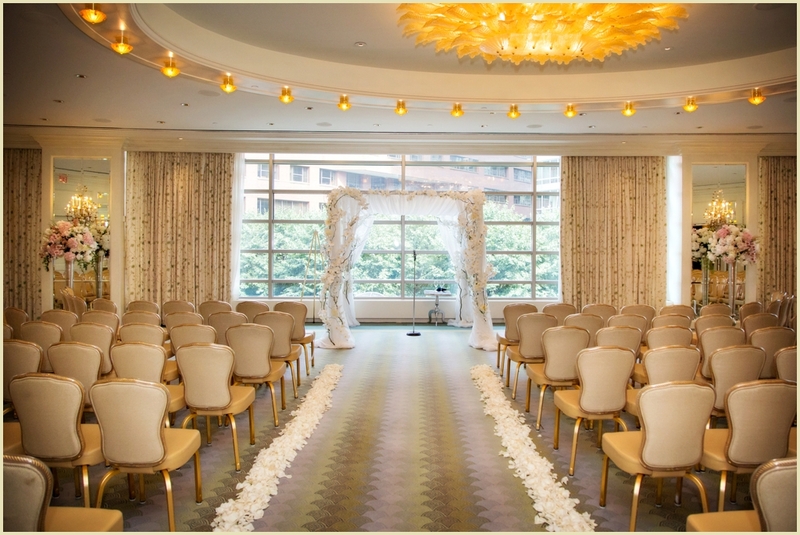 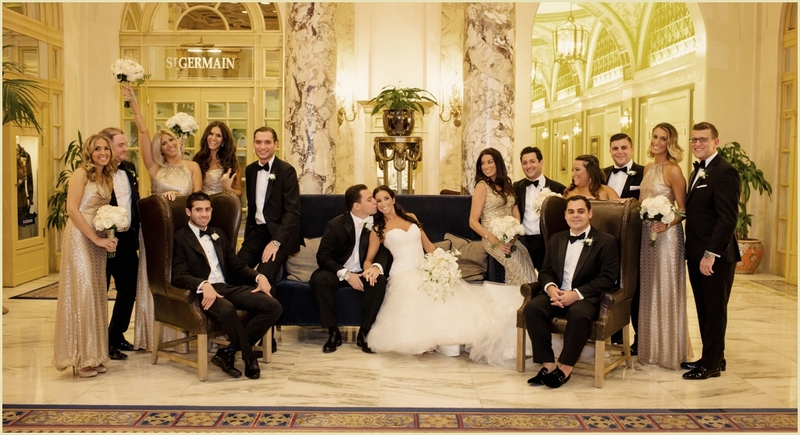 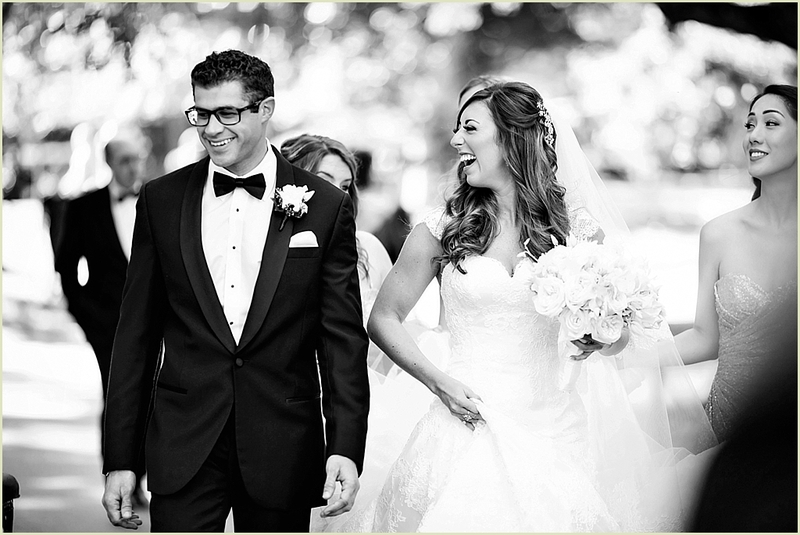 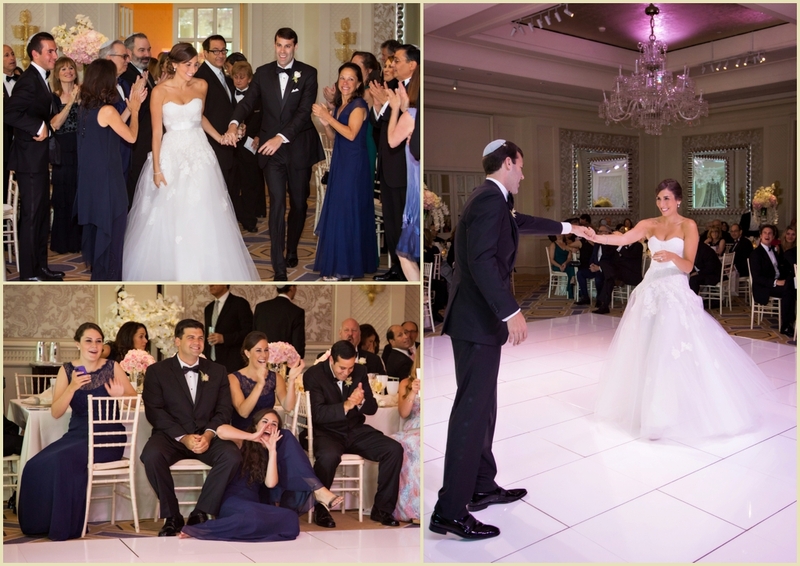 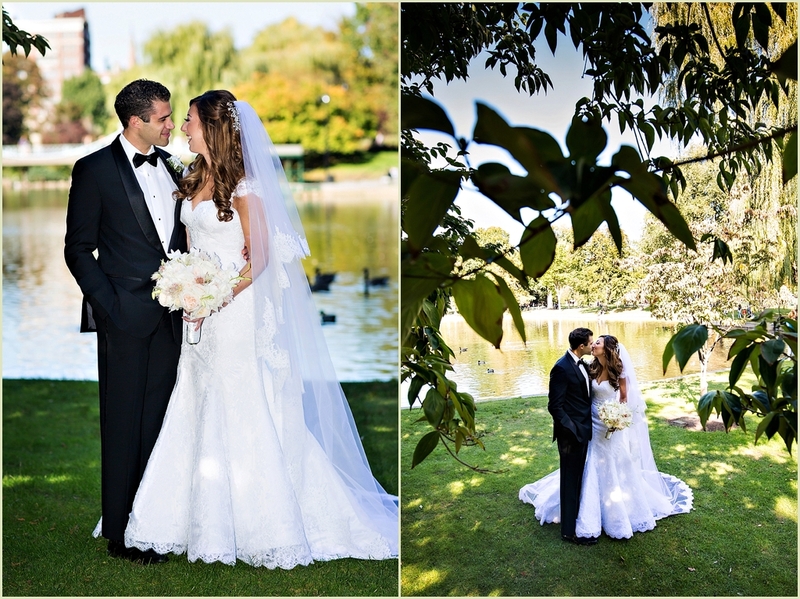 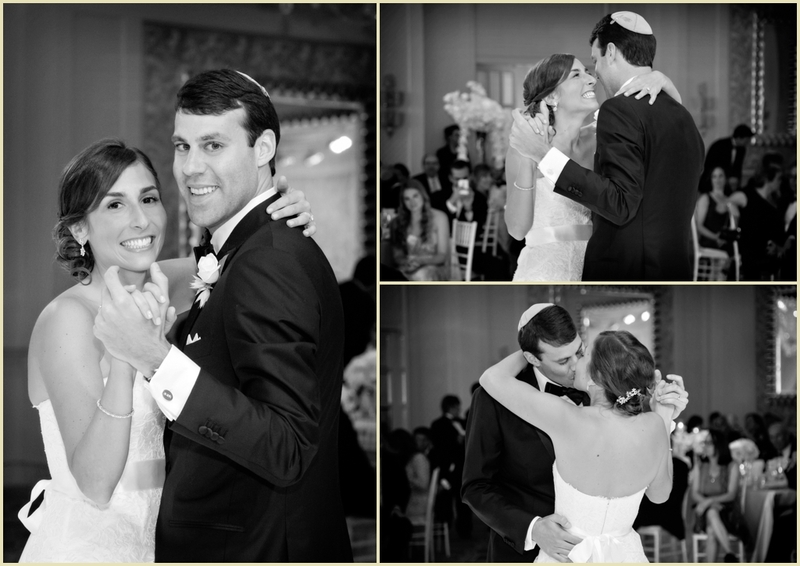 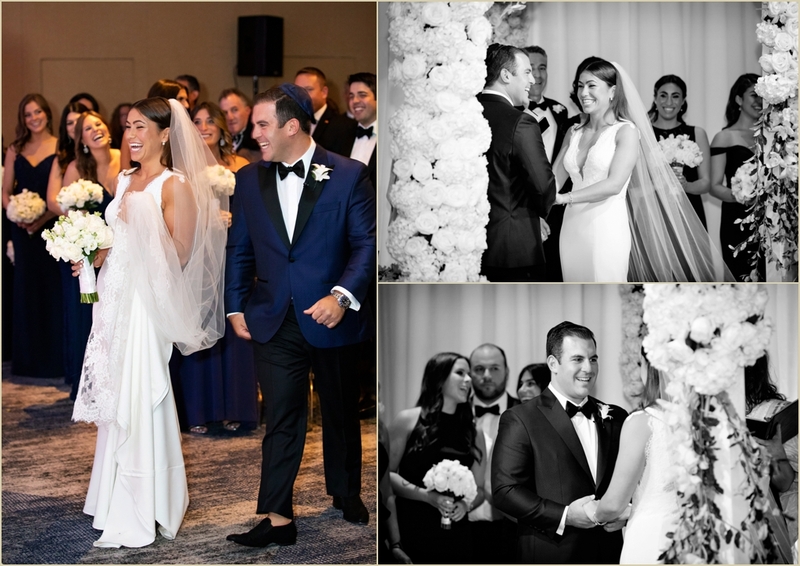 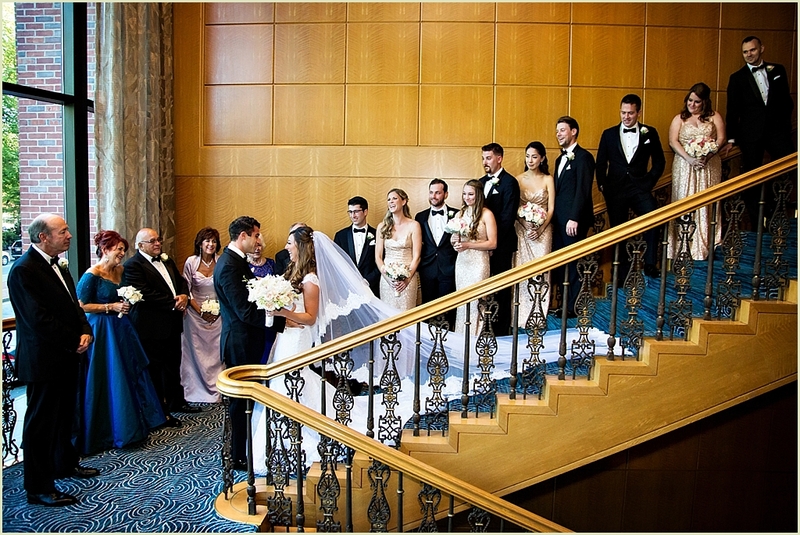 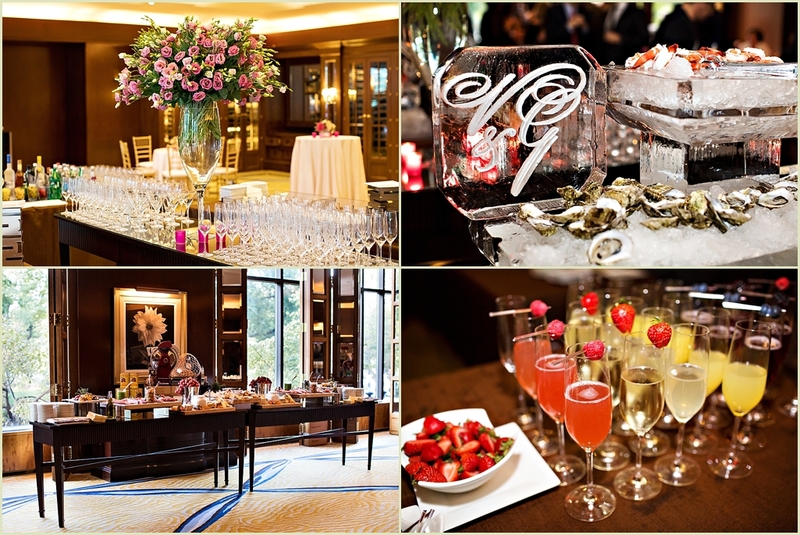 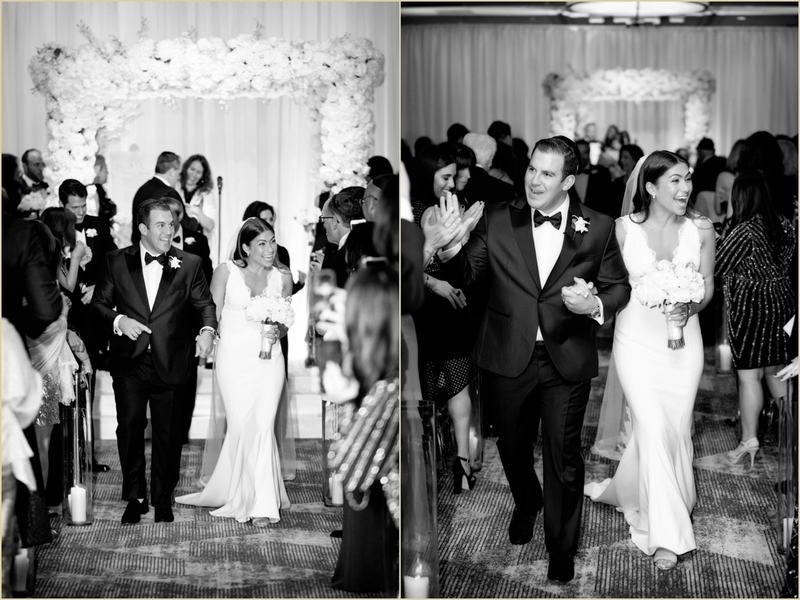 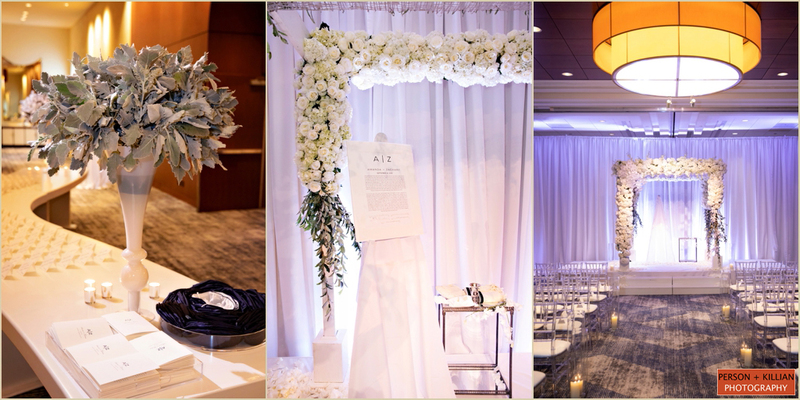 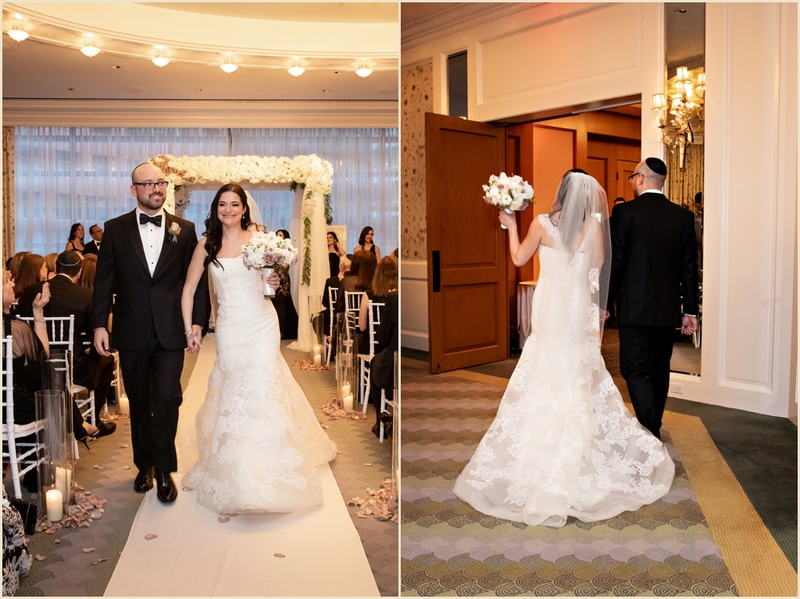 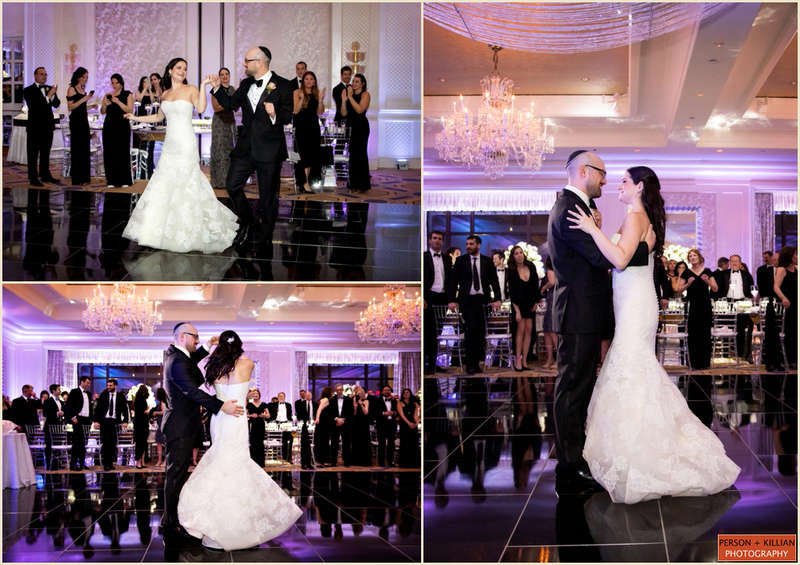 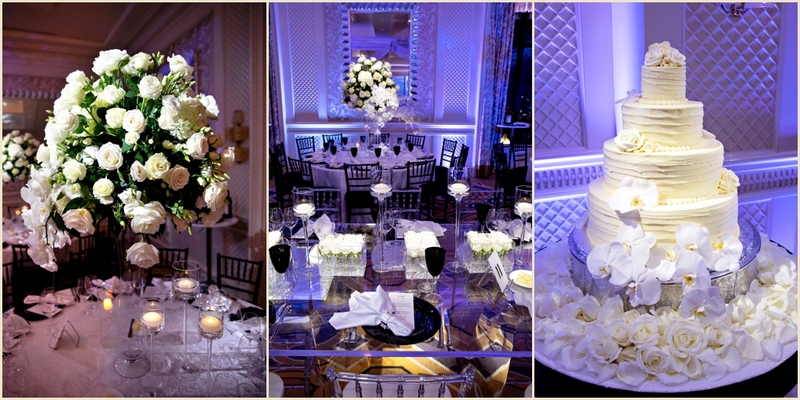 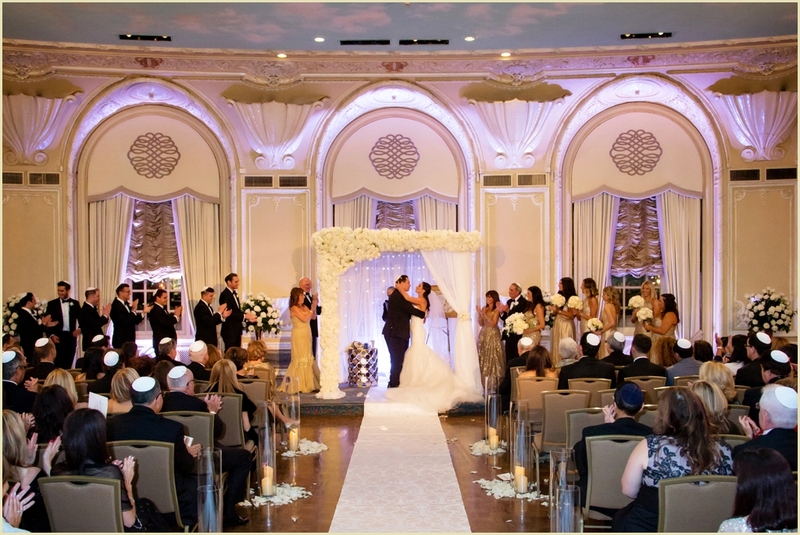 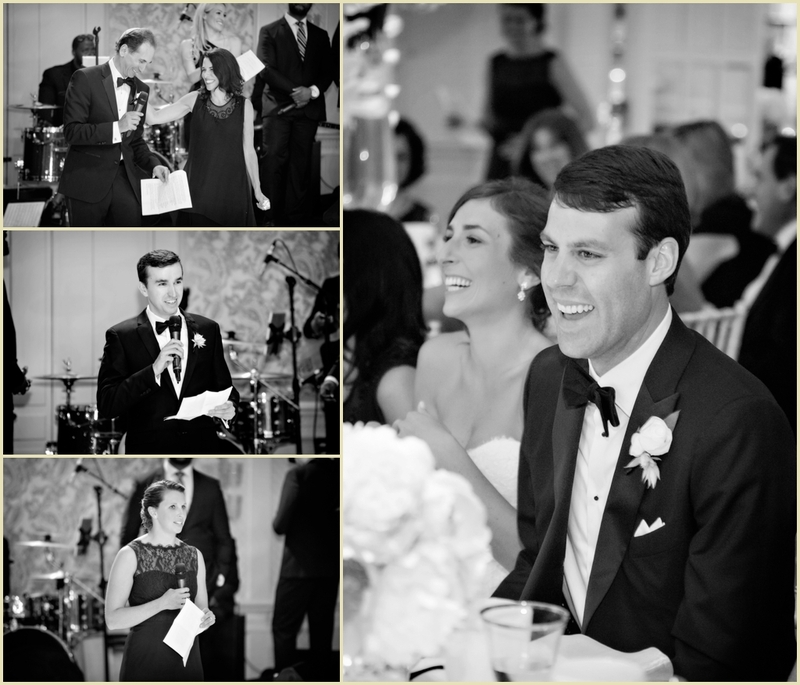 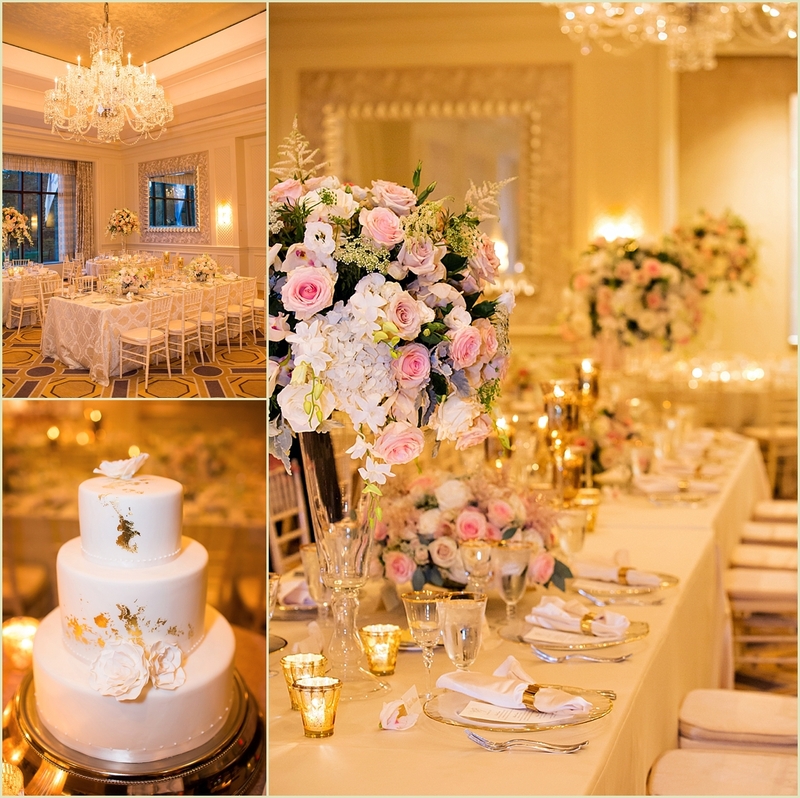 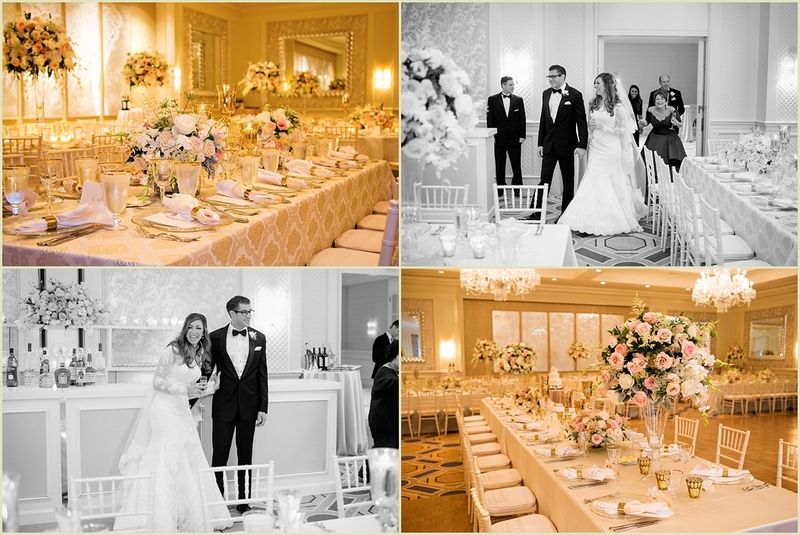 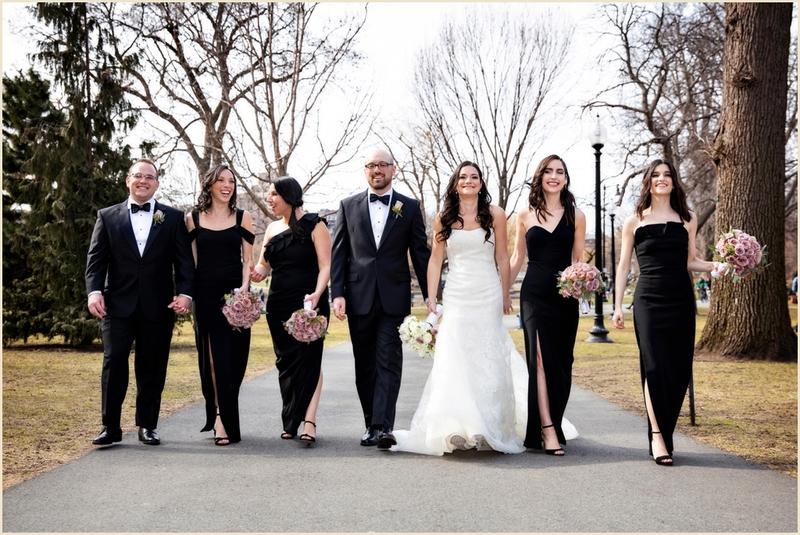 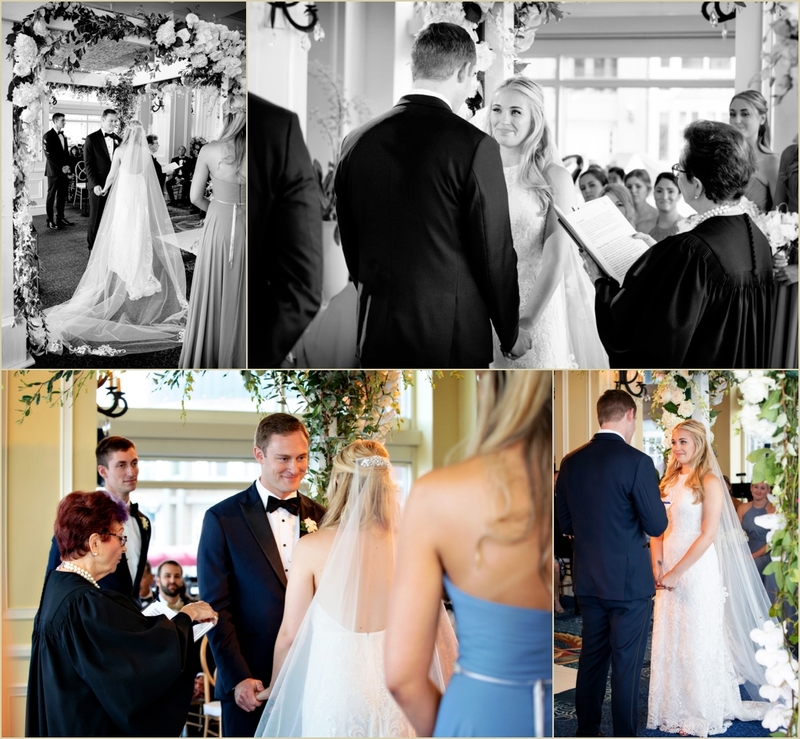 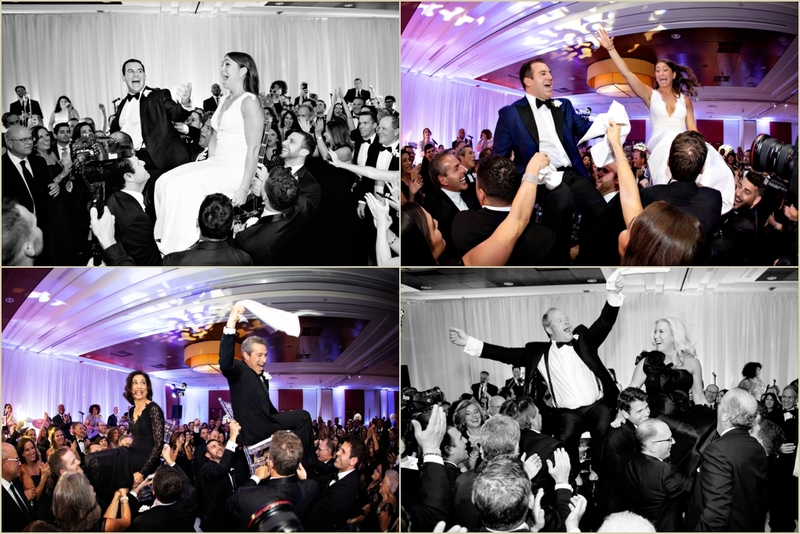 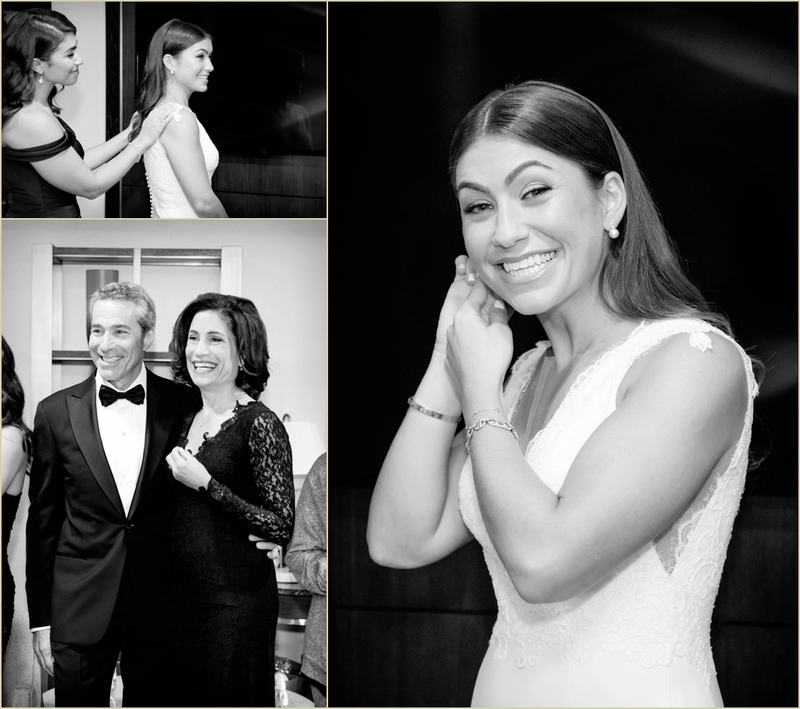 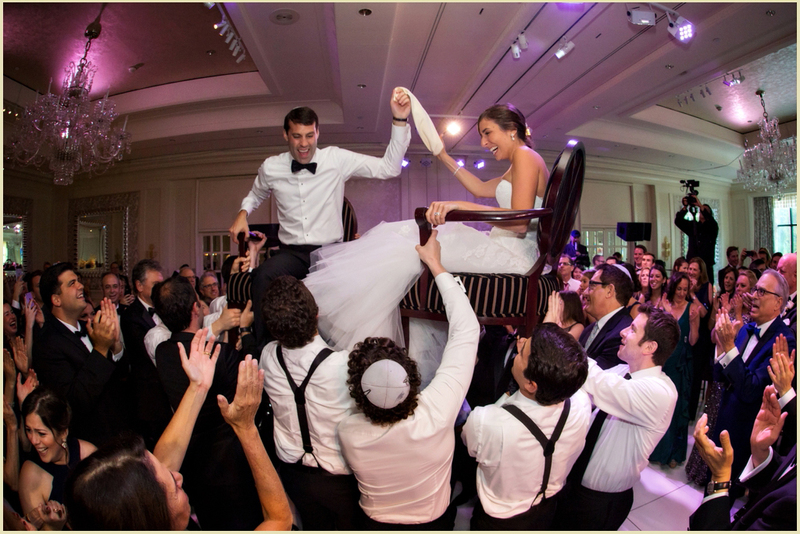 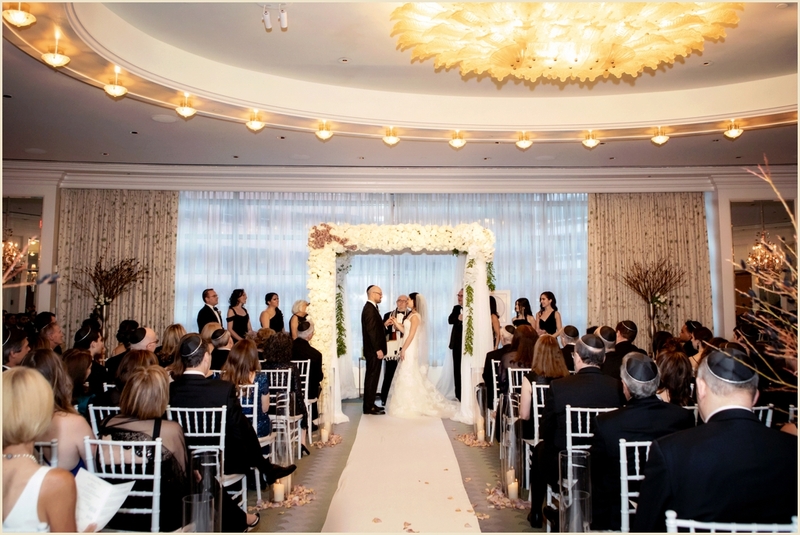 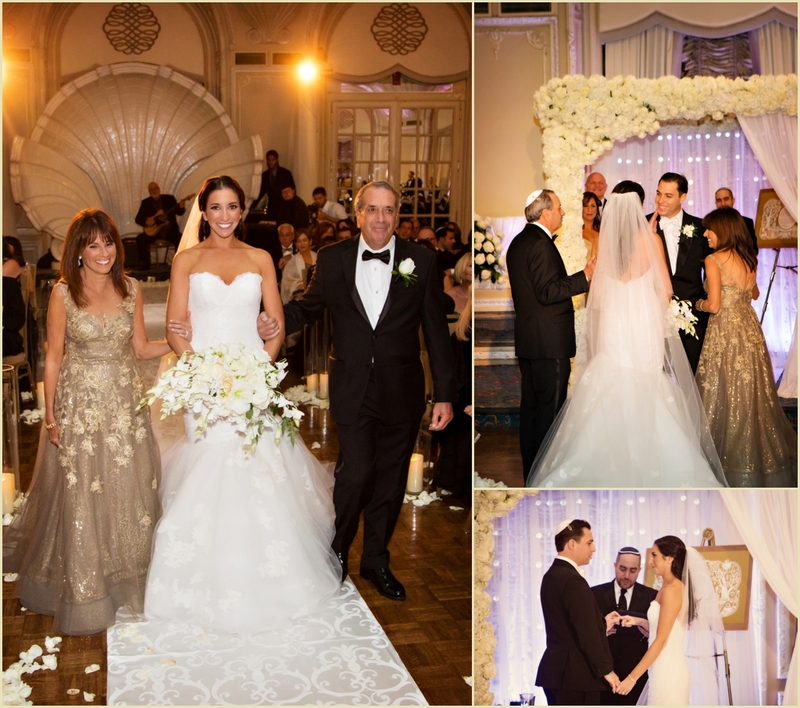 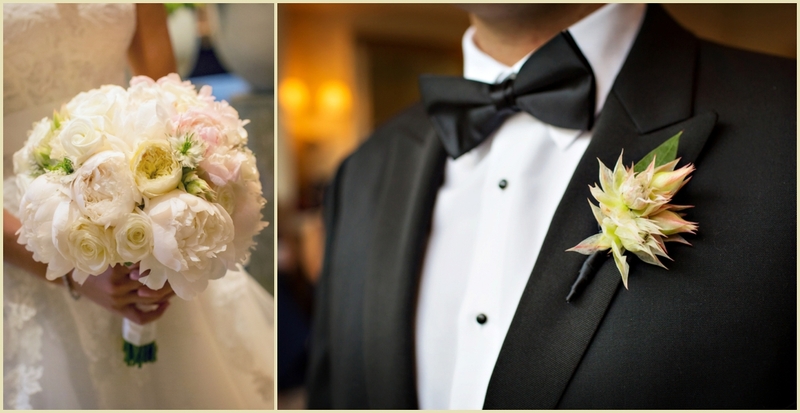 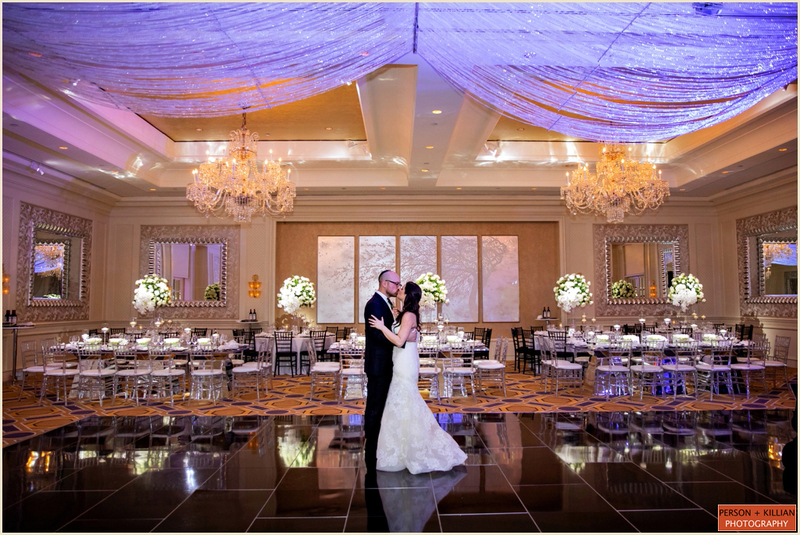 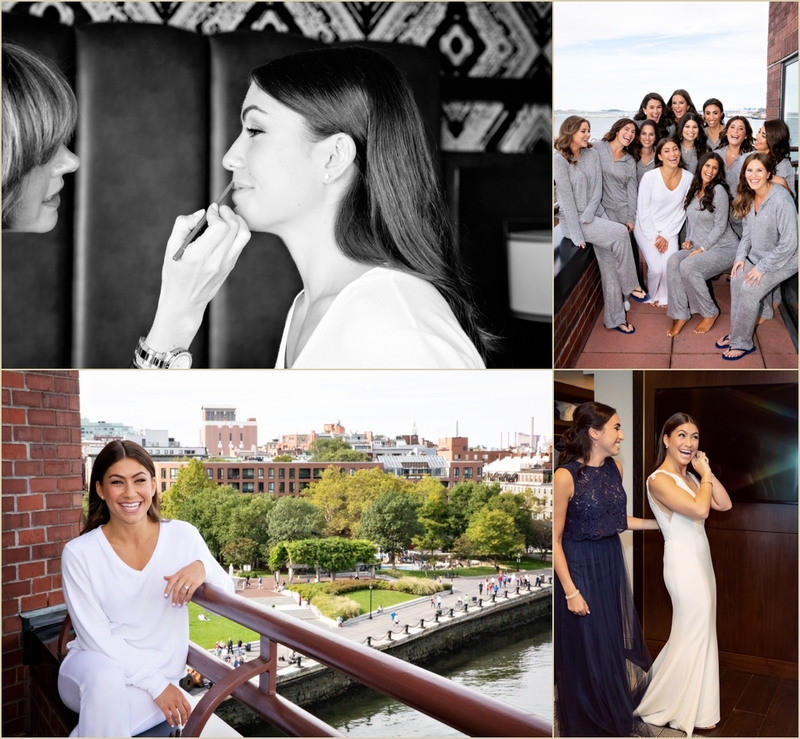 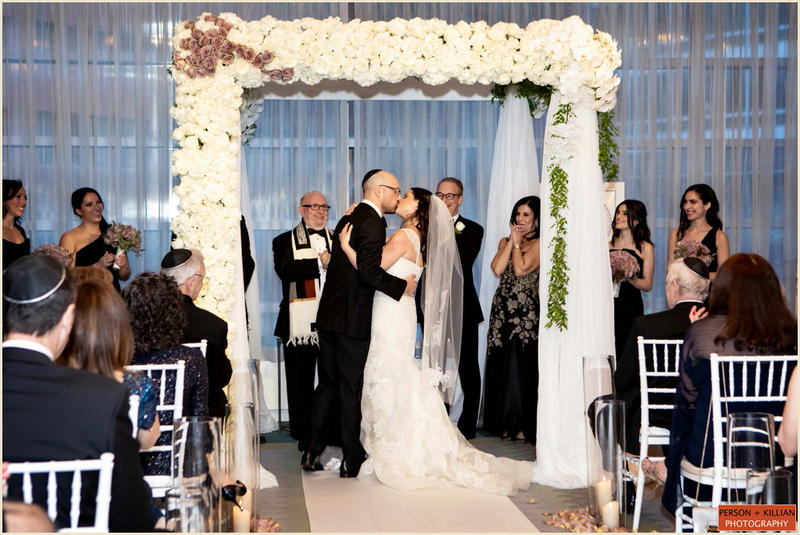 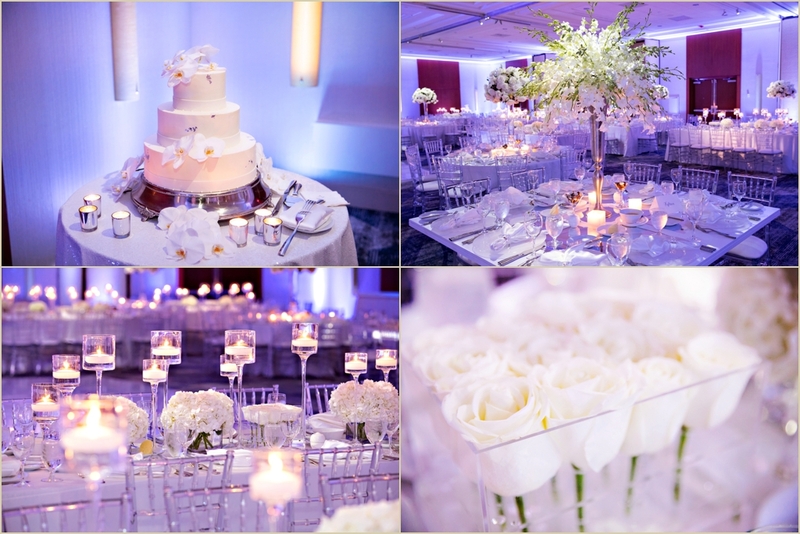 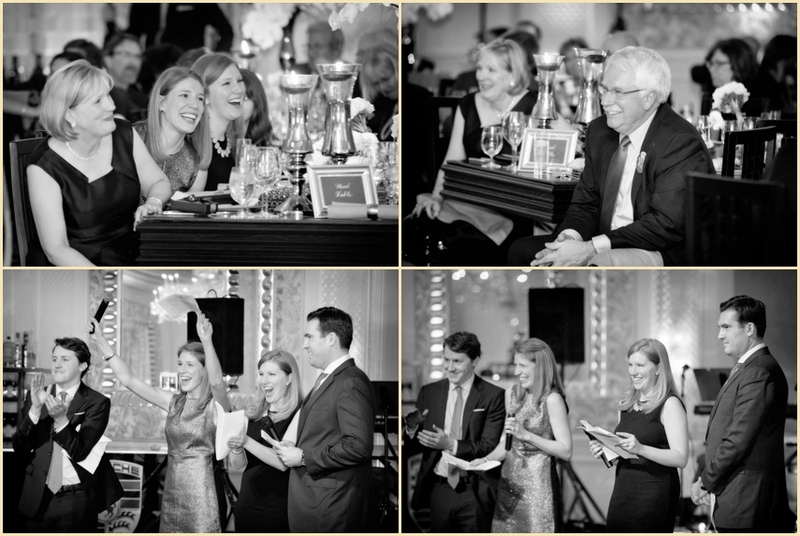 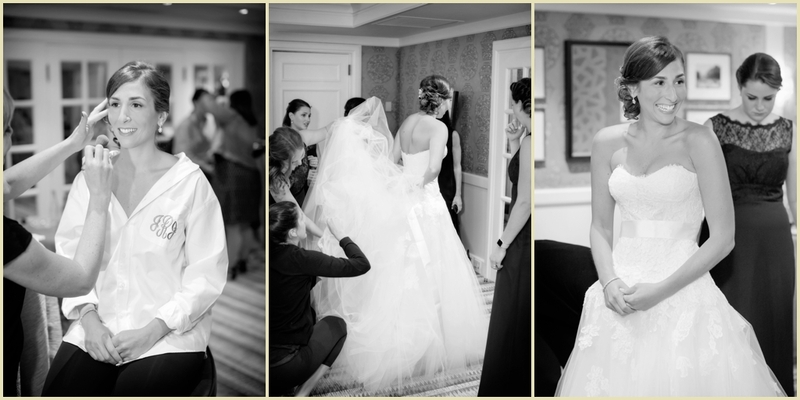 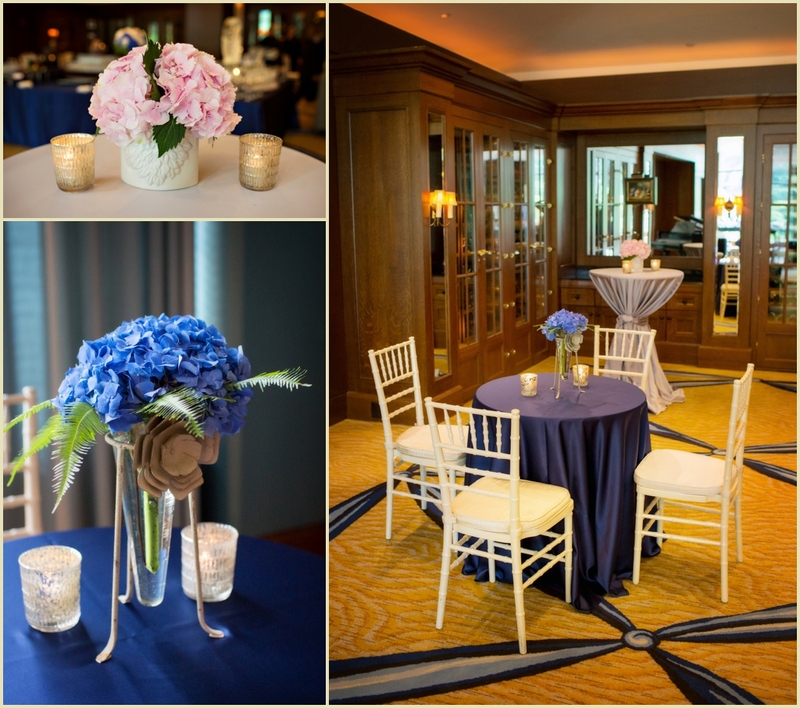 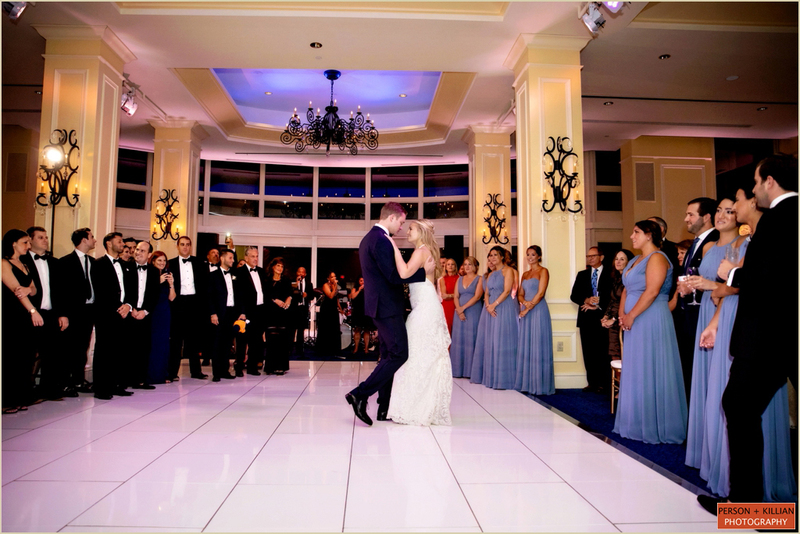 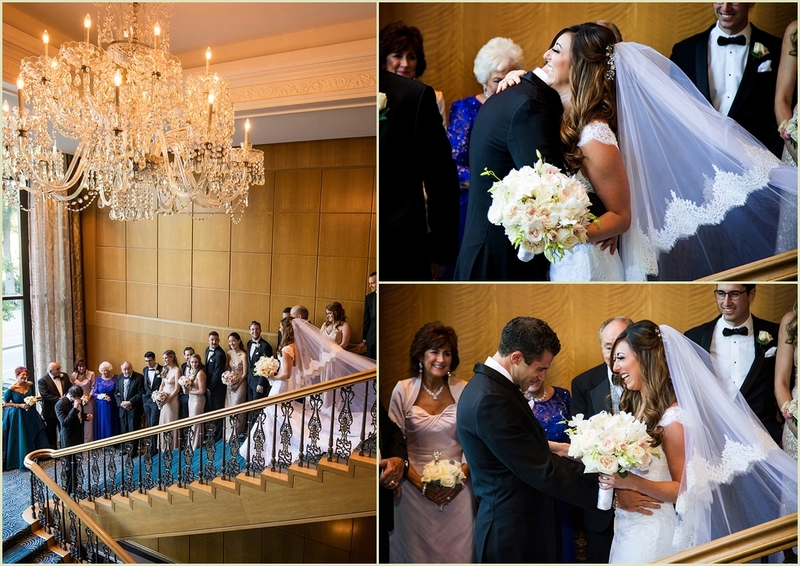 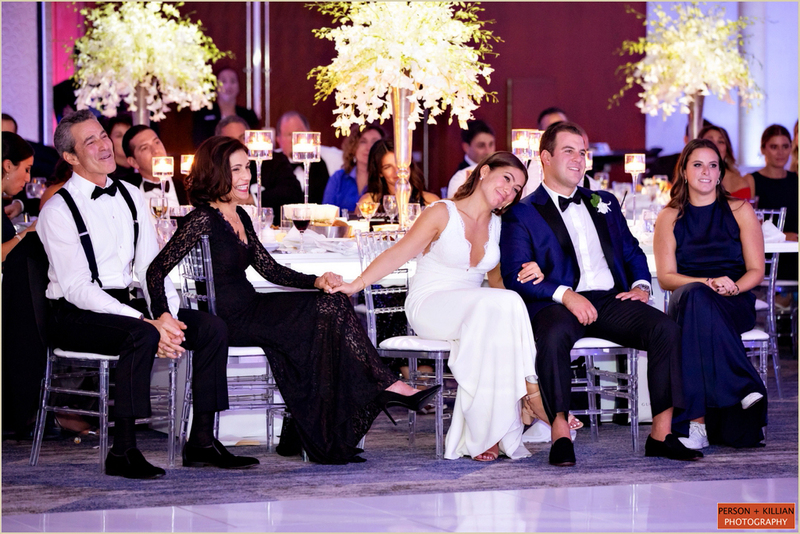 A Traditional Jewish Wedding at the Four Seasons Boston. 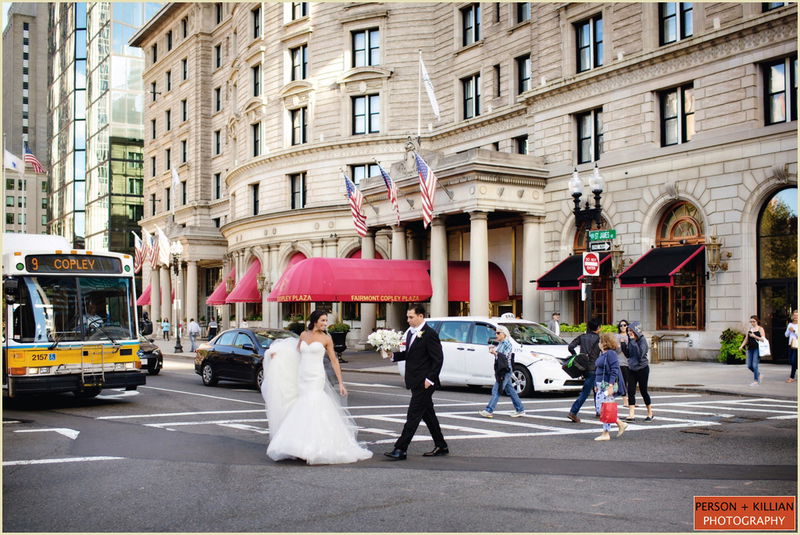 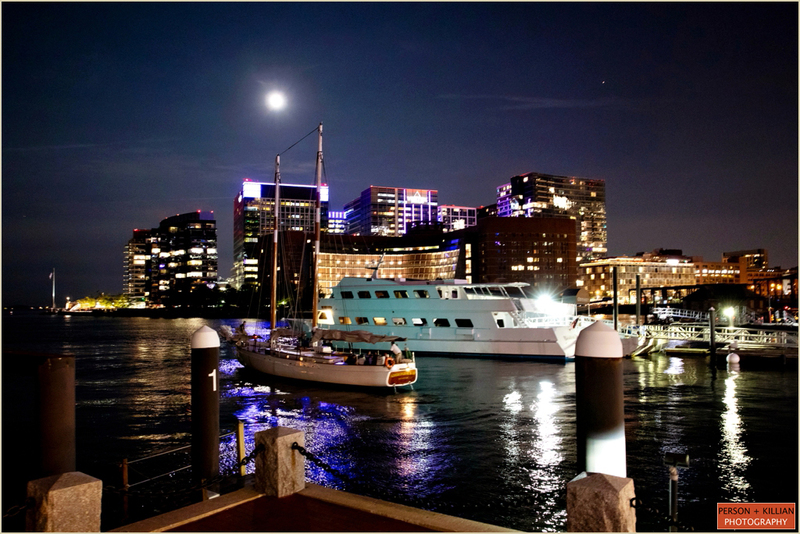 Post filed under Four Seasons Boston Weddings. 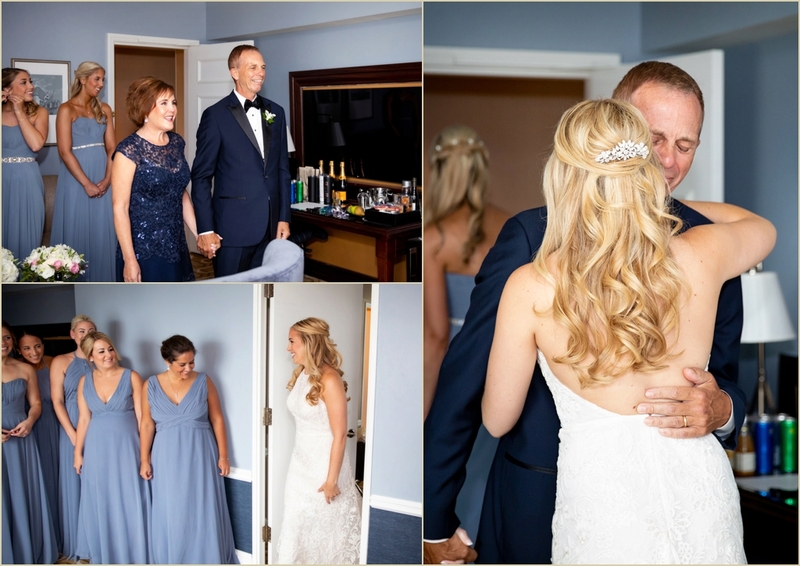 Thank you to Jodi and her team for always being so much fun to work with and for having us there to capture such a beautiful day for the family!